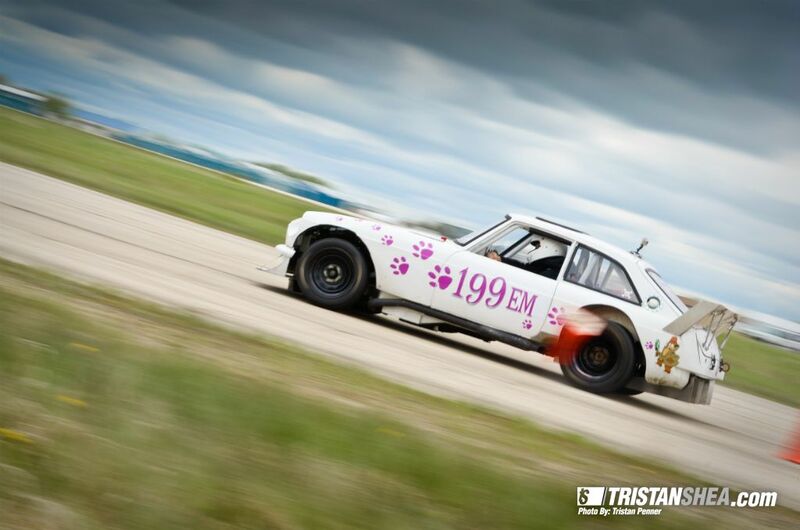 We loaded up the Pink Panther and traveled from to Lincoln, Nebraska for the Pro Solo and Solo Tour event known as Spring Nationals. Because of a strong headwind and lack of towing power, we were down to 45 mph with the heat cranked and windows opened to keep our Suburban tow vehicle alive until we got to Lincoln. 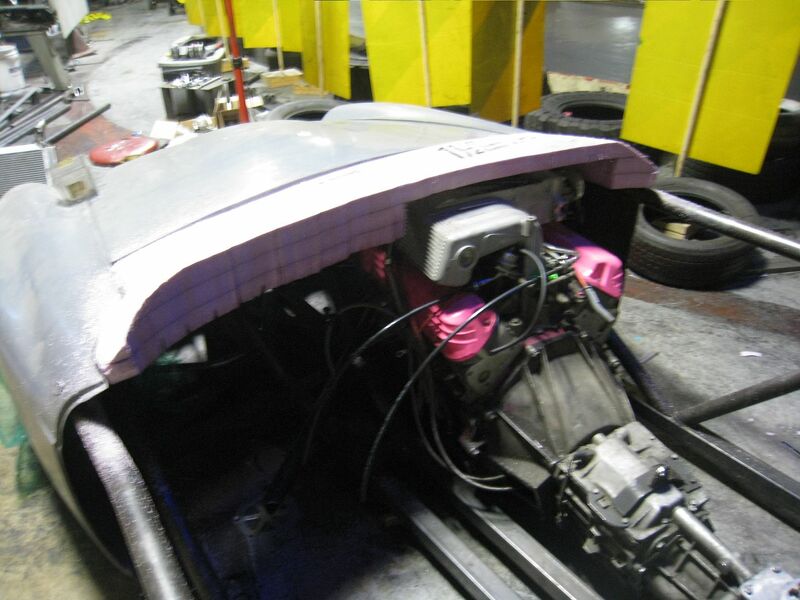 We tested the car last Sunday and everything was fine except after 3 minutes of continuous hard running through a simulated autocross course, the clutch stopped fully releasing. 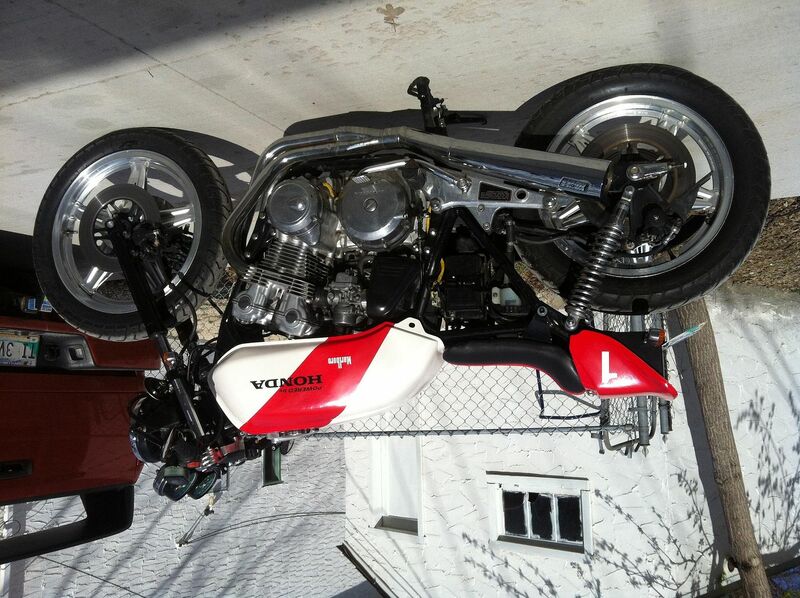 I assumed that I would just have to bleed the clutch and add a heat shield to the hoses and all would be well. 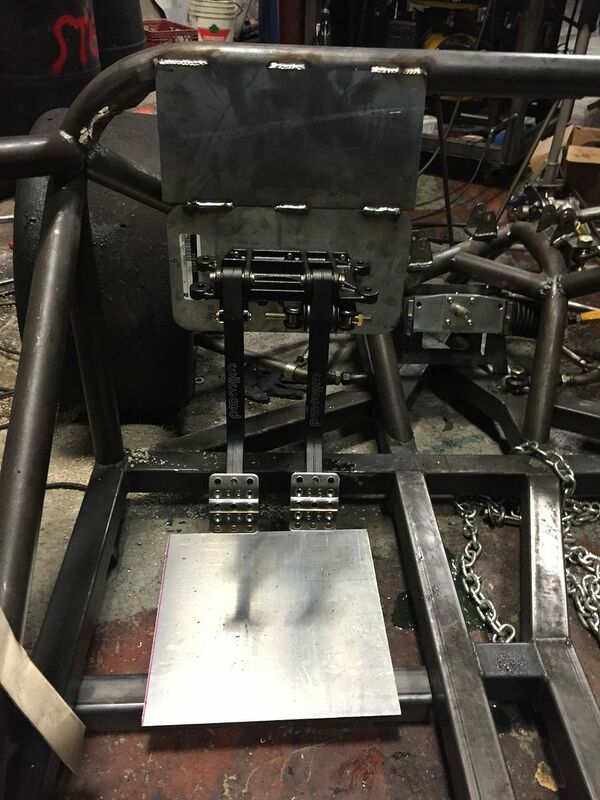 When we unloaded in Lincoln, the problem persisted and made practice launches for the ProSolo very difficult because as soon as I took my foot off the brake, the car would roll through the start lights. 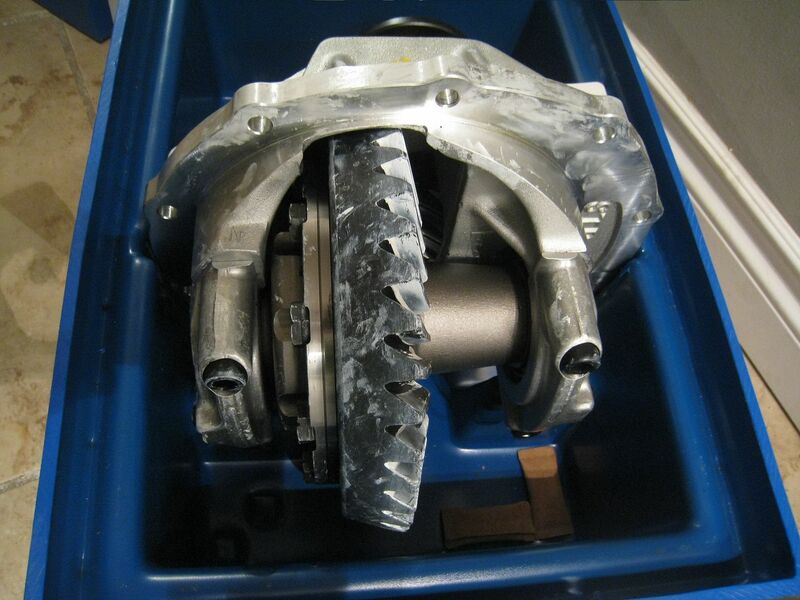 In order to adjust the hydraulic release bearing, the transmission would have to come out. The shifter, drive shaft, seat, tunnel and crossmember all had to come out in order to remove the transmission and finally I could get to the release bearing and adjust it out a little. 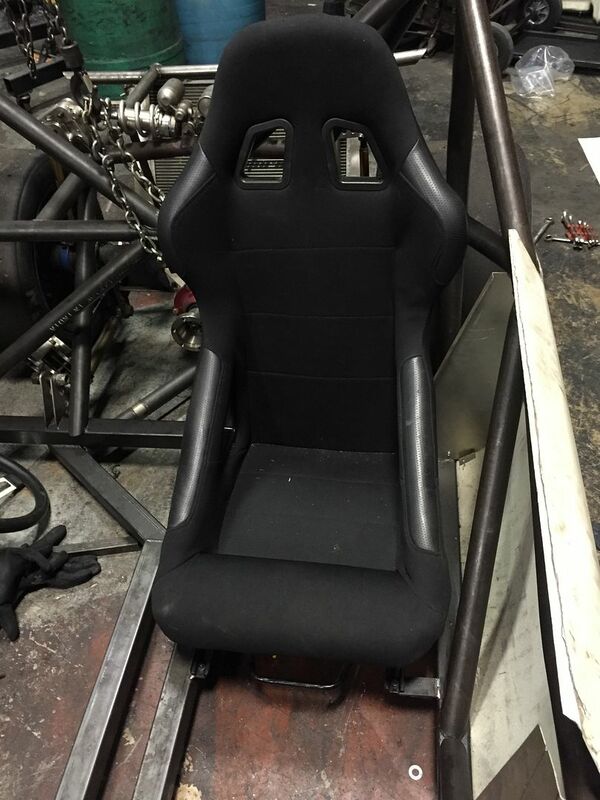 I got it all back together in time for ProSolo practice launches but couldn't do much because we could stage the car correctly but as soon as we took our foot off the brake, the car would roll forward, causing a red light. It occured to me that maybe I could adjust the pedal travel to correct this and amazingly, it worked-except it means that removing the transmission was a waste of time. I went back to do some practice launches and after a couple of 4000 rpm clutch dumps, I snapped a rear suspension mount. Those 14" rear slicks really hook up! Briget and I fanned out in the paddock area asking everyone if they had a welder, none were on site. 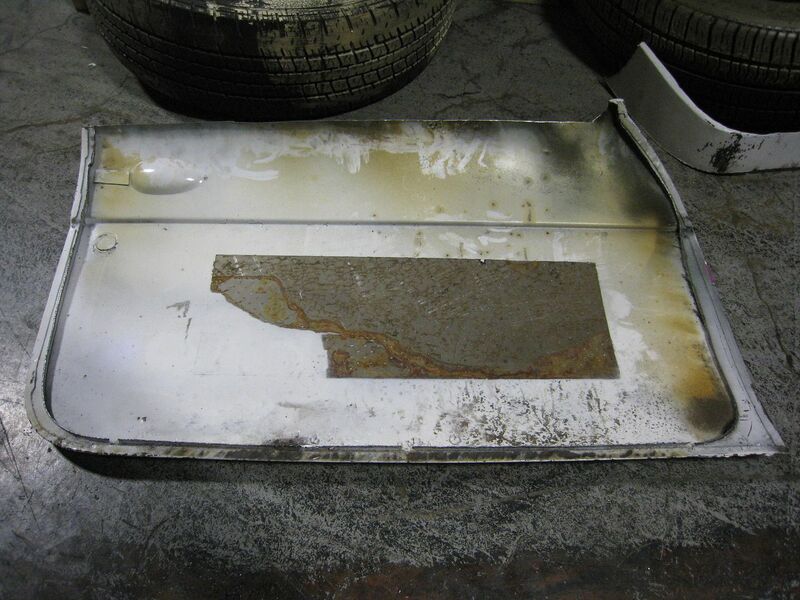 Many calls to local welding shops also turned up nobody that could come to the site and weld my car. 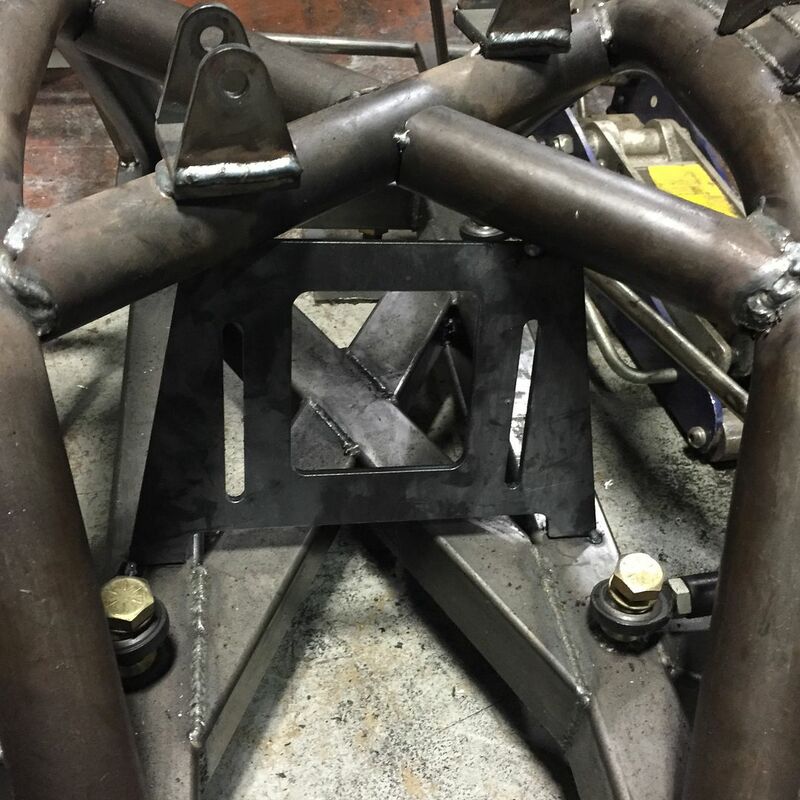 I was forced to drive to Tractor Supply and buy a welder, grinder, helmet and steel for reinforcing the bracket. 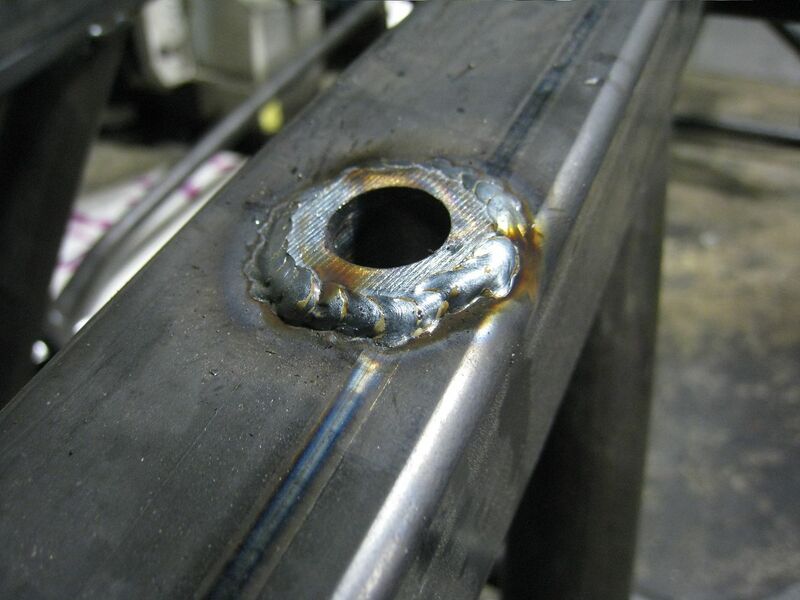 They told me the welder came with a sample spool of wire, what I discovered when I got back to the site was that it was flux core, and I have never welded with flux core. I got the car done but it was too late for running the test course or doing any more test launches, the next opportunity was the ProSolo the next day. Briget was scheduled to run first and was worried about breaking the car, I told her to go for it and not worry about the car. 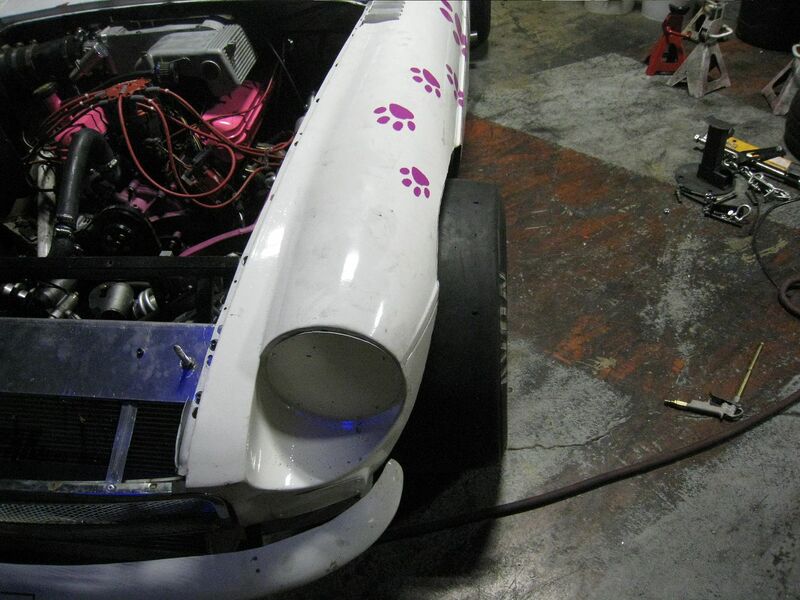 Briget came back from her runs reporting that the car felt fine but was a little understeery. 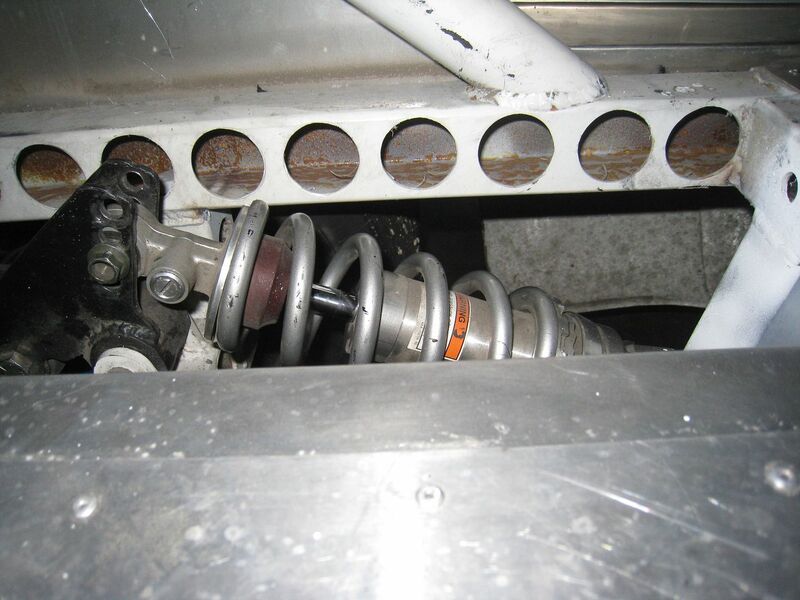 I attempted to correct this by stiffening the rear sway bar but during my runs I was spinning the inside rear tire a lot. Also, Briget got warnings for exceeding the sound regulations but curiously, I received no warnings. 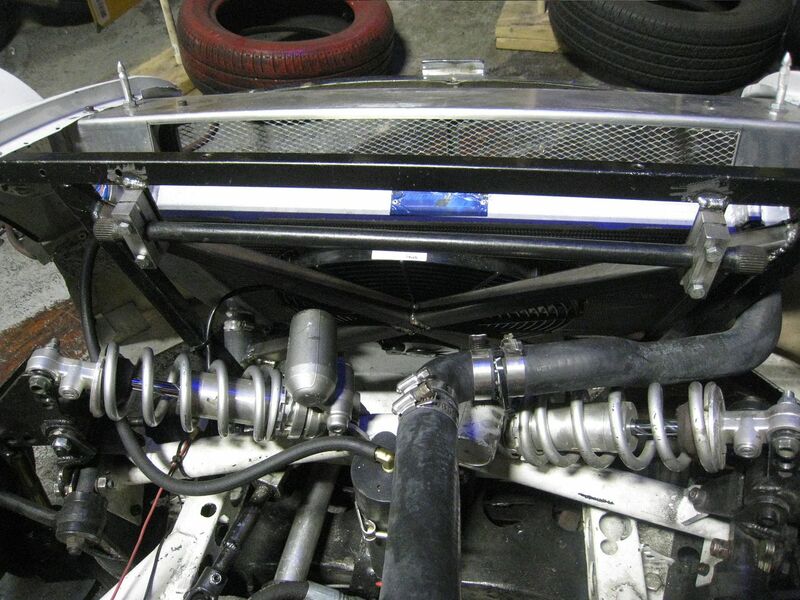 In an attempt to cure the wheelspin, I installed the front sway bar and softened the rear sway bar again. Briget went out for ProSolo session 2 and came back reporting that the car felt better but she couldn't get it to rotate properly. For my second session I tried stiffening the front spring rate and going full soft on the rear sway bar and the car felt better to me as far as wheelspin goes but it could have also been that I was driving better. the Avons were not overheating despite the back to back runs but we were also only pulling 1.3 peak lateral G, which is significantly less than what we should have. We started to notice a strange wear pattern on the outside shoulder of the front tires and pumped up the pressures for the next days runs. I also changed the angle of the exhaust tips from pointing out to pointing in in an attempt to pass the sound regulations. For session 3 of ProSolo, Briget wanted the same settings she had from session 2 so I softened the front spring rate and stiffened the rear bar again. 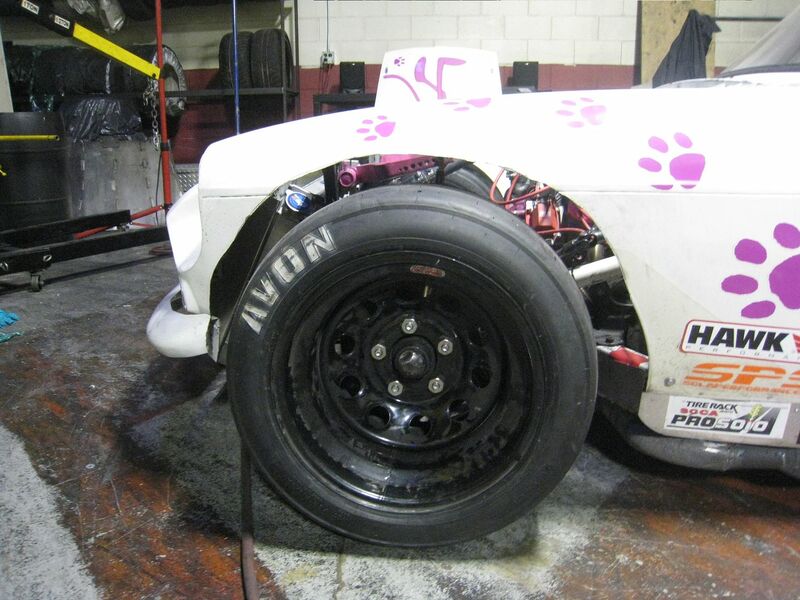 She set her most competitive times yet and the front tires looked a little more normal. I went out for my 3rd session but was late to grid and penalized two runs so I managed only one run on each course. 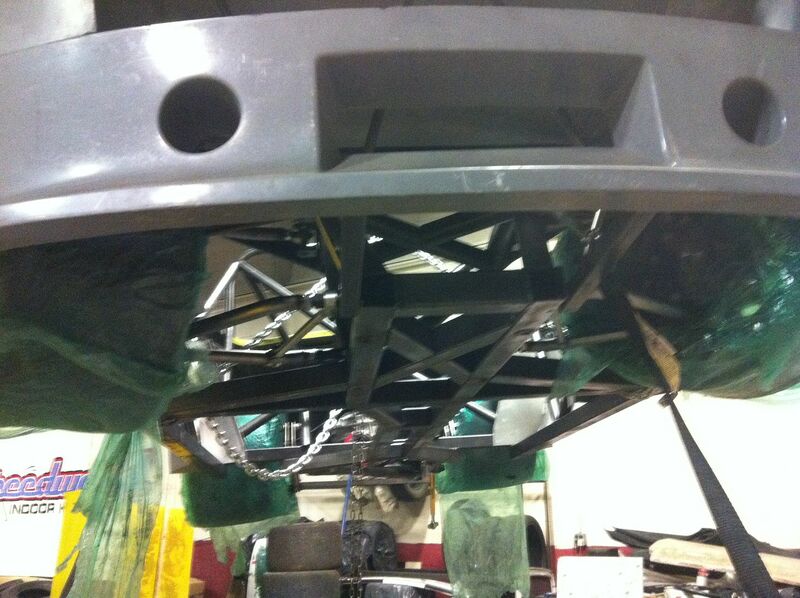 The car still had wheelspin but wasn't hopping around as much in the back so some of the adjustments were working. Briget and I didn't do very well relative to our competition in the ProSolo but the car didn't miss a beat even with 22 hard launches and aggressive runs, which is a victory. 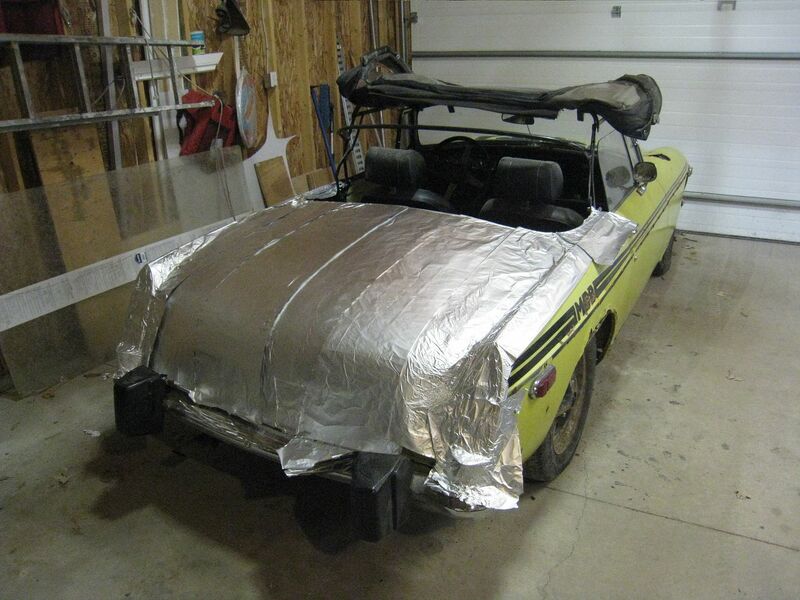 However, the car was still hitting 103 dB on the sound meter and something drastic would have to be done. 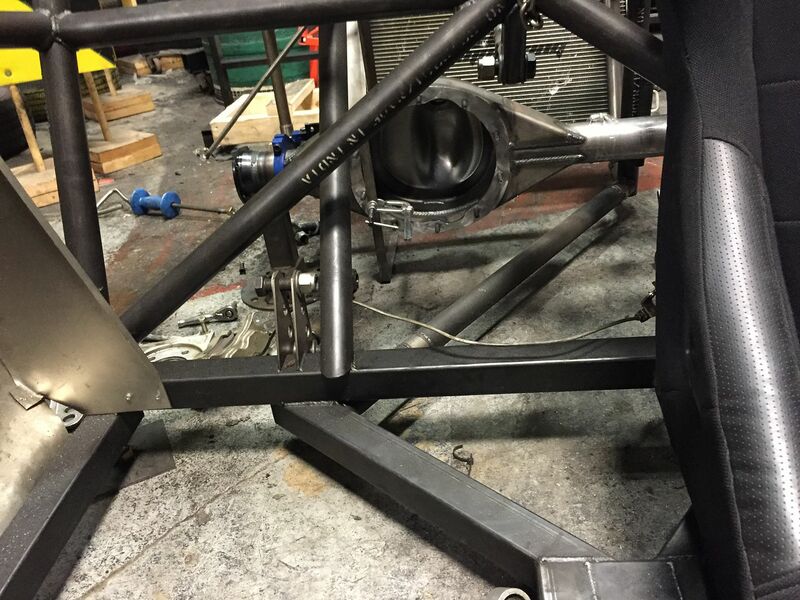 We went to Speedway Motors and purchased two long bullet mufflers and a side pipe kit. 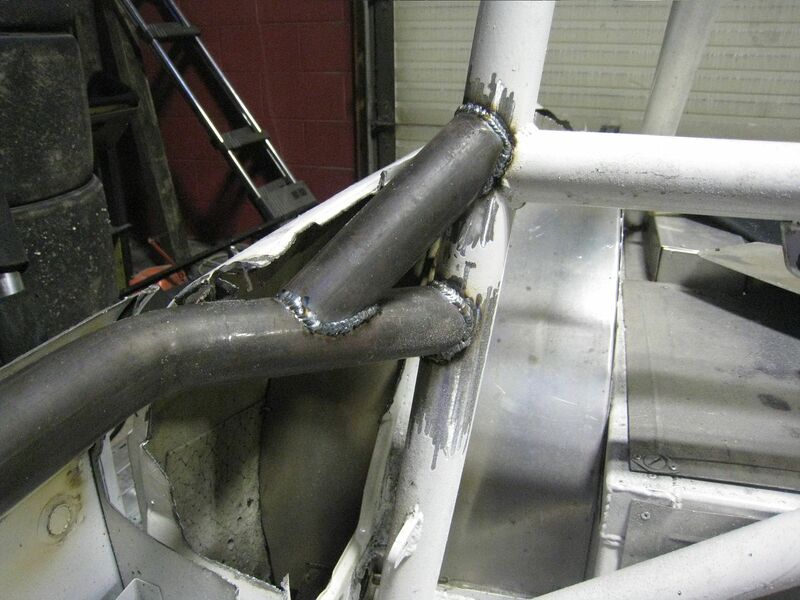 Then I got to use my new welder again and added the mufflers to the current ones I had on the car. This significantly reduced the noise level of the car. Now I could hear the gears in the transmission whining and the rubber chunks flying off the rear tires and hitting the wheel wells. Briget was the first to run in Solo competition and had some trouble steering the car due to an arm injury sustained in a motorcycle crash. 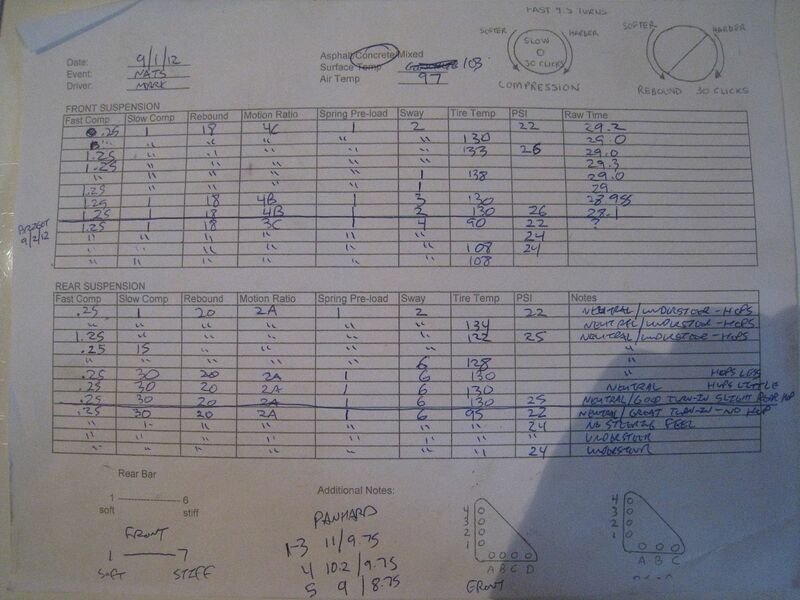 Her times were close to or quicker than her competition but cones jumped out in front of her on her best runs. Also, ambient temperature was now higher than during the Pro and when she came back from her runs, we needed to spray them with ice water. I went out for my runs later in the day when it was even hotter and tire temps were higher than I was comfortable with. I drove very badly and missed critical braking points, losing a lot of time in acceleration zones. I was second last in class by the end of the day, happy that the car was running but disappointed in the results. For day 2 of Solo competition, Briget started out in wet conditions and had her hands full keeping the car pointed in the right direction. This got better for 2nd and 3rd runs but she couldn't dig herself out of the hole she was in from day 1. I had an hour or two until I ran and during that time, several people came over to discuss the car. They all said that out on course, the car appears to go into a positive camber situation up front, causing rollover and tire smoke. I was so caught up with spring rates, panhard bars, high and low speed compression and tire pressures that I forgot about alignment. I was running very little toe-out and only -.5 degrees camber and wondered how quickly I could change these things because I was already parked in grid. I decided to go for it and loosened off the upper control arm bolts and added some spacers to increase camber, which also increased toe-out. 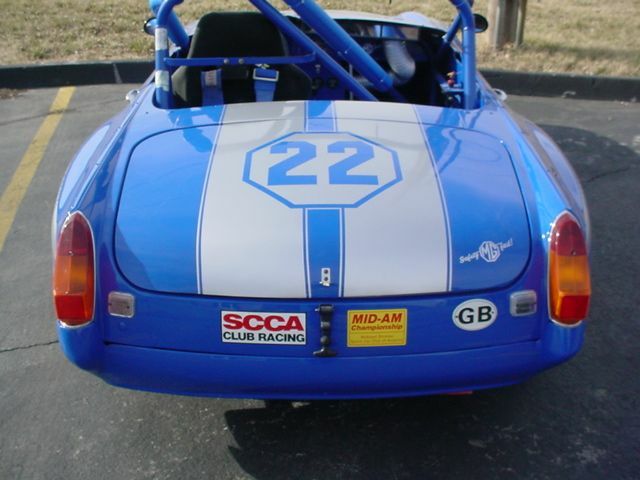 The car responded well to the changes and understeer was significantly reduced, but my driving was still shabby. 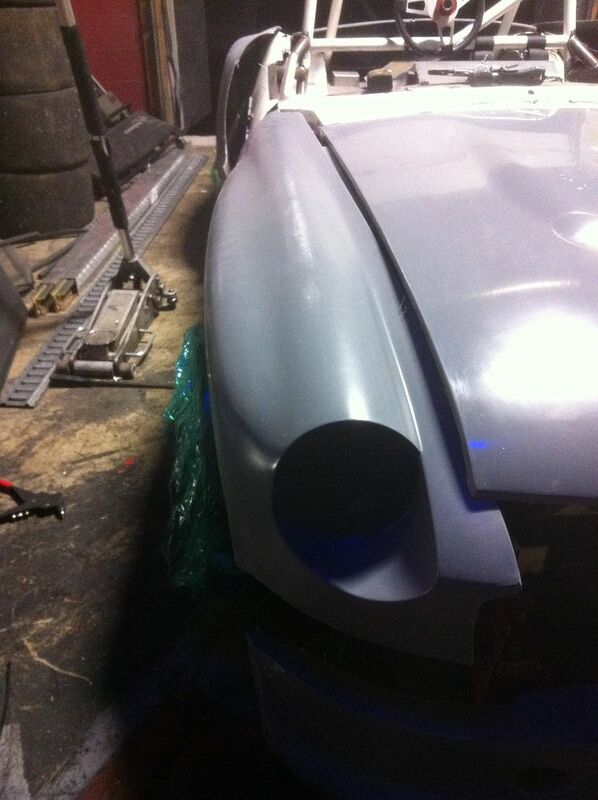 For my next two runs I removed the spoiler and diffuser and tried to be smoother out on course. 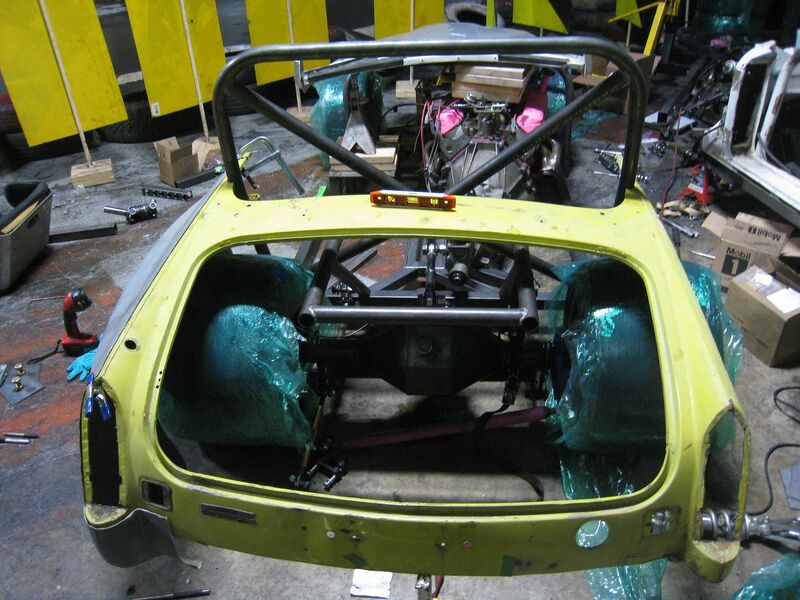 The car was actually a little oversteery in places, which was a good sign that the alignment helped. Plus, the car was hitting 1.38 lateral G. I still finished 2nd last in class and way off the leader but the car held together, felt great and is easy to drive. After a lot of discussion with people more knowledgeable than me, it was determined that I need a wider tire and wider track width up front on the car. I already have a set of wheels that will widen the track width by 3 inches and a set of Avons are on the way, bumping tire size from 10.7" to 12.3". 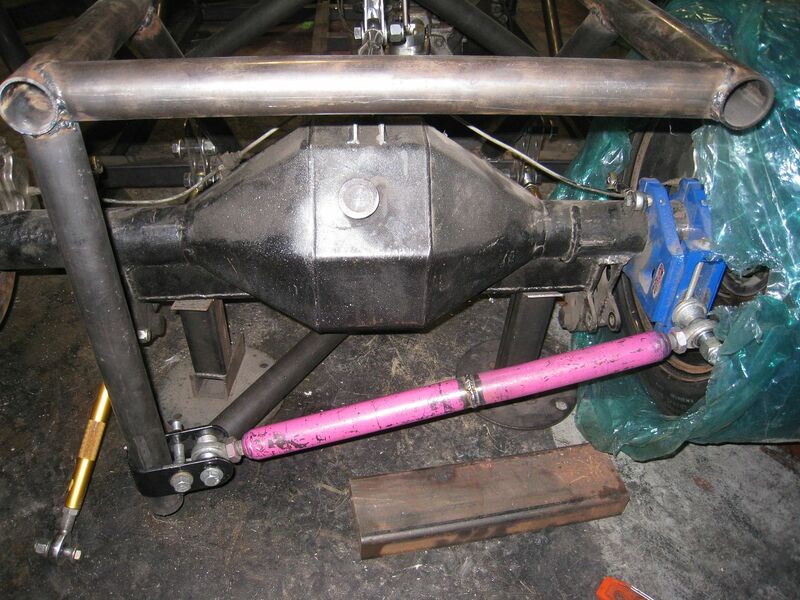 In the meantime, I will continue to play with alignment, Panhard bar, tire pressures and shock settings. While in Lincoln, some other Mod class drivers gave me advice on my car: increase negative camber and soften the rear suspension. I adjusted the camber to around -1.8 degrees and while I was in there, I decreased caster to reduce steering effort and gave it a little toe out. As soon as I went out on track I felt the difference, understeer was completely gone but I was still spinning the inside rear tire. 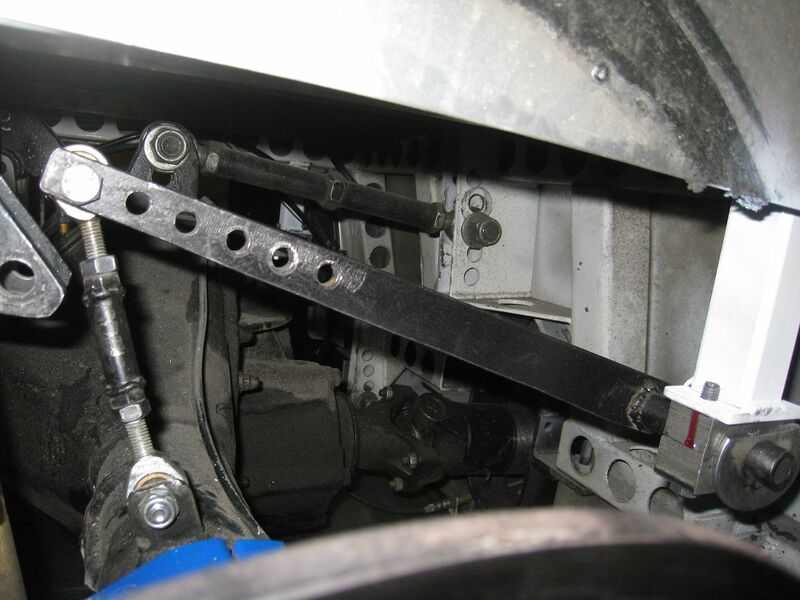 When I installed the rear sway bar, I had to move the center suspension link down one notch. Today I plugged the numbers into the suspension calculator and it told me that this moved my anti-squat from 50% to 88%. 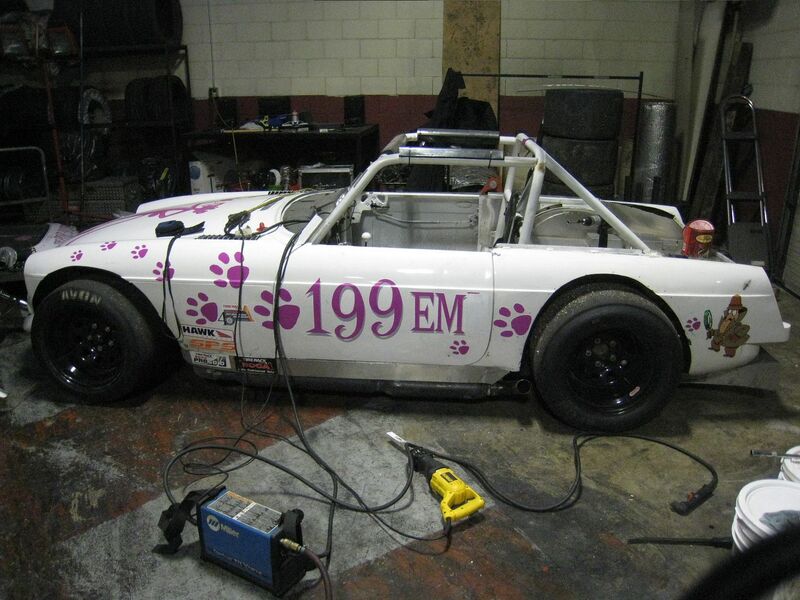 An internet search revealed that in an autocross car, 50% is far better than 88% so I had to find a solution. 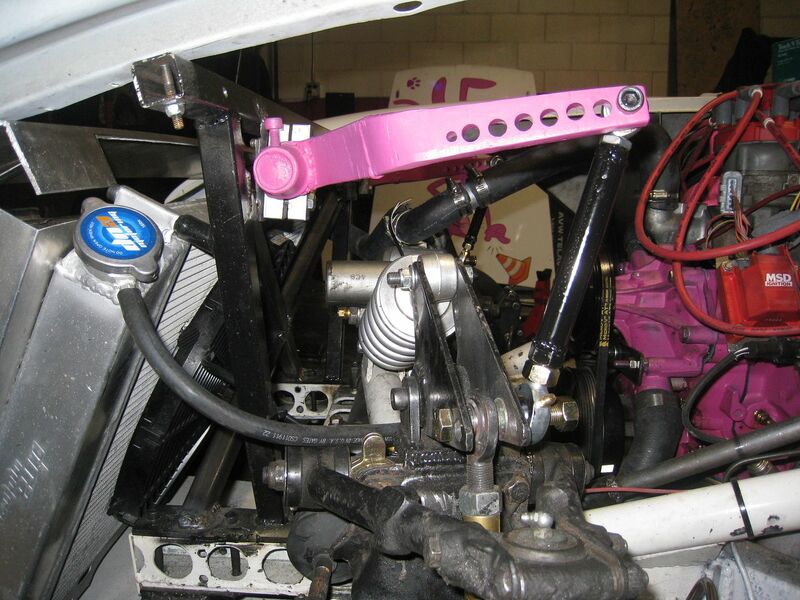 what I did was add an extension to the sway bar mount, lowering it below the center link. 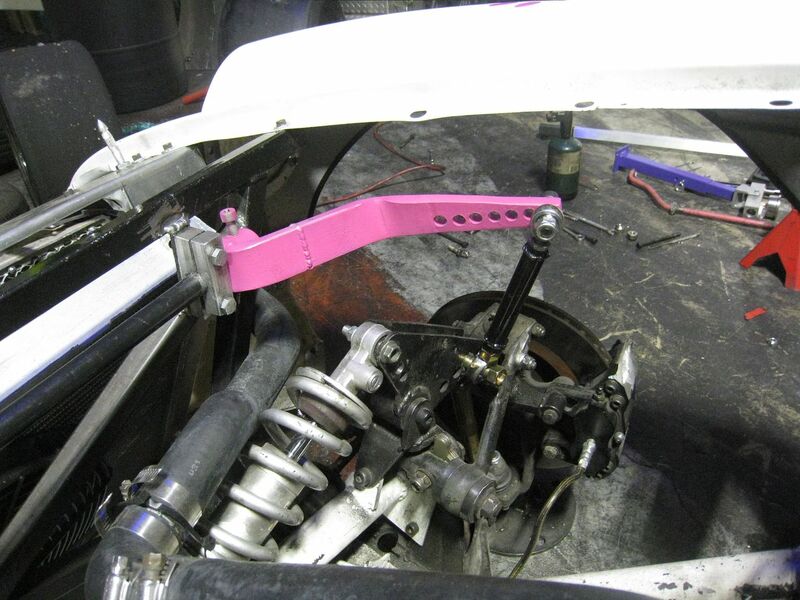 This also allowed me to reposition the sway bar back which cured some geometry problems when the bar was adjusted in it's stiffest position. In this pic you can see the extension on the right and the center link in the background. 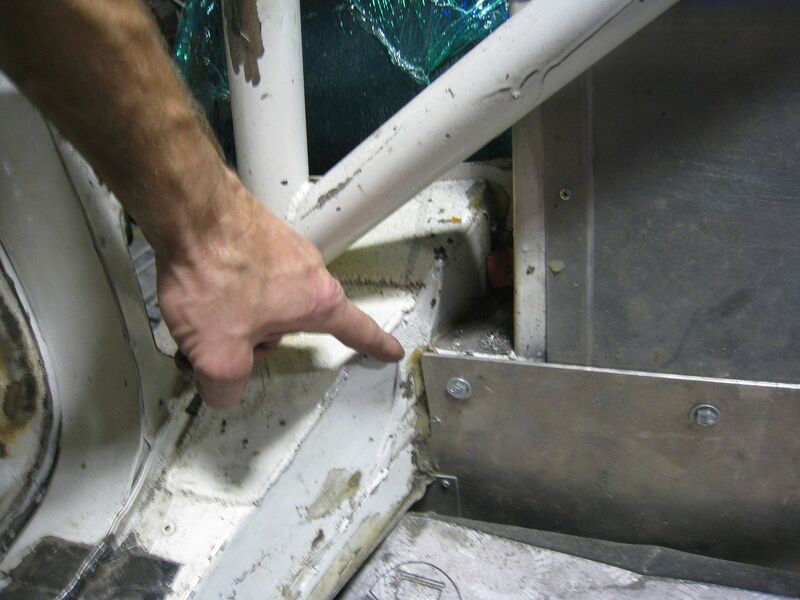 I also attached this slick aluminum hinge that I found at Speedway Motors so no more stick to hold up the hatch! 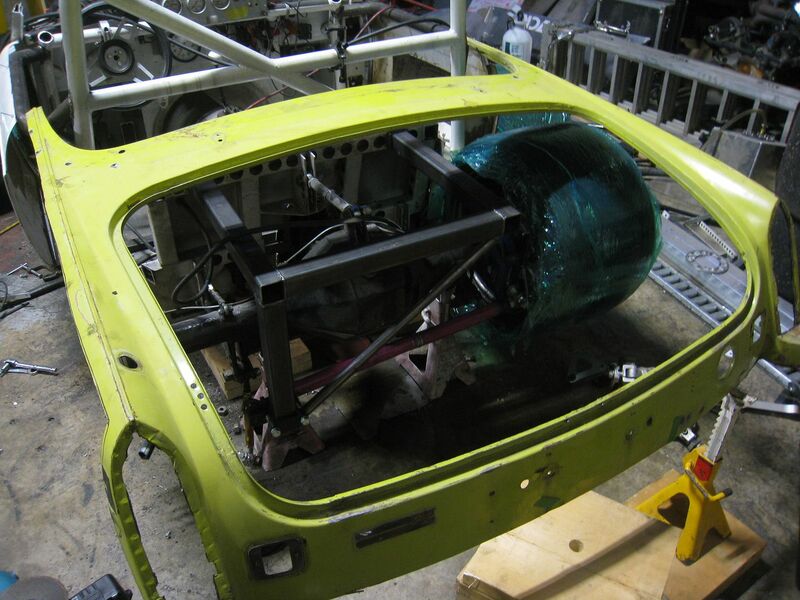 As much as I liked the ram air system I built, it weighed more than necessary and prevented easy adjustments of the front suspension. I pulled all that out and just attached an air cleaner to the mass air flow sensor. 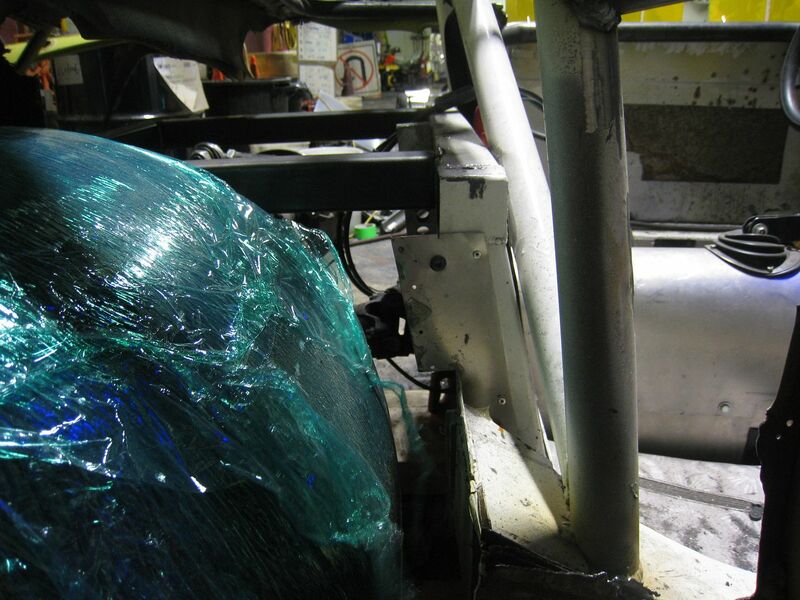 I also added a sheet of aluminum behind the tire to protect the air cleaner from debris (after pic was taken). I haven't made any significant changes to the car so I haven't updated this thread but people have been asking so here is an update. I did the math on how many runs the Avons would have by the time we got to Nationals and they would be pretty used up by then so I slapped on a set of old Hoosiers. 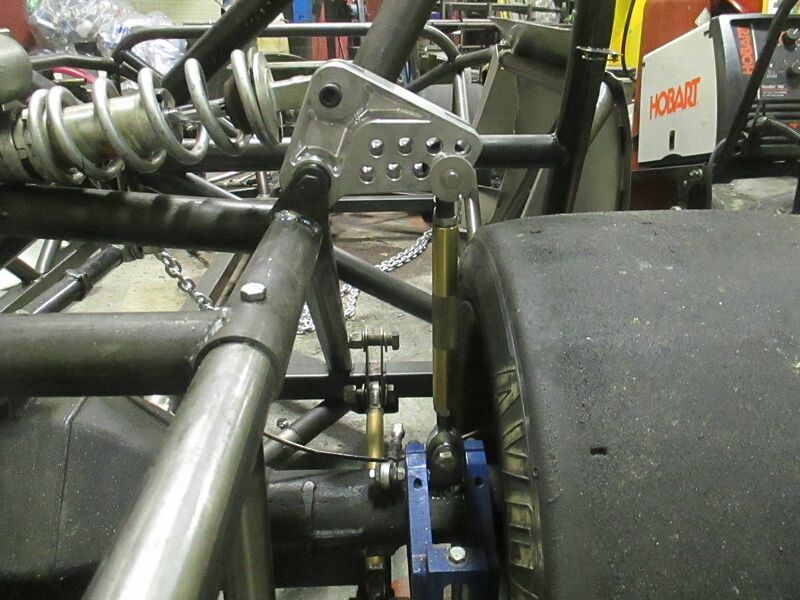 The Hoosiers are radials and the Avons are bias so there is a big difference, and since I plan to run wider front tires for Nationals, I used the same size on the front as I did on the rear (going from 10.7" wide fronts to 13" wide). I know I should be running the exact same tires I am going to run in order to set the car up but I don't have the budget to run two sets of new tires per year. 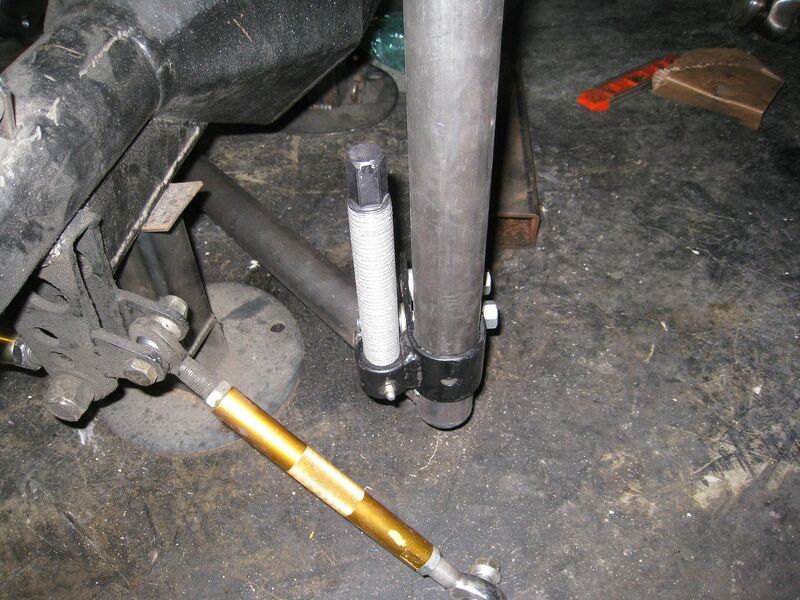 I also lowered the front of the top link of the rear suspension to move my anti-squat from 22% to 44% anti-squat. This was done to improve my launch at the start of the run because I felt I was losing a lot of time with wheelspin. 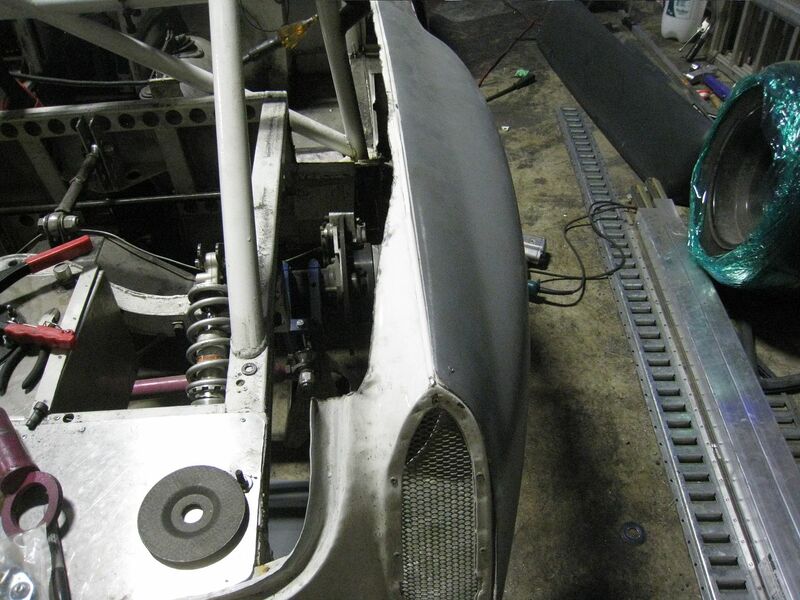 At the last event I was scraping the sidepipes on the pavement in some high G turns so I reduced the body roll by raising the roll center at the rear of the car by one inch. 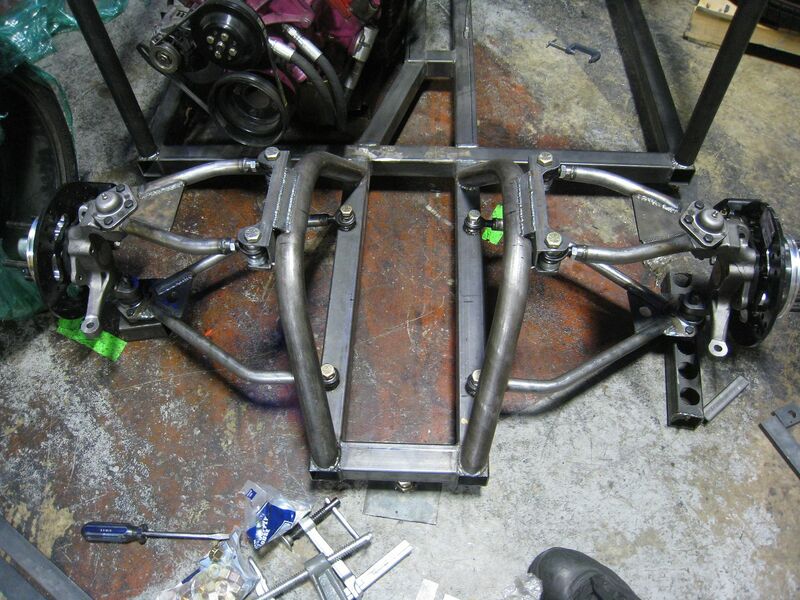 I did this by raising both sides of the Panhard bar one inch. I expected this, in conjunction with the wider front tires, to make the car oversteer. And oversteer it did, anybody watching my first run watched me wrestle with the car to keep it straight. 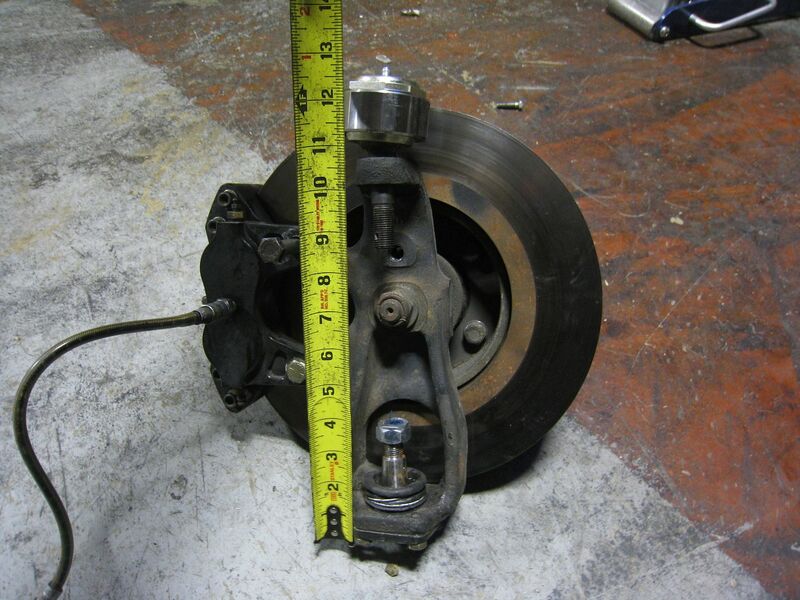 I lowered the axle side of the Panhard 1/4" and tried again, it was better. 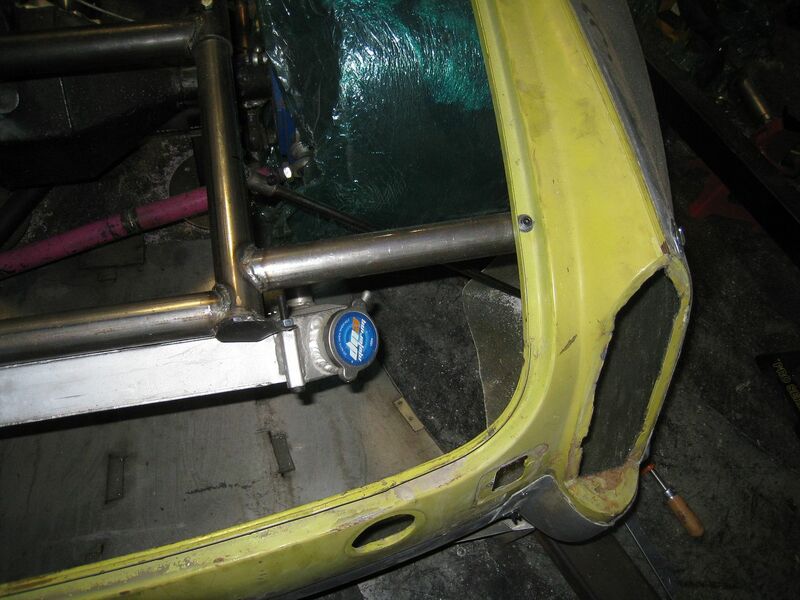 I continued to lower the axle side of the bar 1/4" for each run and by the end the car felt pretty stable. I ran some laps around the Gimli road course and the car was huge fun. 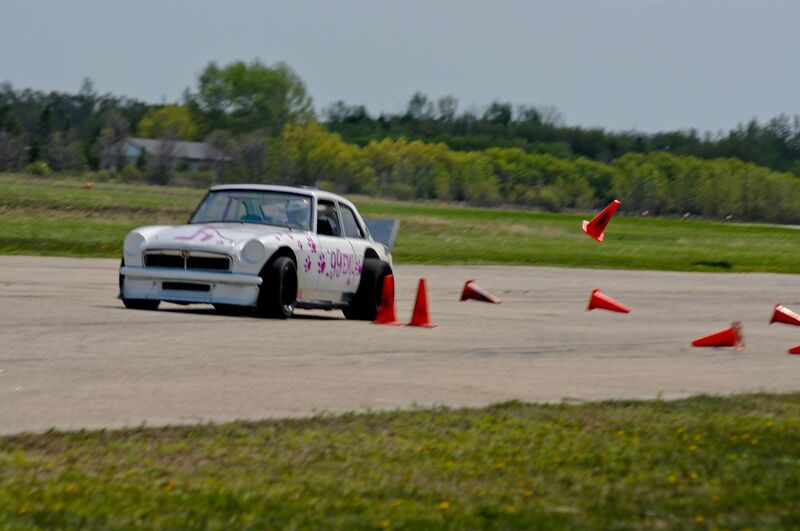 My autocross set-up makes the car feel pretty alive at 100 mph but it didn't do anything surprising or unexpected. And the couple of times I got on the gas too early and the back stepped out, it came back with a small correction. 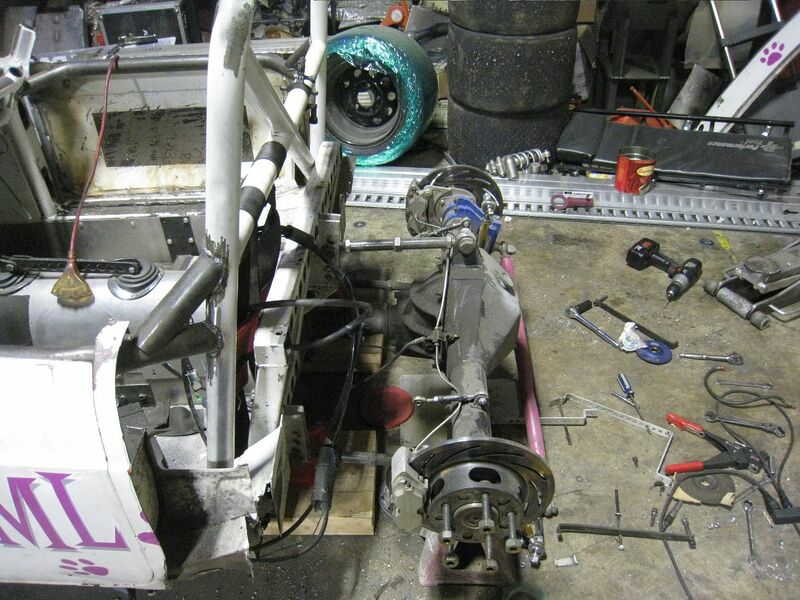 I have new, wider front tires for Nationals and to avoid the chance of oversteer, I needed to change the front sway bar. I had a non-adjustable one on there before and I wanted an adjustable one but buying a custom made bar was out of my budget right now. 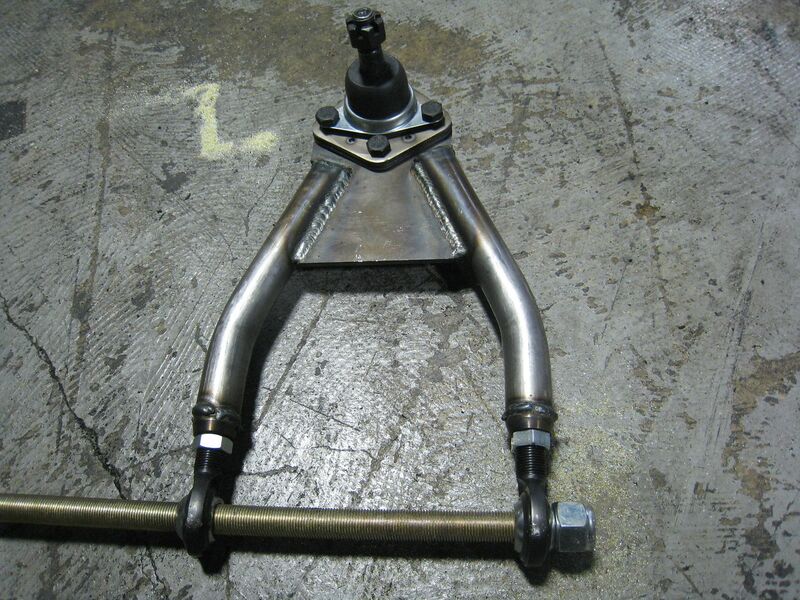 I had some Porsche 911 torsion bars kicking around and it occurred to me that I could maybe use one as a sway bar. 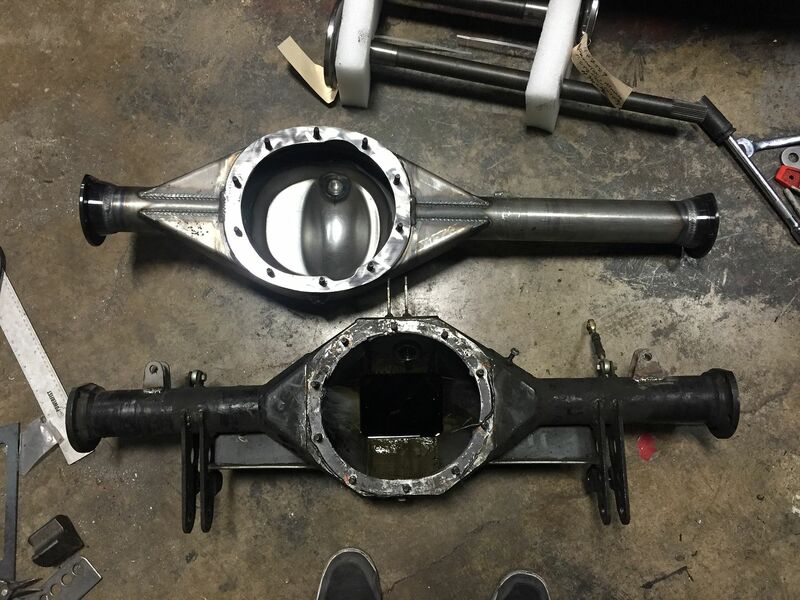 The beauty of using the 911 torsion bar is that there are a wide variety of sizes available and any one of them will slide right in if I need to change the stiffness. 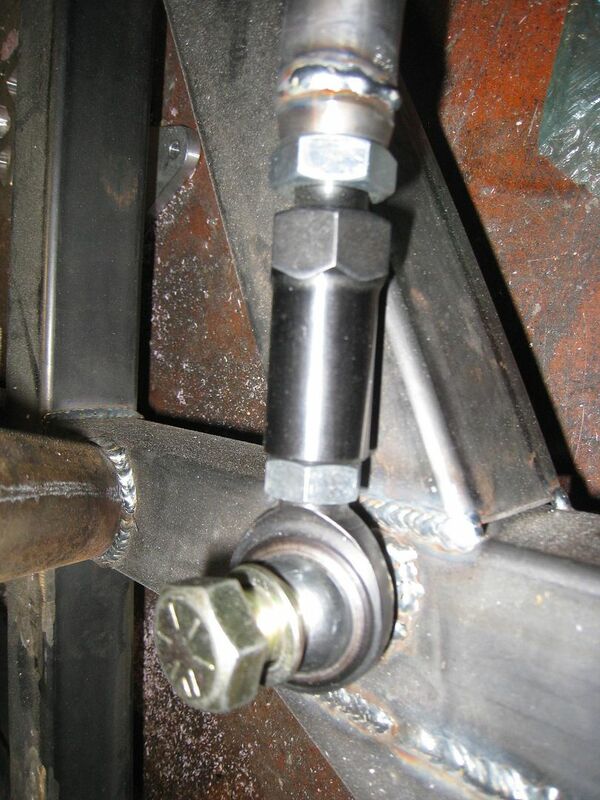 And the drop link attached to the bar at the top and the rocker arm at the bottom. 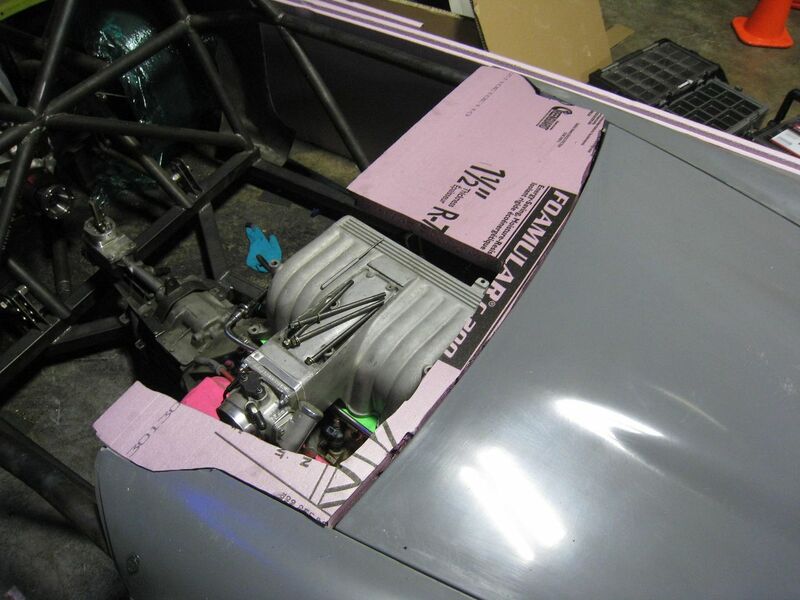 The car will be for sale after Nationals (or before if the offer is right) so if interested, see me in Lincoln. The new front tires are an inch taller than the Hoosiers and two inches taller than the Avons I ran at Springnationals. And with our local venue being smoother, I can run a lower ride height, which meant that some fender trimming was in order. I started by jacking up the opposite rear tire off the ground to compress the front then I marked the fender about 3/4" higher than the tire and trimmed it all around. I turned the tires full lock in both directions and I really hope I trimmed enough to keep the tires from getting cut. In the end I landed up 9th out of 15 drivers and I think a trophy was within my grasp except I didn't drive well enough on the East course. I walked it 4 times and I guess it wasn't enough because things kept coming at me faster than I was anticipating and I overcooked some elements. 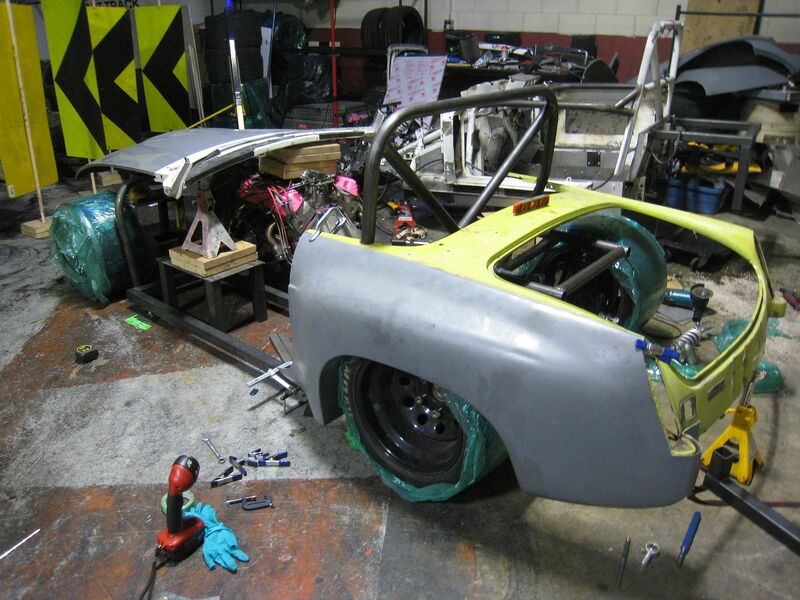 Still, it's obvious that with some further development the car will be in the hunt for some hardware. Dropping 400 lbs to get down to the class minimum would be a good place to start. 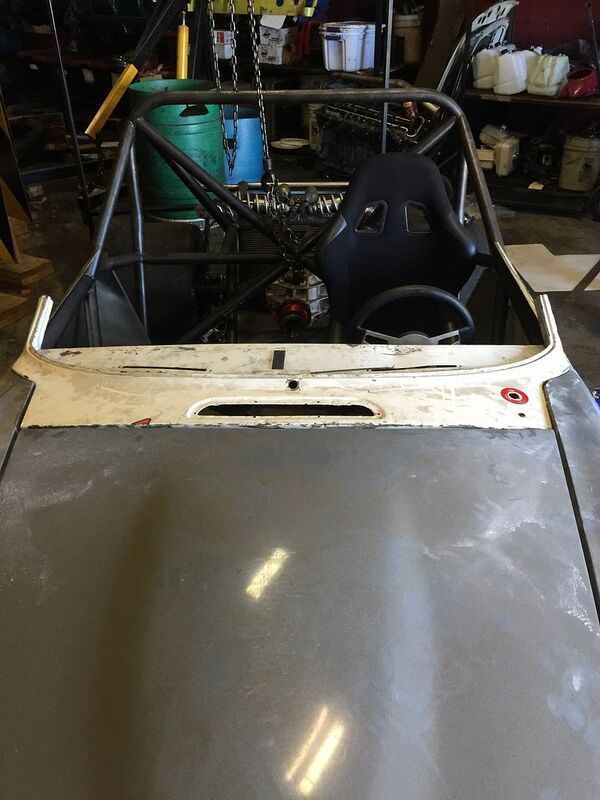 When I cut the top bars out of the roll cage, the car sagged in the middle, check out the picture of the body line where the door closes. I fixed this by welding in reinforced door bars. Without the need for doors that open and close, I was able to cut out the door handles, latches, hinges and door structure. 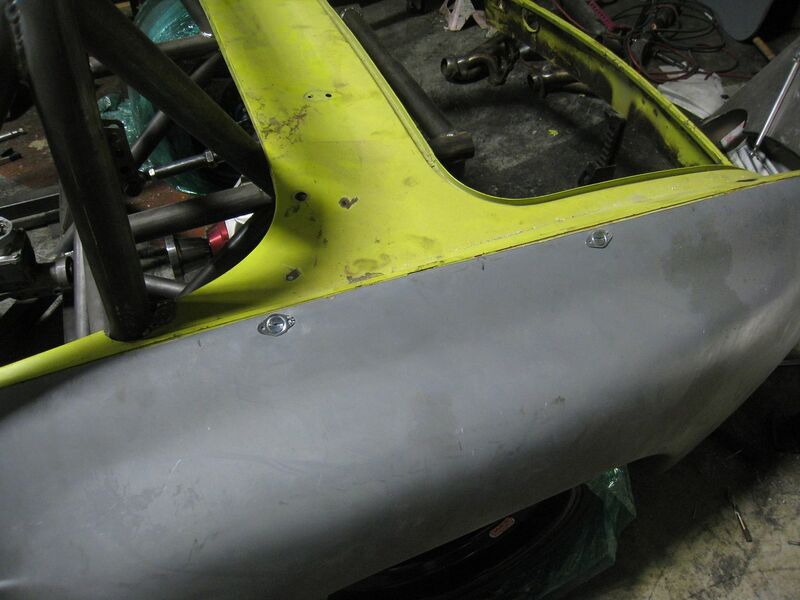 I couldn't believe how much all that stuff weighed, and am now left with just a door skin which rivets to the door bars. 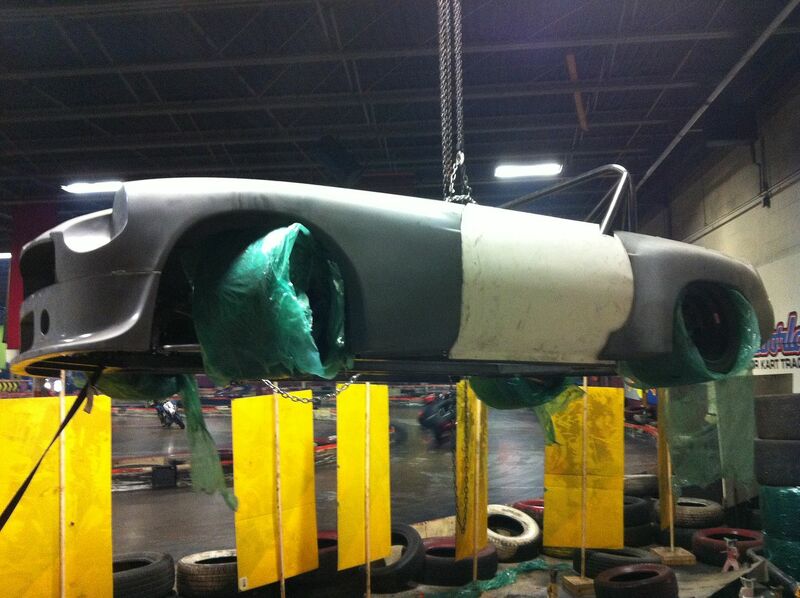 I picked up the fiberglass panels for the car today. The 4 fenders, boot lid, hood, valance and air dam together with the boxes they came in and packing weighed a total of 75 lbs!! 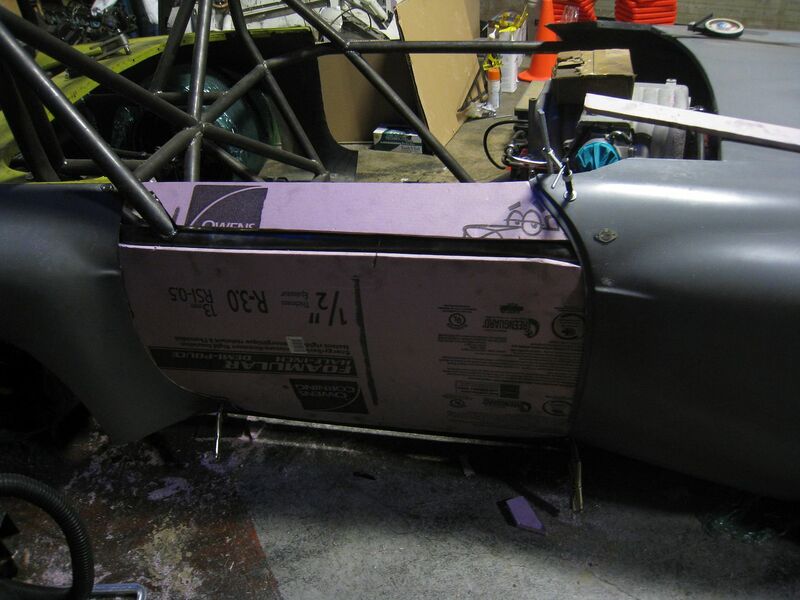 The panels are beautiful and well done but I gave a quick test fit on the car and it's going to take a lot of work to make everything fit right. It's not the fault of the Spridgetech but there are some big differences between my heavily modified GT and an unmolested roadster. 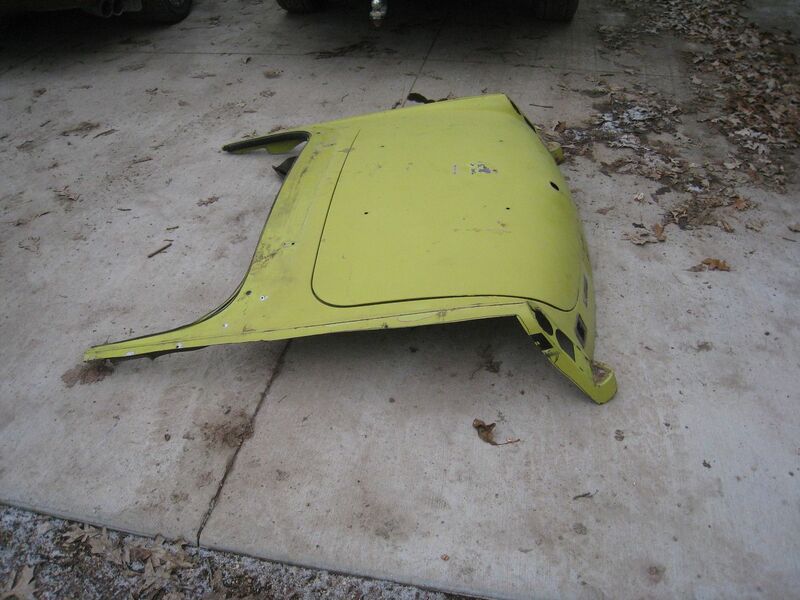 First off, the front fenders of a GT must be different than roadster fenders because the profile where the fender meets the cowl area is completely different and is going to be tricky to match up. 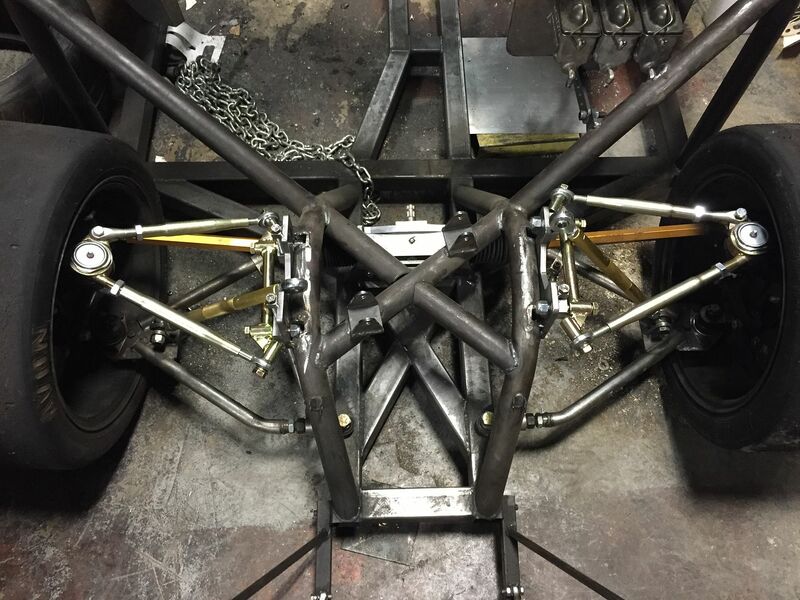 Also, to allow the old V12 to fit behind the front crossmember, I moved the entire front suspension forward 2 inches and moved the rear suspension forward the same amount in order to keep a 91" wheelbase. This was all fine because I was cutting away metal to clear the tires anyways. 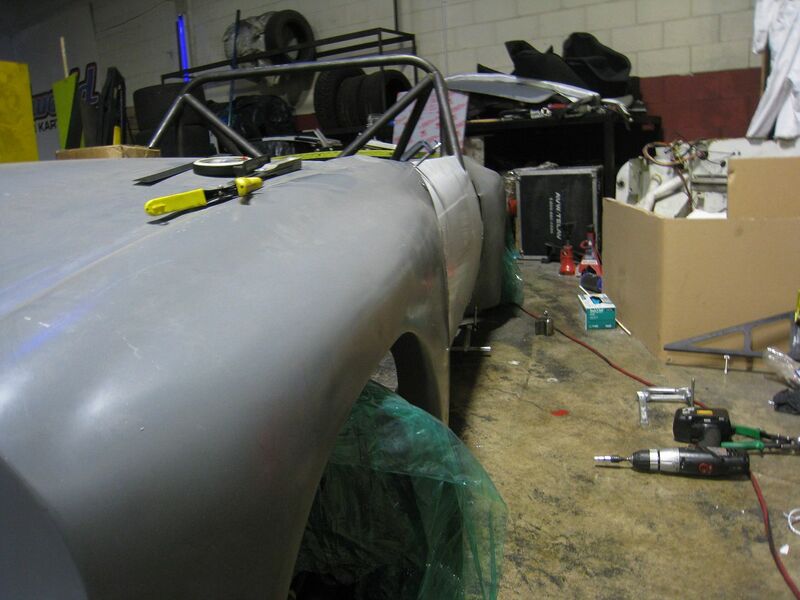 But with the new fenders, the tires are no longer centered in the wheel opening and would look funny, so the whole front and rear suspensions will have to be moved back 2 inches-ouch!! 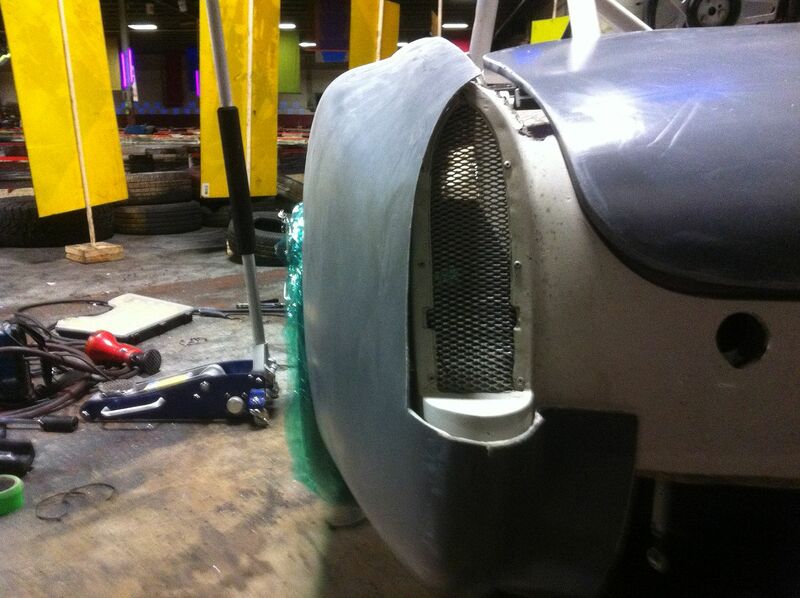 I cut away all unnecessary material for the rear fenders and attached them temporarily with rivets. It turns out that the tires still stick out the side by an inch. 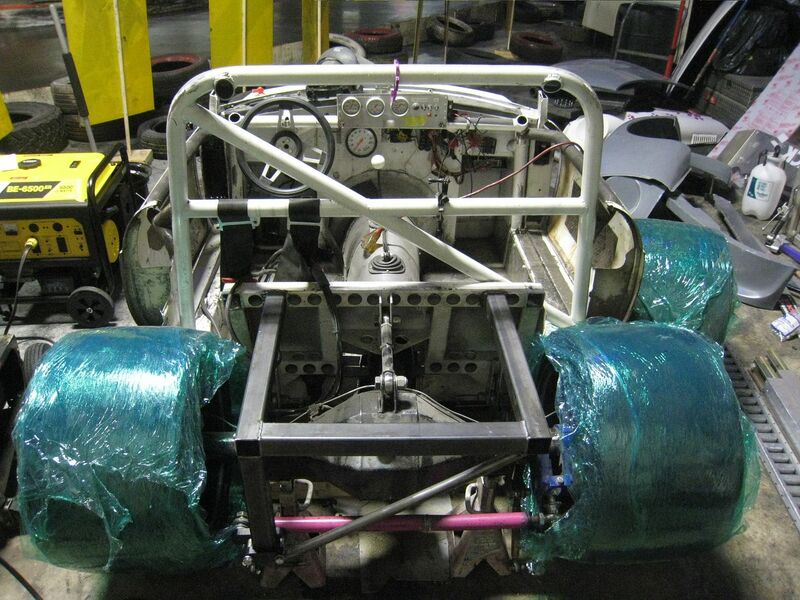 If I want the fenders to cover the tires, I need to a) Run narrower tires b)Narrow the track width which would involve moving frame rails or c) Widen the fenders. 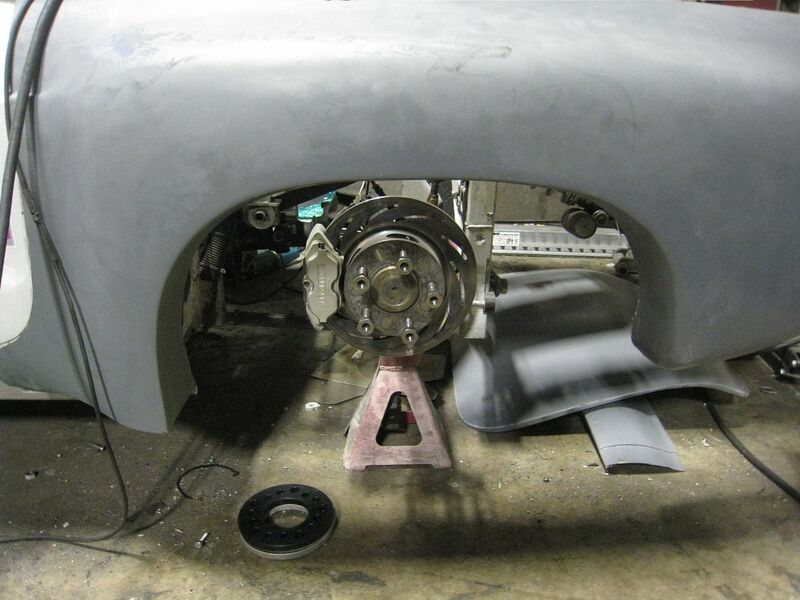 I really don't like the idea of trying to widen the fenders because the risk of them becoming ugly or heavy is too great, so I am going to widen the whole car by 4 inches. 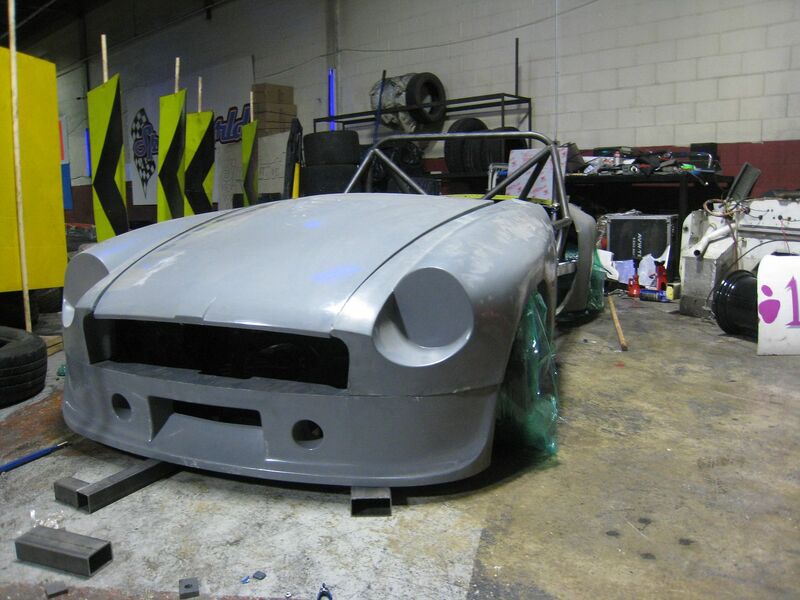 That's right, each side of the car will be moved 2 inches out, which means the front spoiler and hood will have to be widened but that will be much easier to do than slicing and dicing the fenders. If you take a look at the first picture, you can see a lot of unnecessary steel. 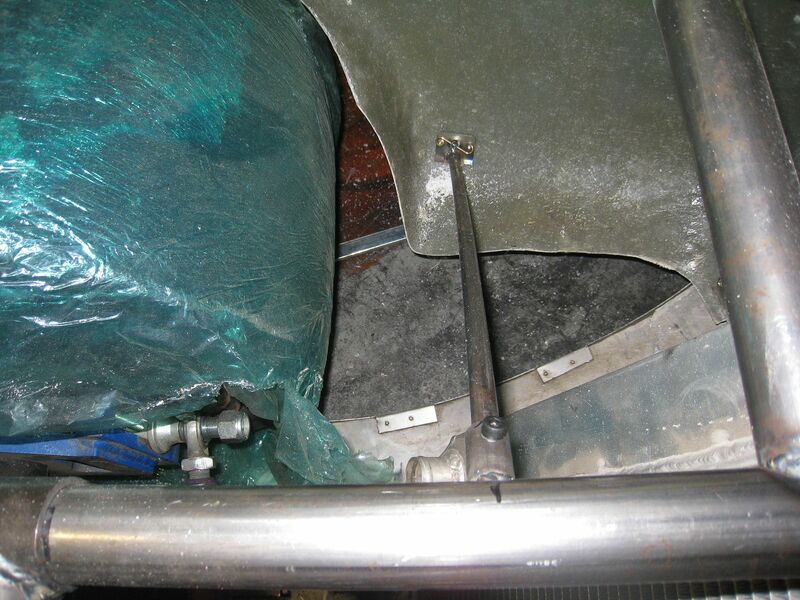 There are thick steel tubes going all the way to the back of the car and two crossmembers (one of them curved and extra heavy). 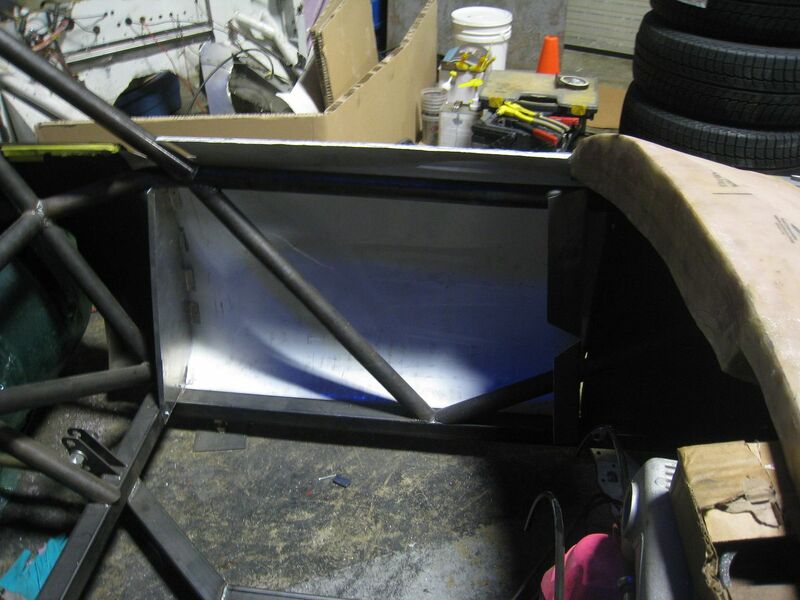 So, I cut all that away and redid it with a thinner wall tubing because the rear bodywork will all be held up with aluminum and the shocks will be rotated so they mount to the top of the rear frame. 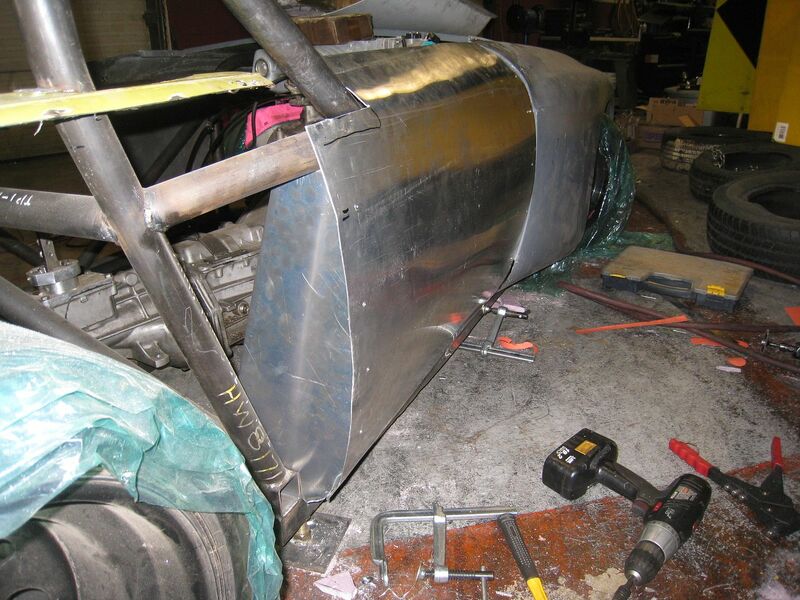 I still have to weld the down tubes between the roll hoop and the new frame. 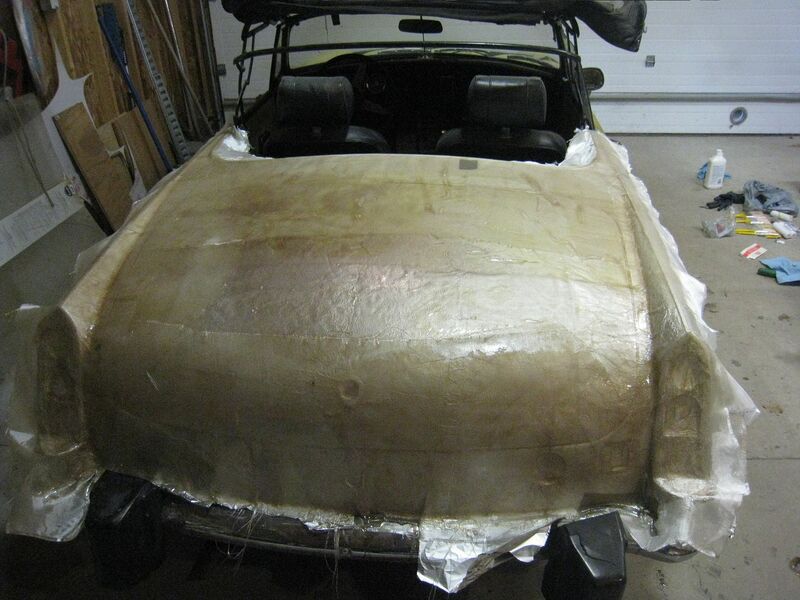 Paul from Red Bearing Auto Repair sold me the back half of an MGB convertible to use on the Pink Panther, but before cutting it off, I made a fiberglass mold. 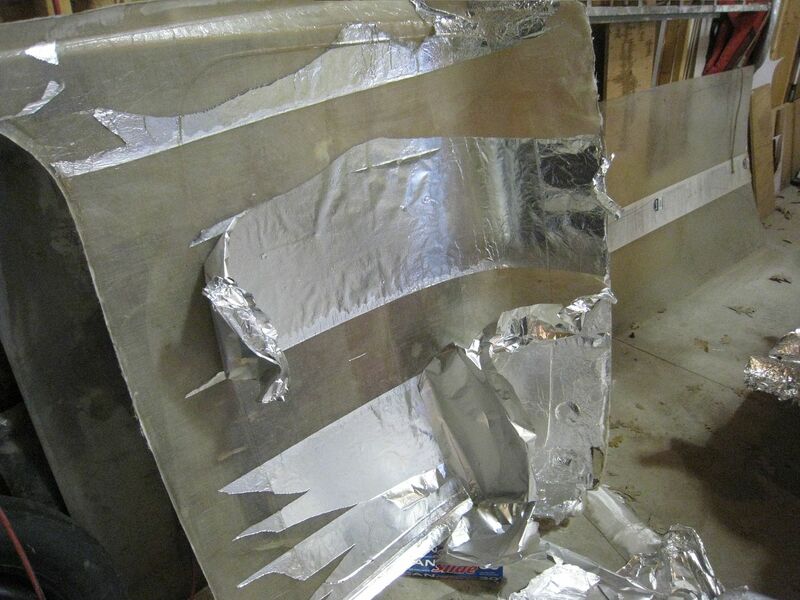 I started by laying out the non-stick aluminum foil on the car, which conformed nicely to the contours. Then laid out fiberglass weave. I had never done this before and made the mistake of trying to do it in big pieces. I should have cut it into smaller squares. 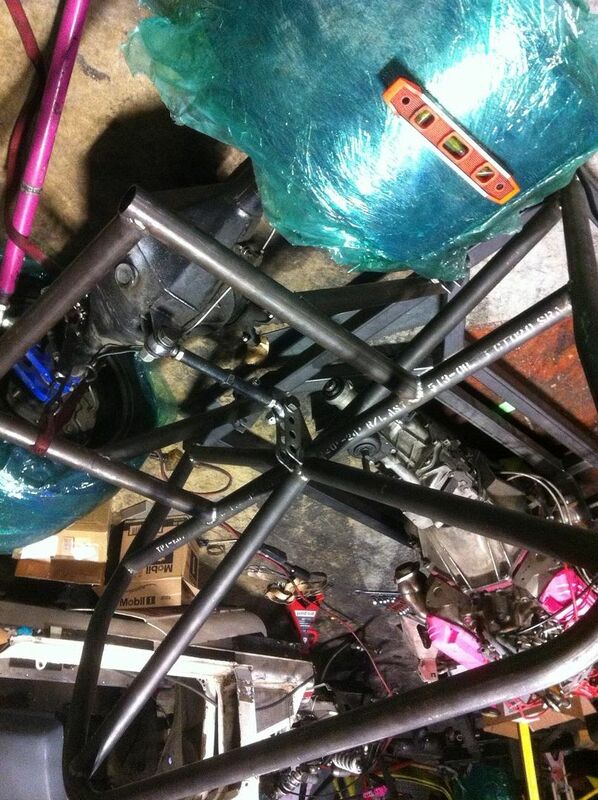 To give you an idea how things can spiral out of control, I submit the following tidbit of the Pink Panther build. 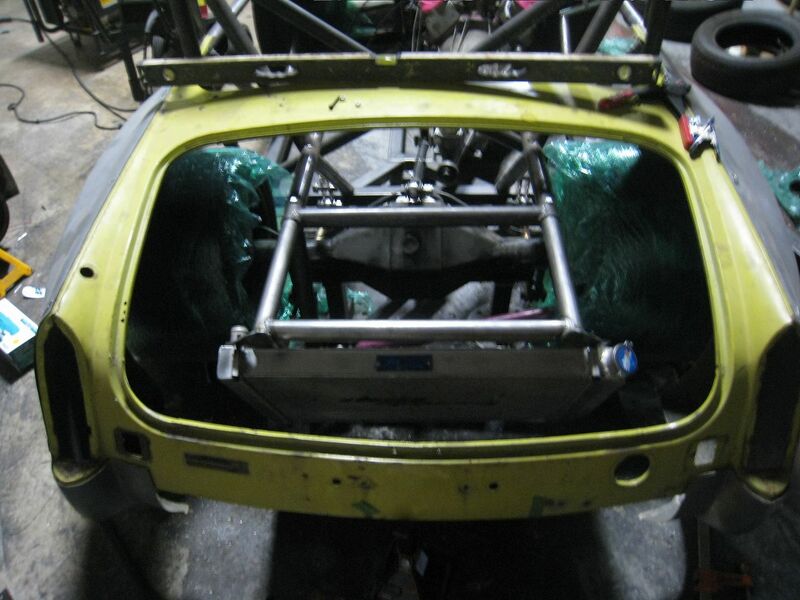 I was pushing down on the new rear frame and it moved up and down quite a bit. And I realized that the flexing was coming from this area. 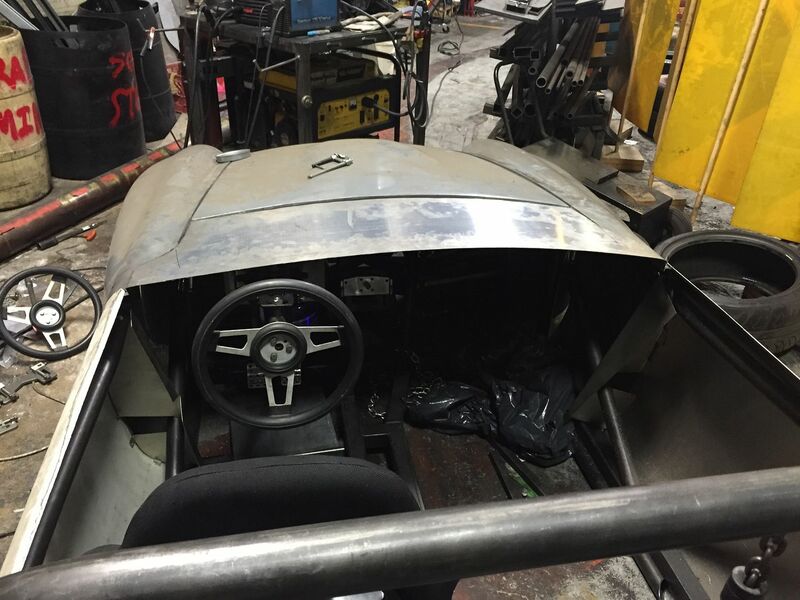 This is a shot of the inside of the car, passenger side, and it's a thicker steel piece from the original MGB frame. Right behind where I am pointing is welded the 2x4 frame rail. 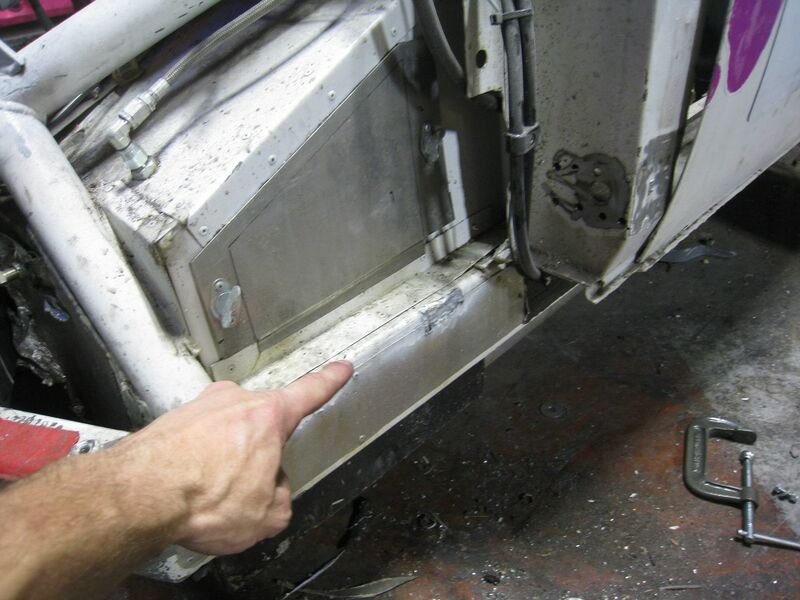 And this area where I am pointing is where the rear crossmember is welded. 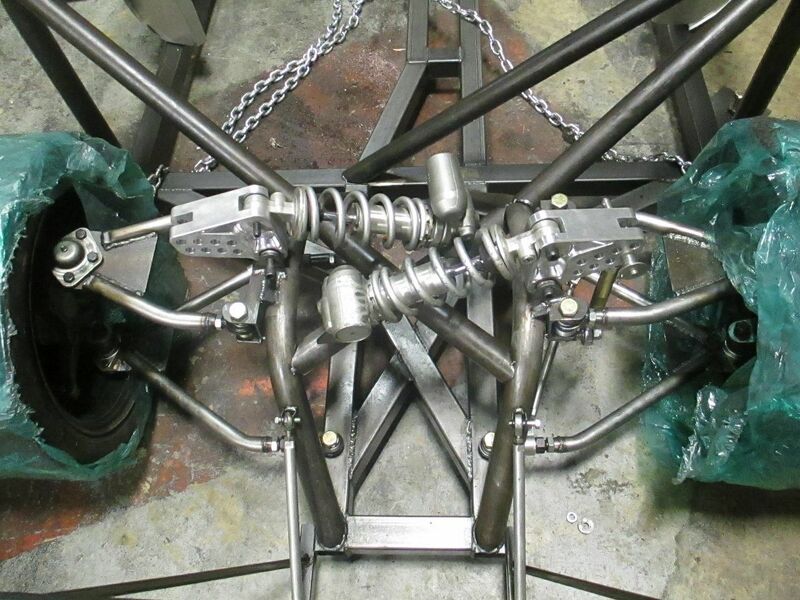 It's the same crossmember that the entire rear suspension is bolted to. 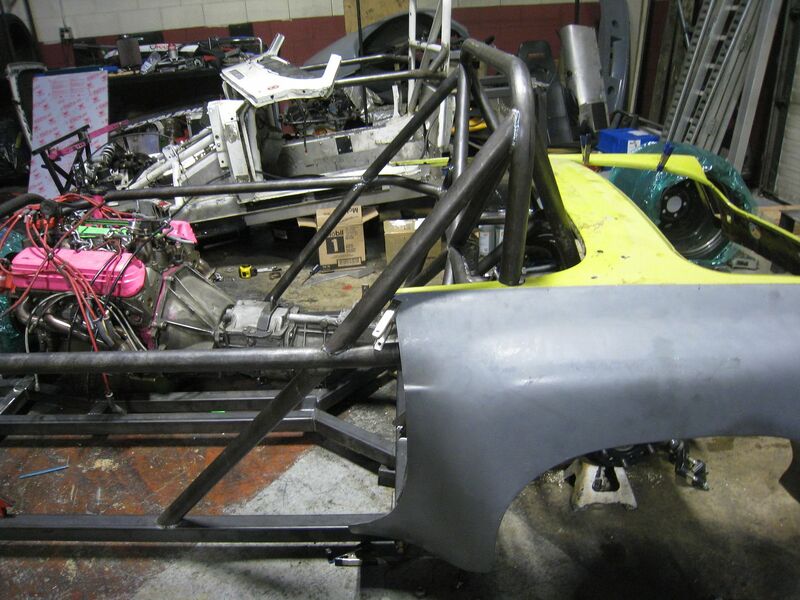 As it turns out, the rear frame was only really held in place by the tubes going from the top of the roll hoop down to the back. 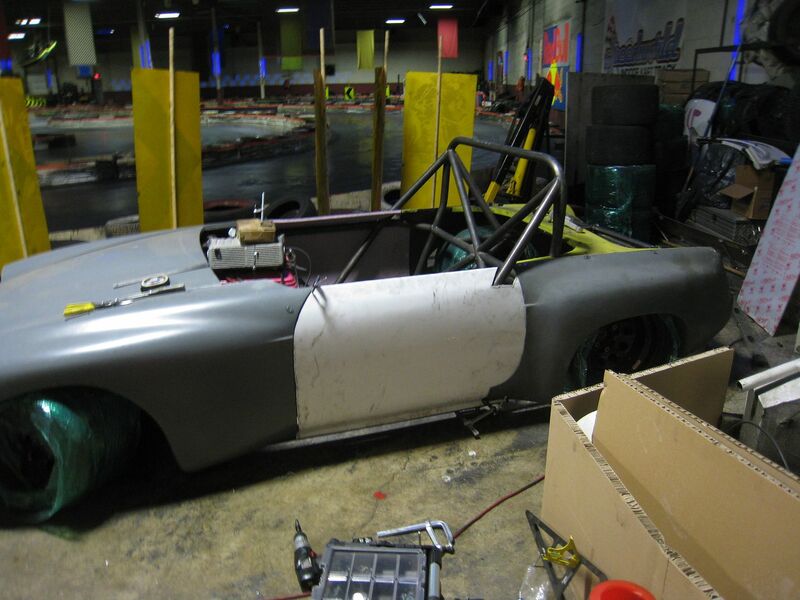 Ok, since I'm already replacing the frame rail, I may as well re-do the roll hoop and since I'm doing all of that, I could just recreate the entire car to make it a true tube frame car. 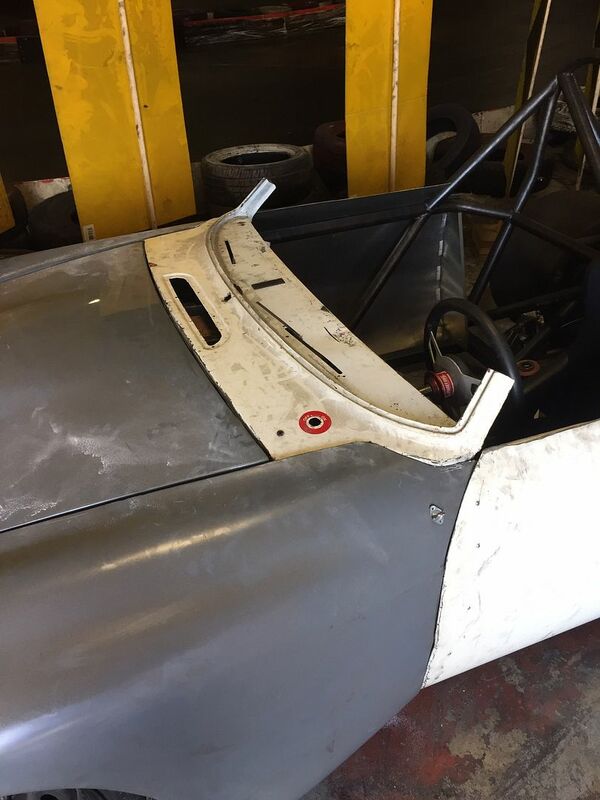 Then I could improve it's stiffness, move the engine more to the passenger side and back, make everything easier to work on and lighter. 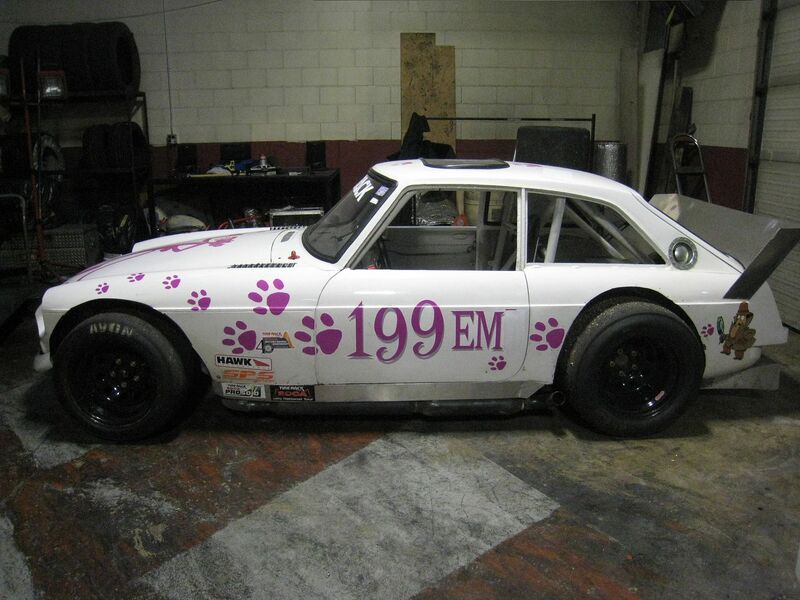 Pink Panther 1.0 (PP1.0) was a V12 powered MGB-GT and it weighed 2550 lbs. 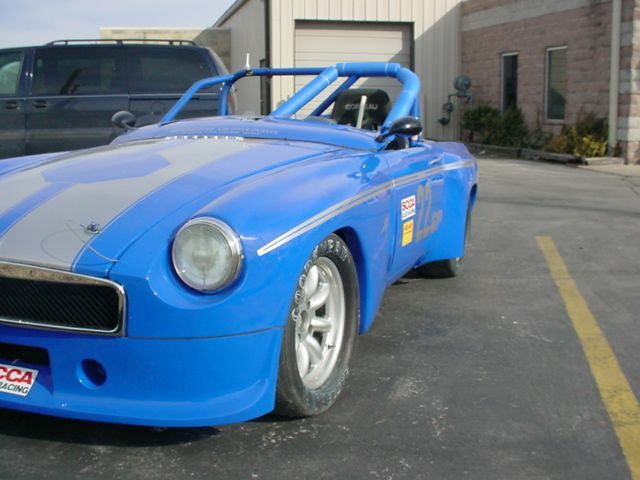 PP2.0 was a V8 powered MGB-GT and weighed 2275lbs. 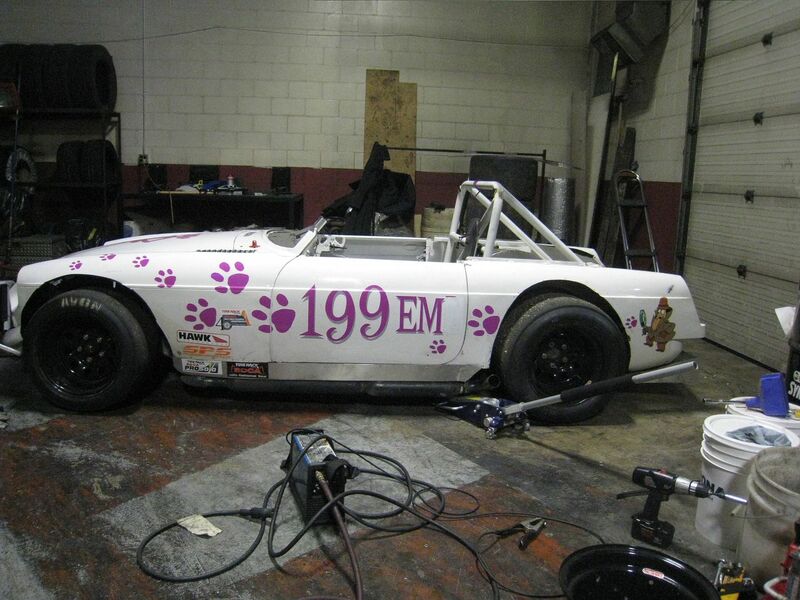 Pink Panther 3.0 is a V8 powered MGB Roadster and hopefully weighs 1850 lbs. The idea of going tube-frame rolled around in my head for a while then I decided that it's going to have to wait until Pink Panther 4.0. 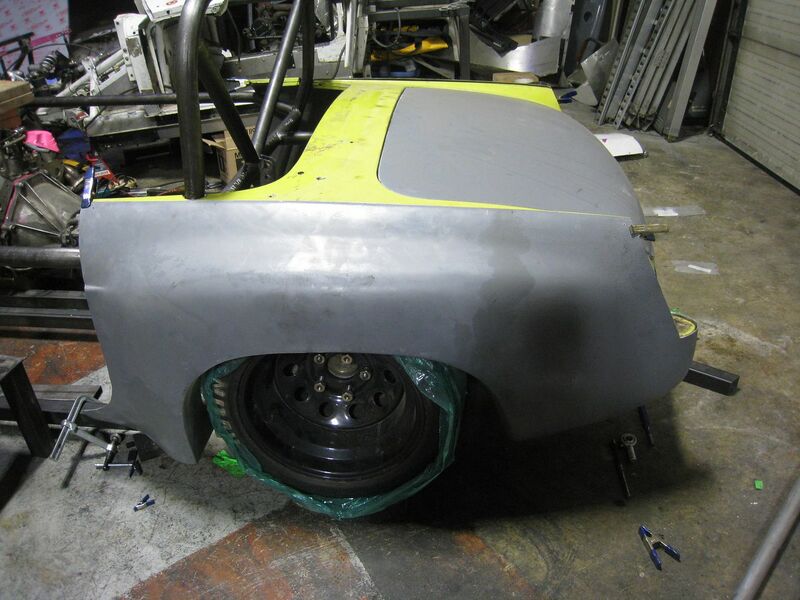 For now I am just going to fix the flaw in the rear structure and go from there. 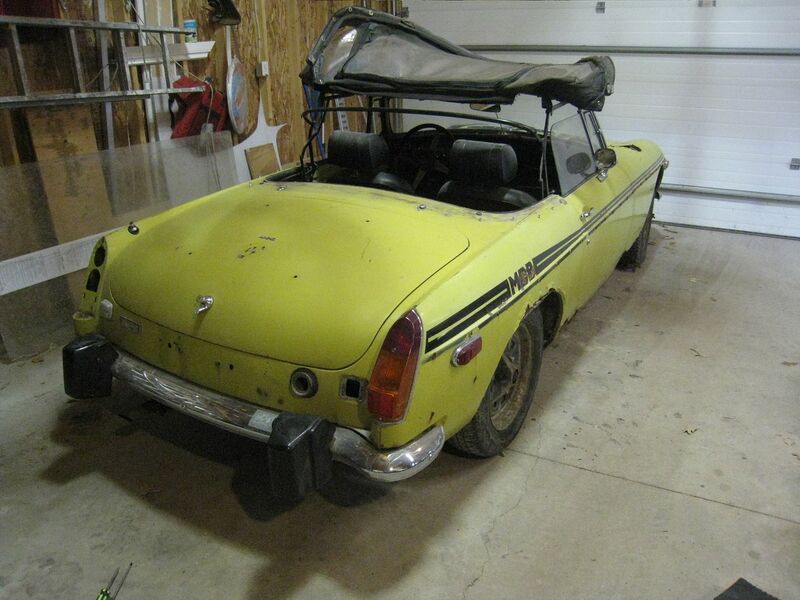 I made a pick up truck out of another MGB so I could get the rear deck for the Pink Panther. 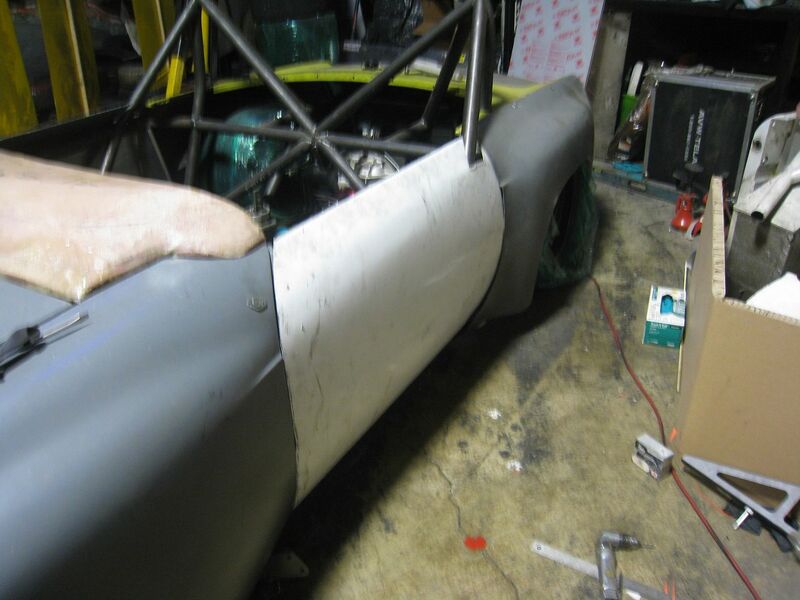 Once trimmed of all the fat, it weighs about the same as what the fiberglass copy would weigh once it was reinforced. 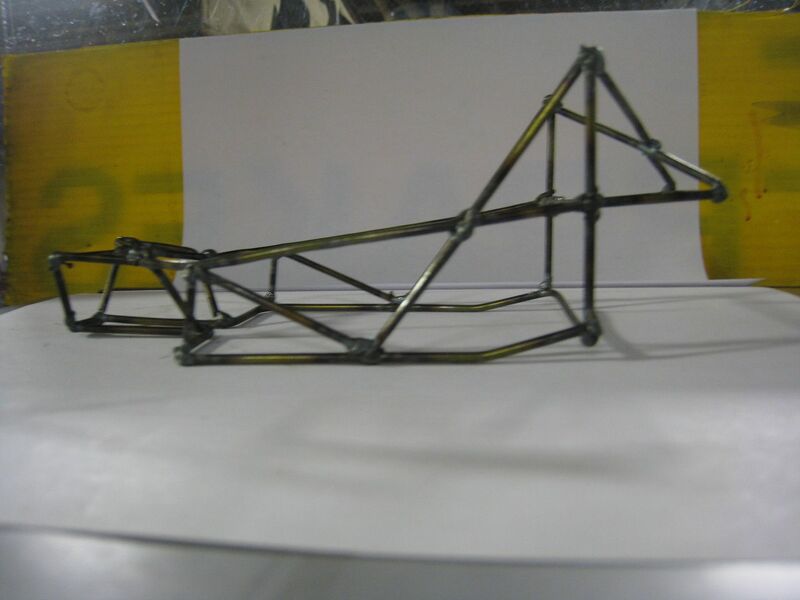 The frame is getting modeled in CAD but I still like to be hands-on so I put together a little scale model. 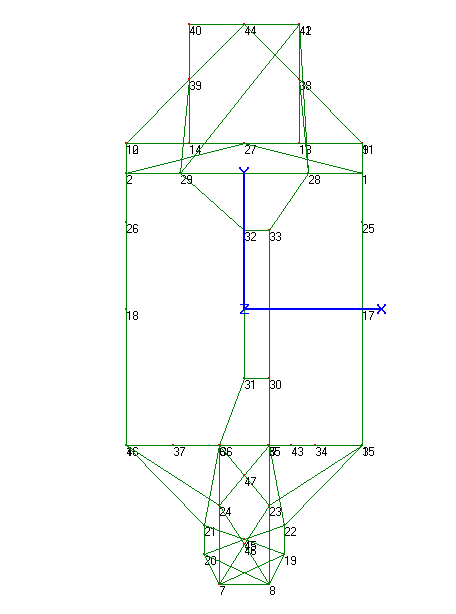 This is NOT the final frame design, I'm just toying with ideas. 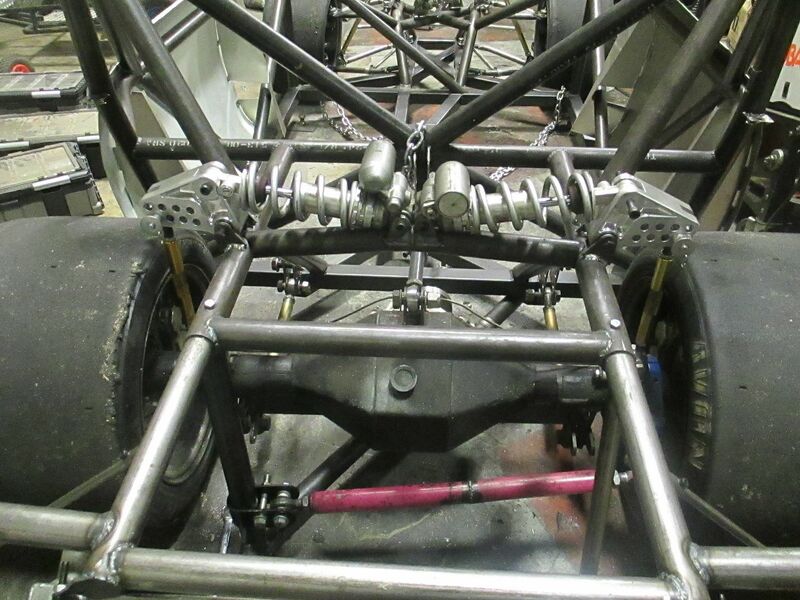 The engine is not between the front suspension, it is behind the passenger side suspension but still ahead of the midpoint between the two axles, as per the rules. 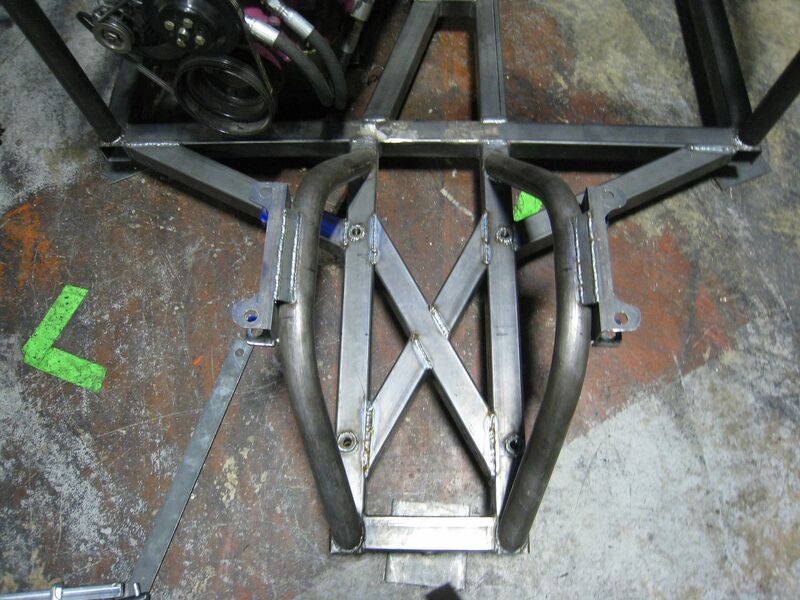 Here is an updated frame design. This one uses much less steel and has more direct lines. See that little kick up on the bottom frame rail? 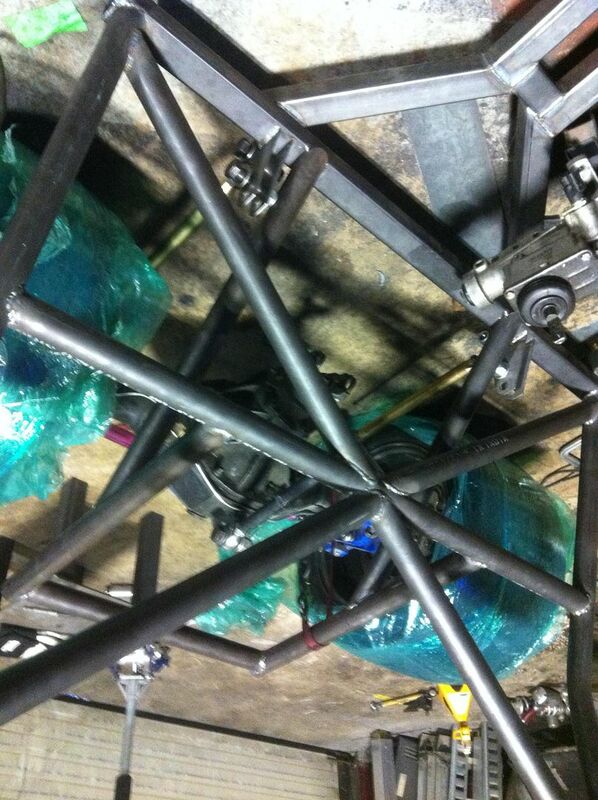 That's so the crossmember lines up with the lower control arm mounts for the rear suspension. And the front of the car is strong this way, too. 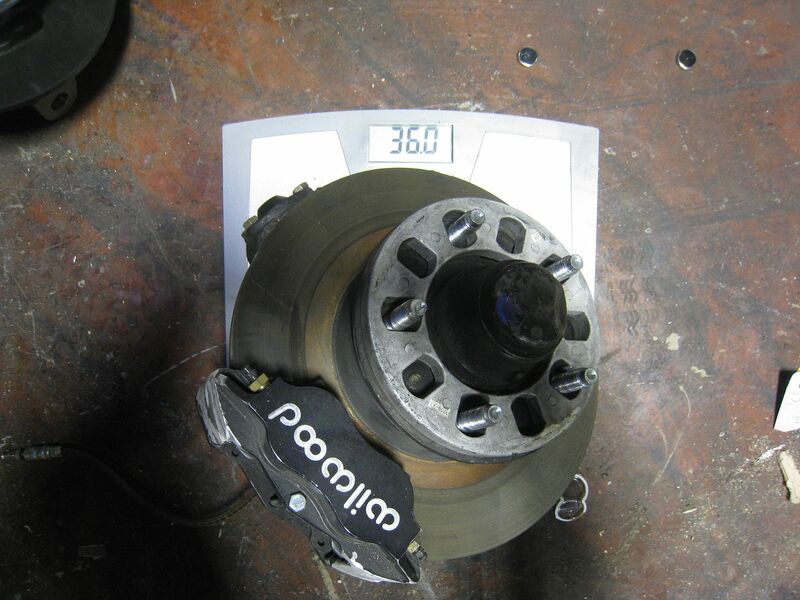 I chose the Mustang II upright because they have been used by hot rodders for years and come in standard, 1" dropped spindle and 2" dropped spindle. 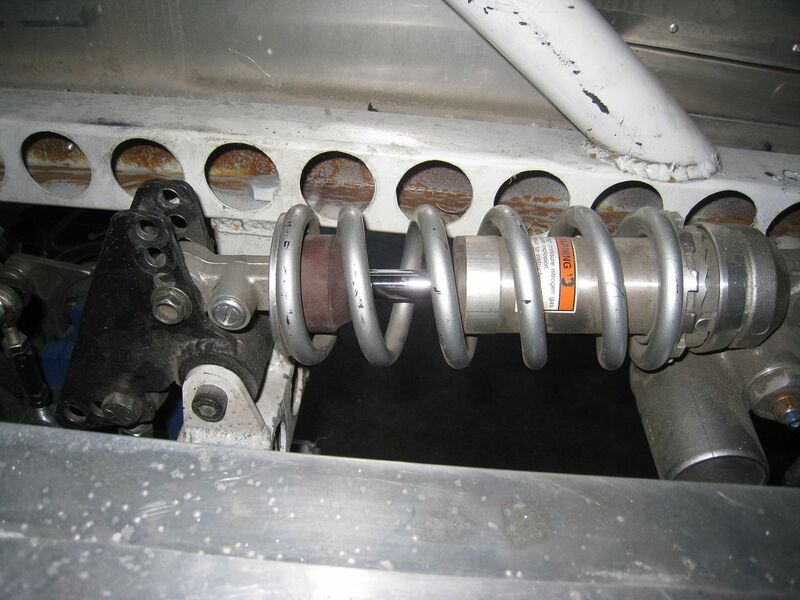 And the Performance Trends program I am using happens to have the Mustang II suspension as an example. 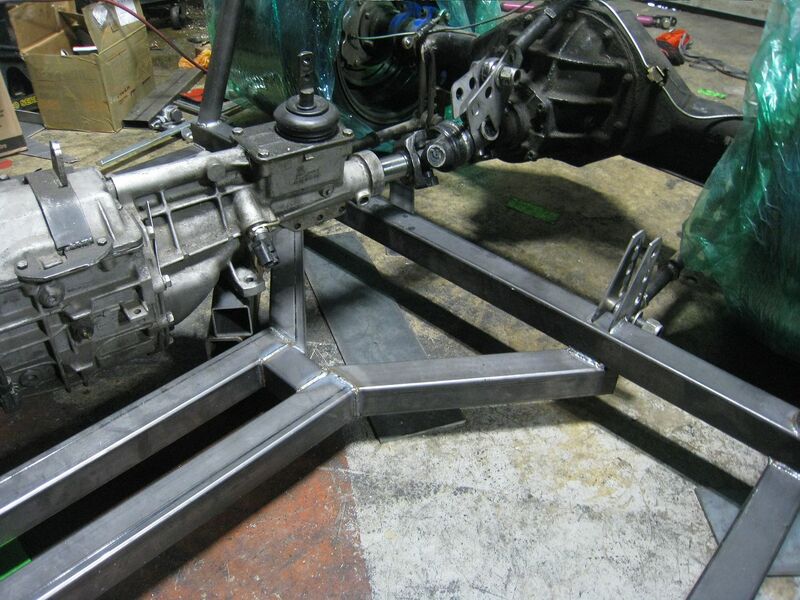 I plugged the 2" dropped spindle version into the program and started designing a suspension around that. The geometry landed up being superior to anything I could make with the Jaguar upright. The roll center is 1.58" and at 1.5 degree roll, only moves .01". 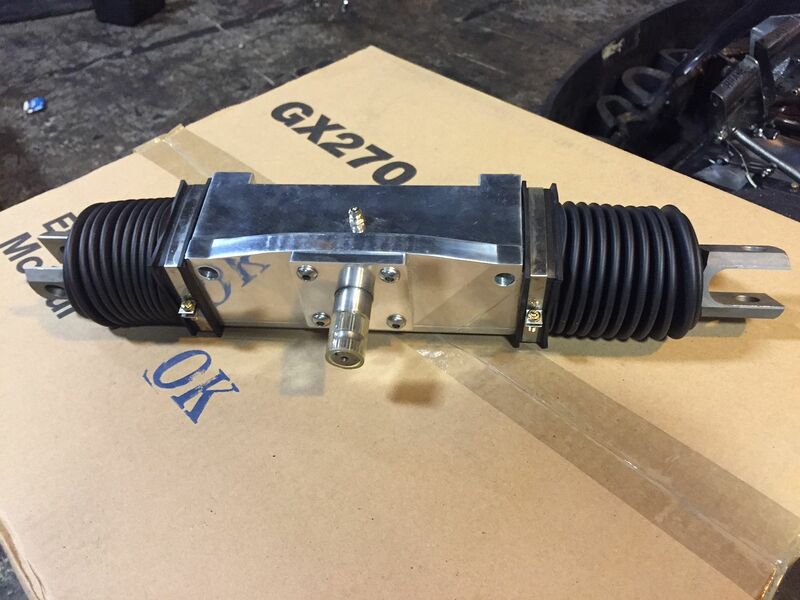 I have -.76 degrees camber gain and anti-dive is 25%-in my opinion these are perfect for autocross. 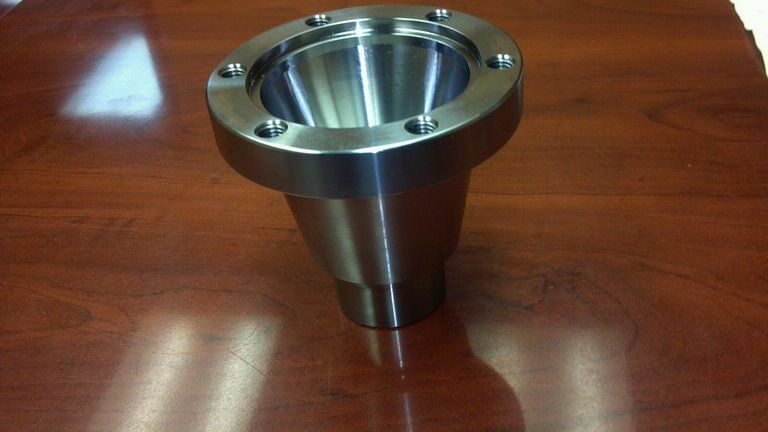 Know what this is? 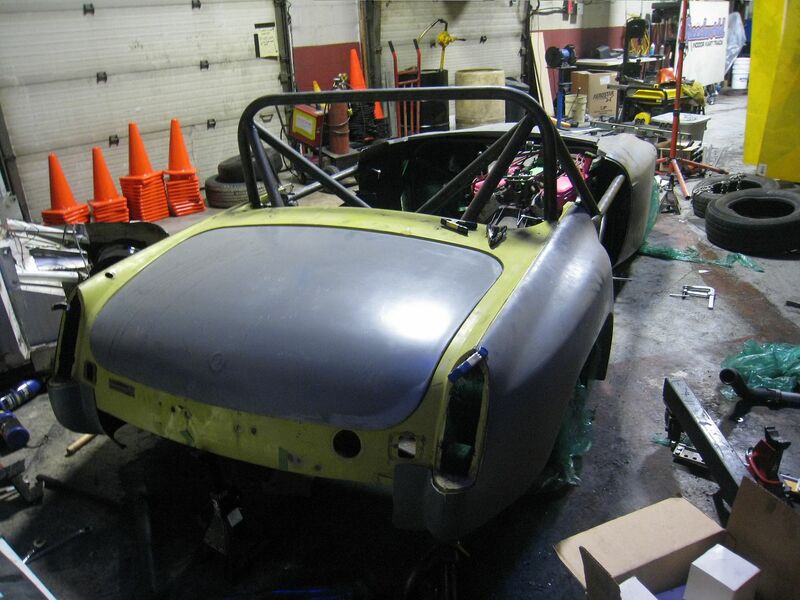 It's the start of a super strong, light frame for the MGB. 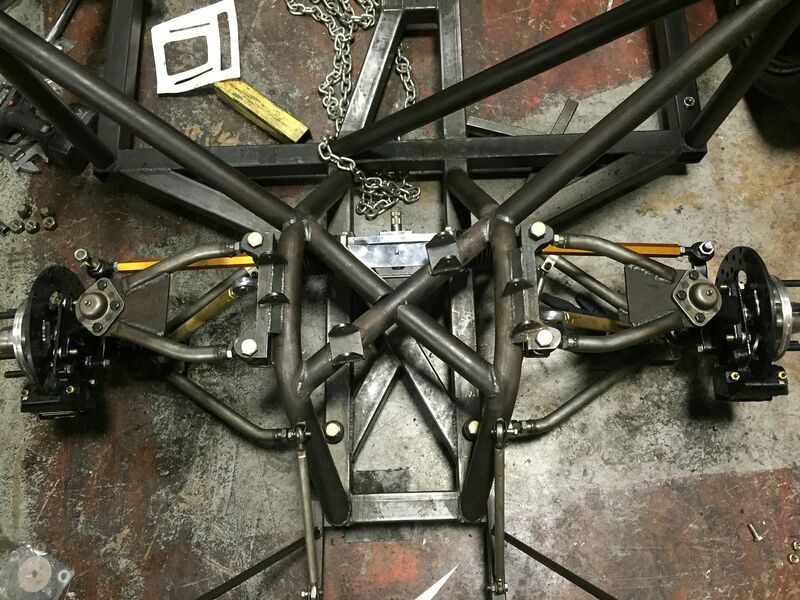 It's the perimeter frame and the rear lower suspension mounts are on the right and the lower front control arms will bolt to the pieces sticking forward on the left. I thought I had enough tubing left over from the last frame to make the main roll hoop, but I made a discovery. 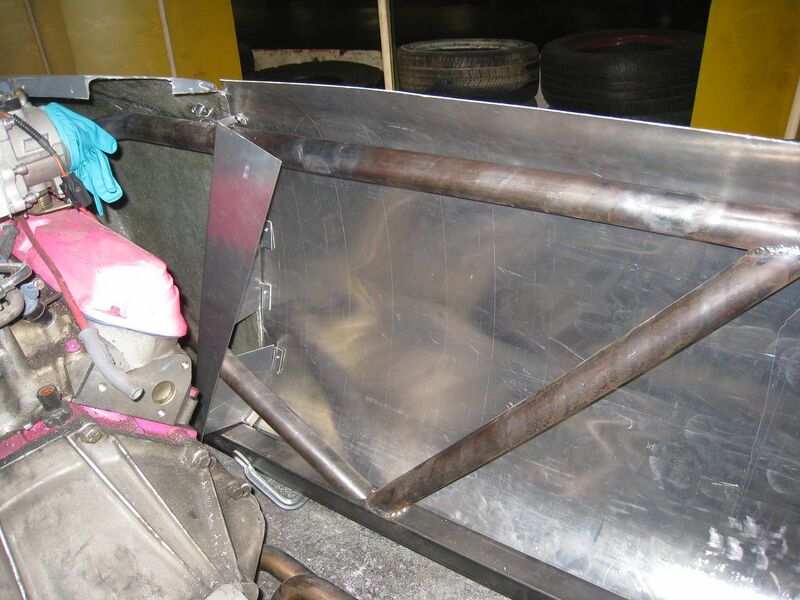 The SCCA rule book calls for either 1.5"x.120" wall thickness DOM or 1.75x.095" wall thickness DOM tubing for the main roll hoop. I grabbed the last piece of 1.75" DOM I had left and it was long enough for the hoop but before bending it, I decided to check it's wall thickness-it was .120" thick, not .095" like it's supposed to be! That means for every foot of tubing I used, the car was .5 lbs heavier than it needed to be. Just the roll hoop would be 5 lbs too heavy. 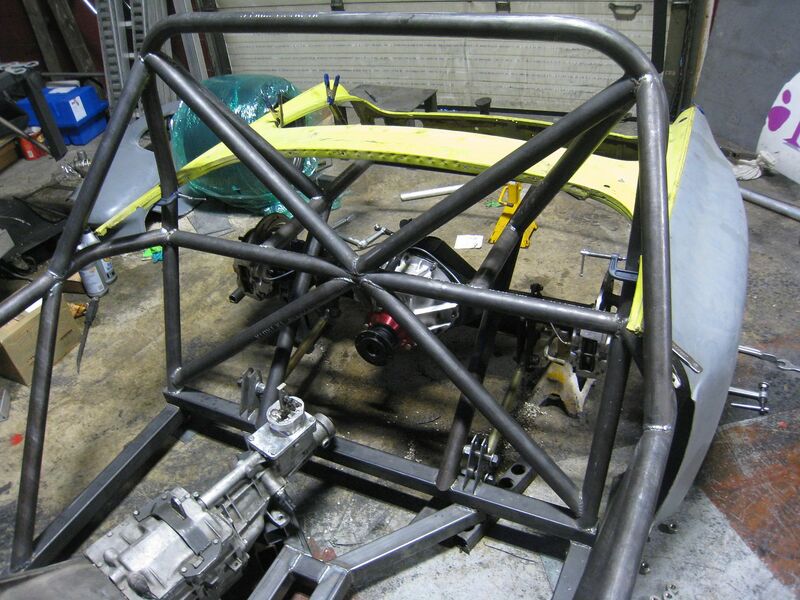 I have the proper stuff on order and can't wait to get going on the roll cage. 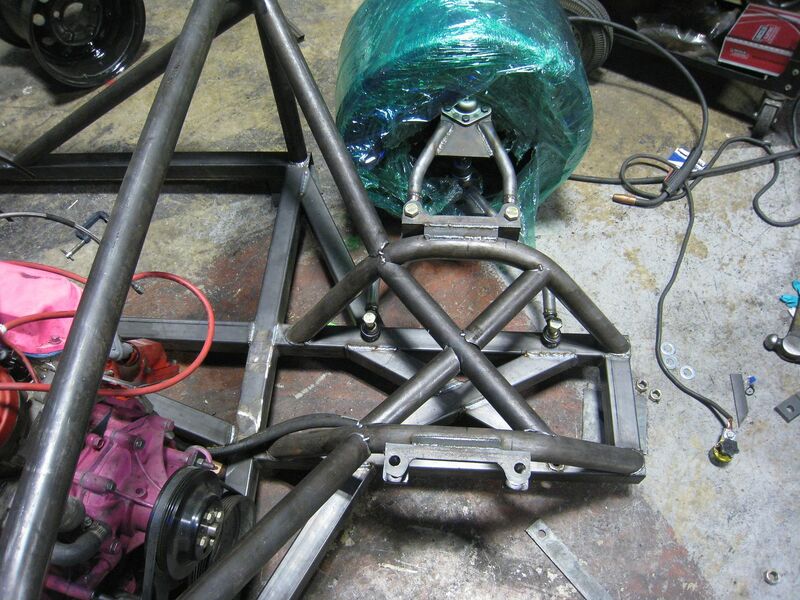 The CAD work has all been done for the suspension and frame. 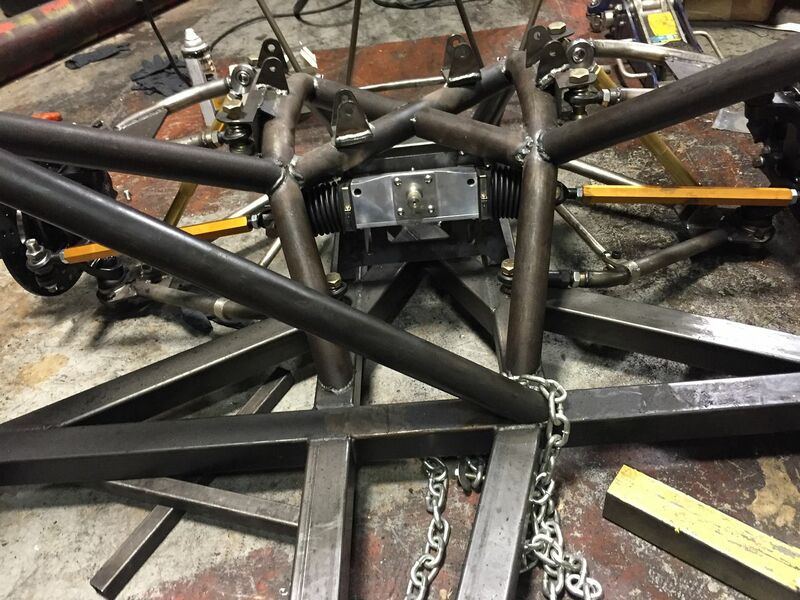 The front suspension has fantastic numbers and the frame should weigh 300 lbs and have a torsional stiffness of 11,000 lbs/degree. I wish I had pictures to show you but as soon as the steel arrives, it will go together quickly and you'll see the real thing. 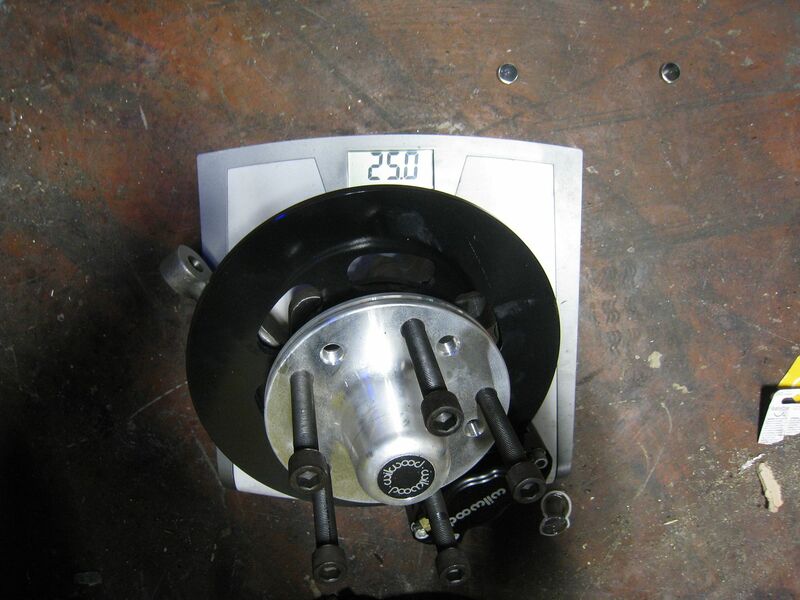 BTW, I have a real good idea of the weights of all the components and the car should come in at 1850 lbs with driver. 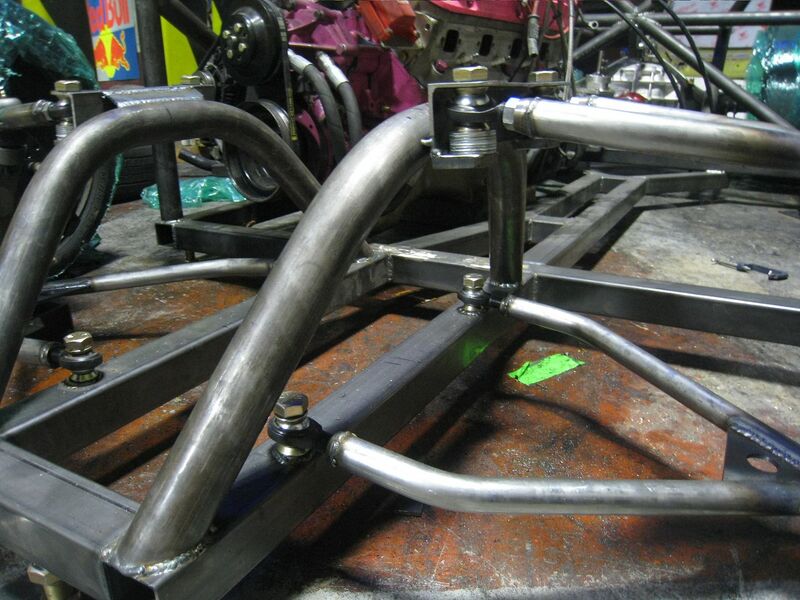 I have one upper control arm made. I tried to make the main roll hoop but the tubing kept kinking, I think I'm using the wrong sand inside. Look what arrived today! 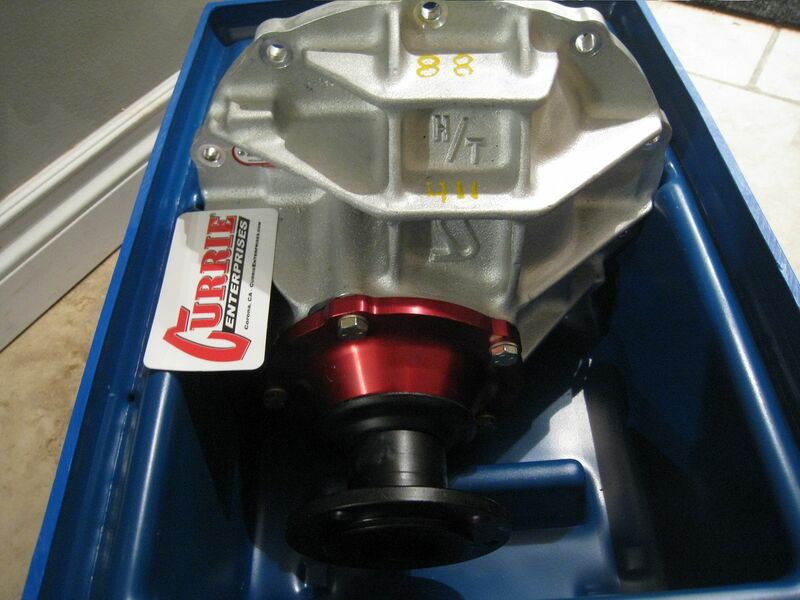 Currie Aluminum diff with 4.11 gears, True-Trac LSD and CV flange. Can't wait to try it out. Couldn't sleep so I was up at 5:00 am and came to work on the car. The 4 bars going from the main roll hoop down were the most difficult ones to fit so far. There are a lot of complex angles going on and all I could do was trim and fit, trim and fit until one bar looked good then try to recreate it in mirror image for the bar on the other side. Got a little more done at the front of the car. 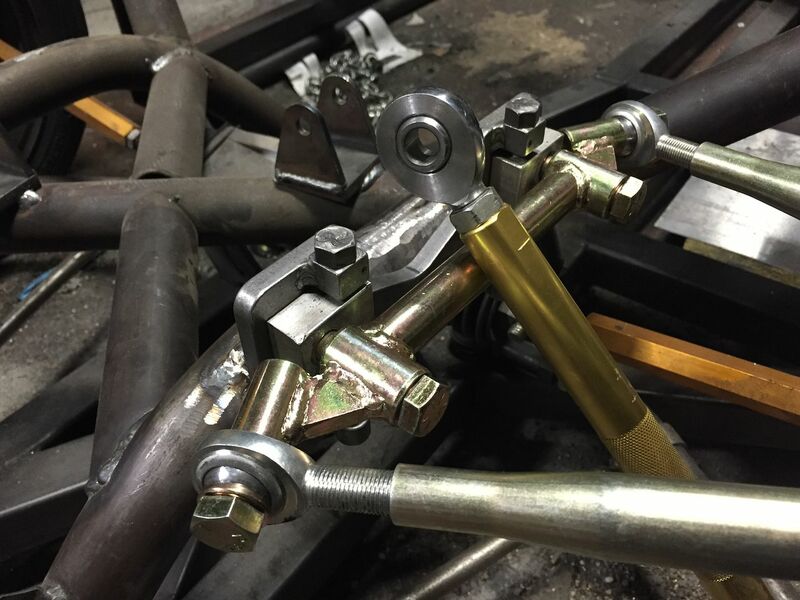 The upper control arms will actually bolt to tabs welded to the tubes, they are just laid on top to get a visual of how the front will look. 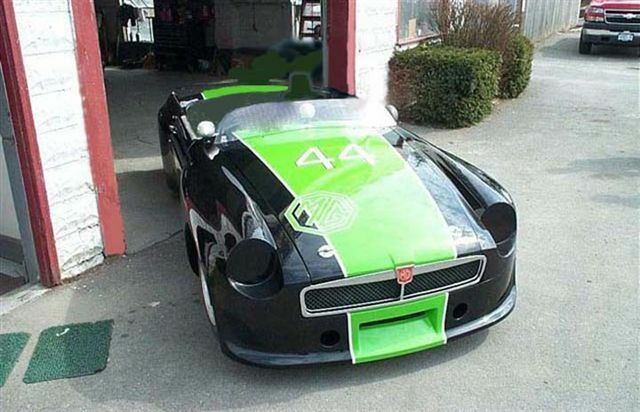 The Pink Panther was put on hold while I finished my Ayrton Senna bike but now that it's on the road, I'm back to the MGB. 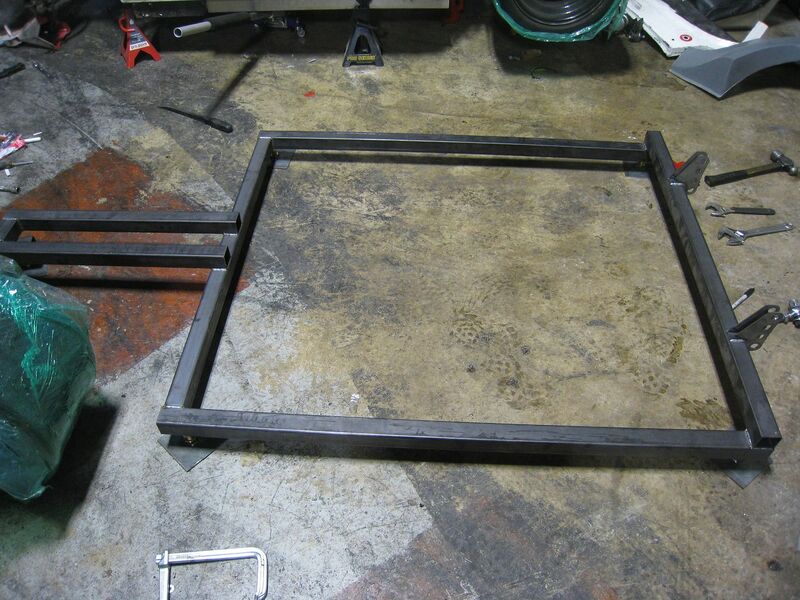 And I flipped the frame upside down to weld all the stuff I missed earlier. 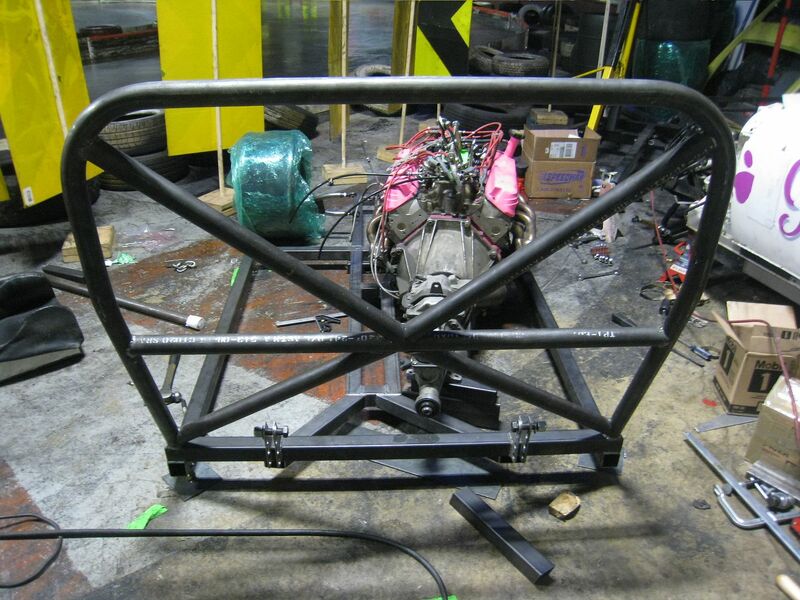 The whole frame weighs less than just the front end of the old car. 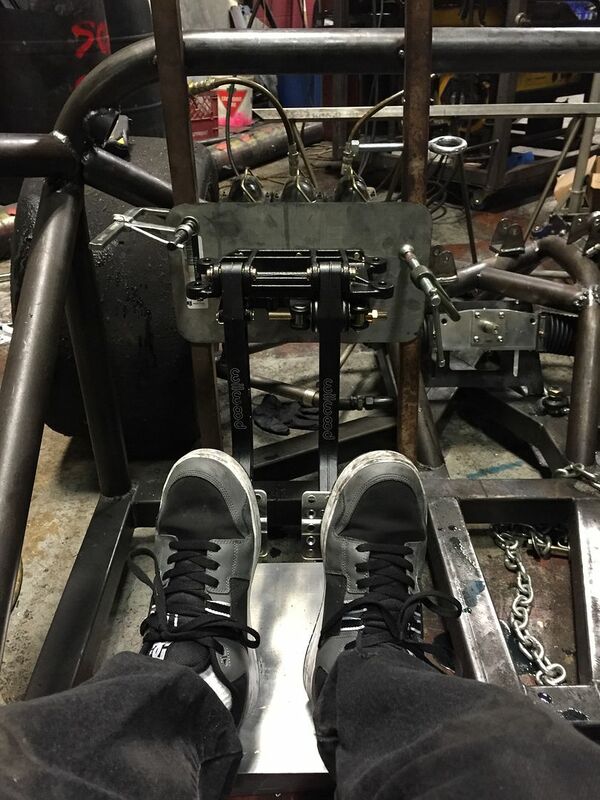 Took hours and hours of measuring, re-measuring, making a mounting jig and some more measuring but I got the front suspension all mounted. 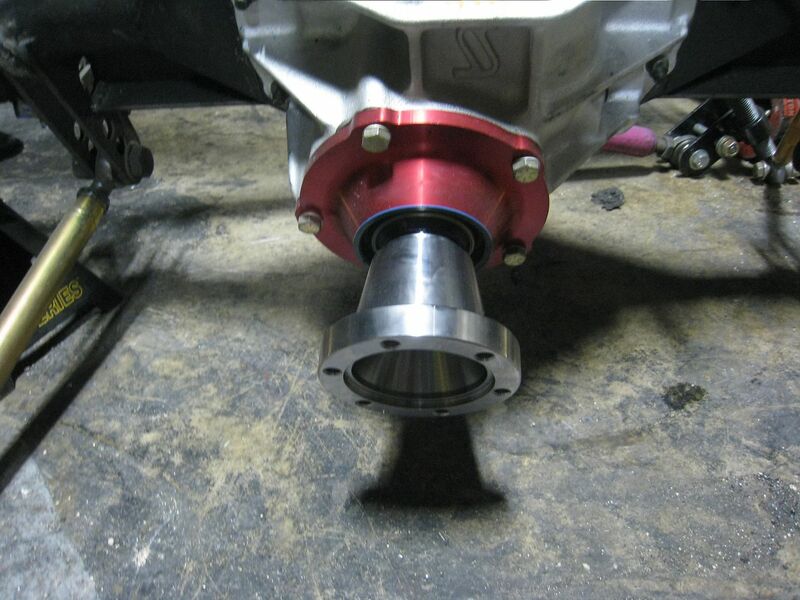 Spacers are used for anti-dive and roll center adjustments and turning the rod ends in or out for camber/caster. 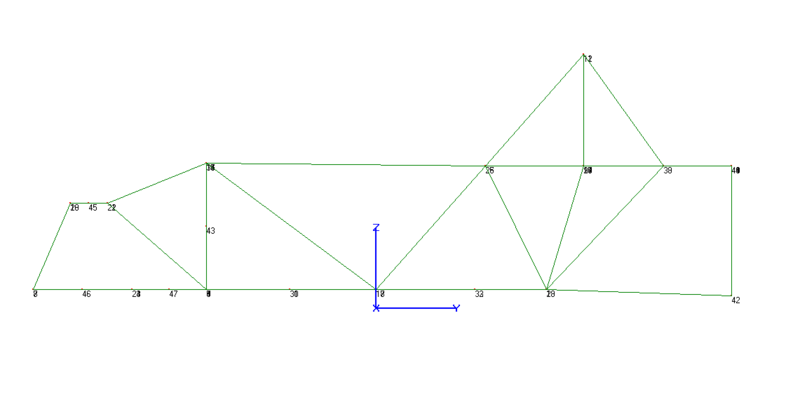 Screen shots of the frame in CAD, top view and side, minus the suspension. 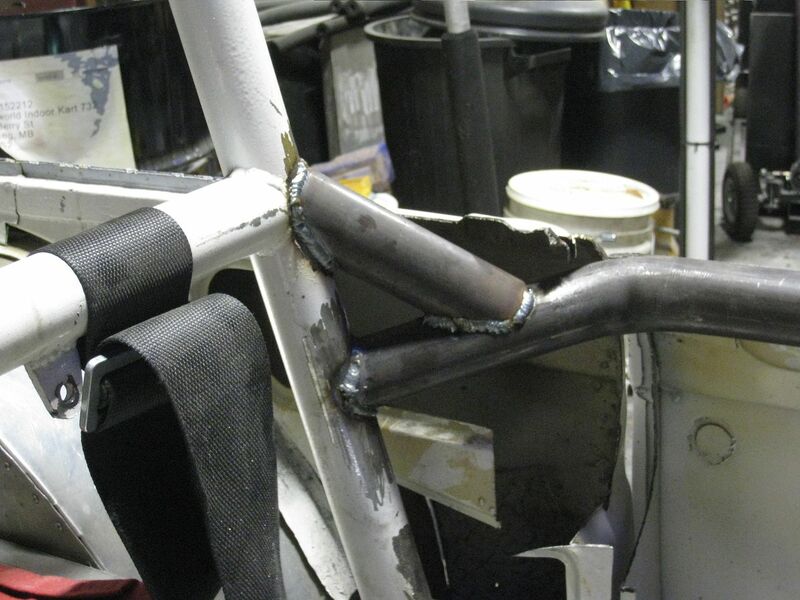 These tubes are not welded in yet, it took so long to fit the complex curves that I ran out of time, but you can see where it's going. 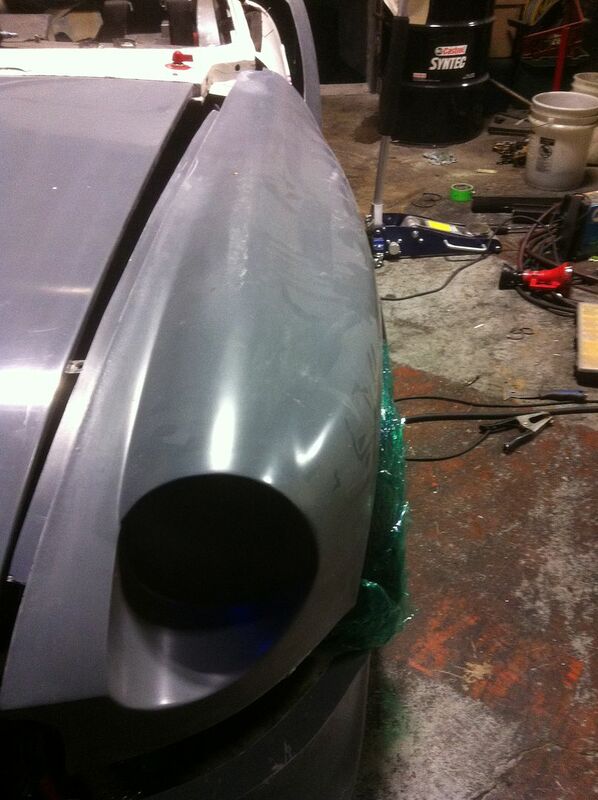 Today I worked on the back of the car. 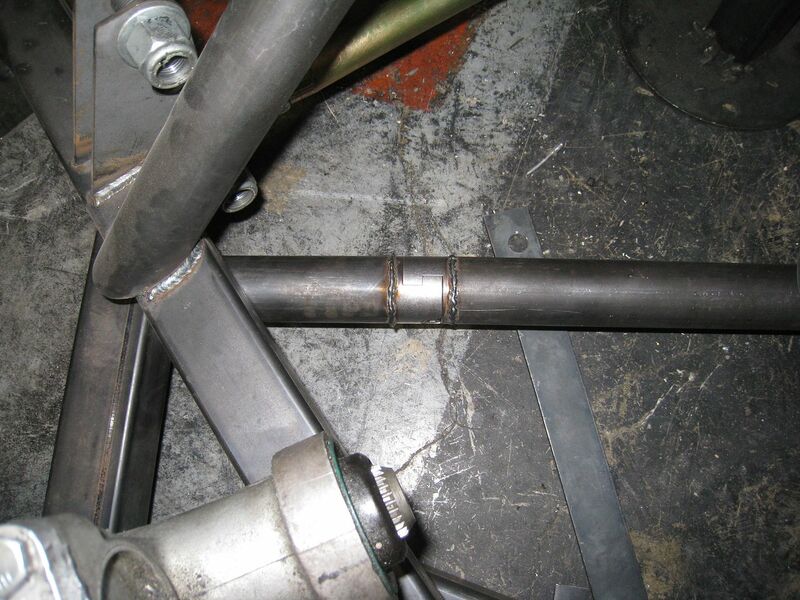 I welded the tube for the adjustable Panhard mount and the reinforcing tube that runs under the diff. Look closely at the tube under the diff and you will see that it uses trick machined couplers to make removal easy if I need to drop the diff. 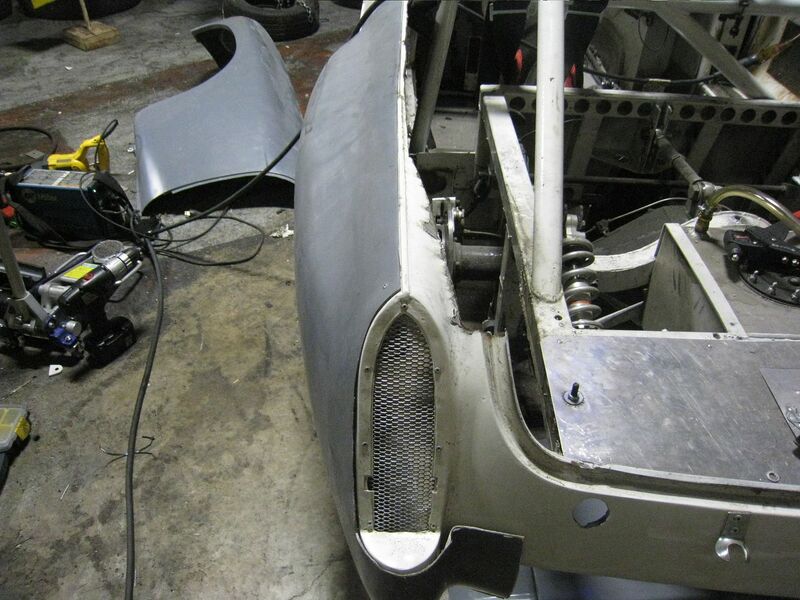 The Panhard adjusts up or down with a wrench, just like the NASCAR guys. 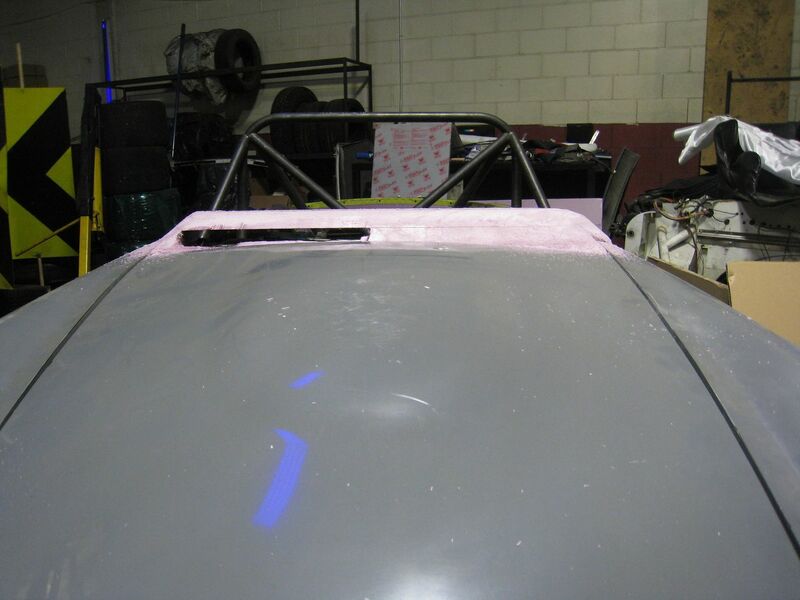 I'm using Dzus fasteners on the body panels because I want to be able to zip everything off quickly for access or repair. 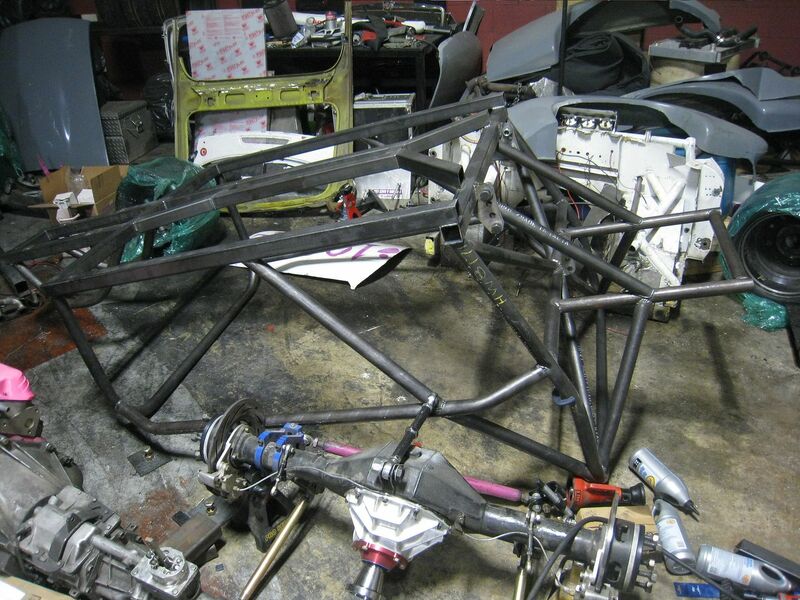 The front end should be able to come off as one piece and is height adjustable. 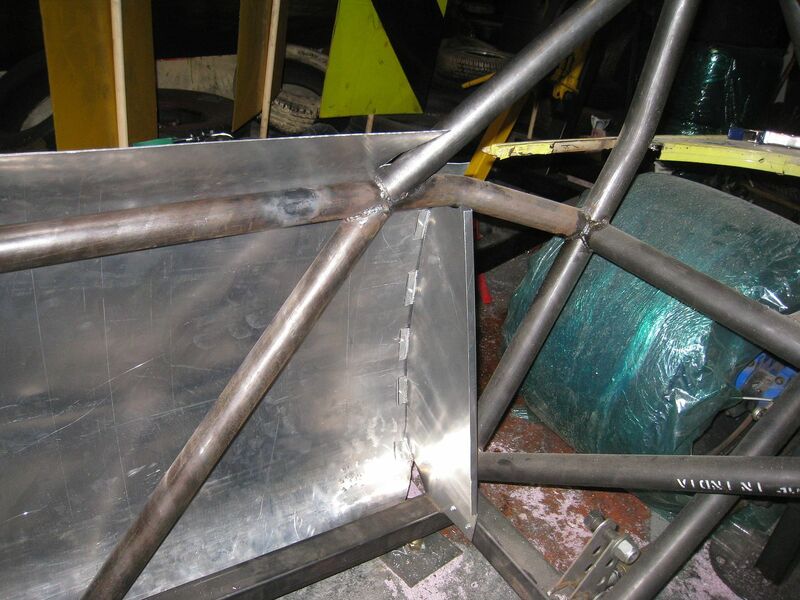 No, the brackets are not completely welded yet. Mounted the radiator in the back. Does that present challenges for getting air through the rad? 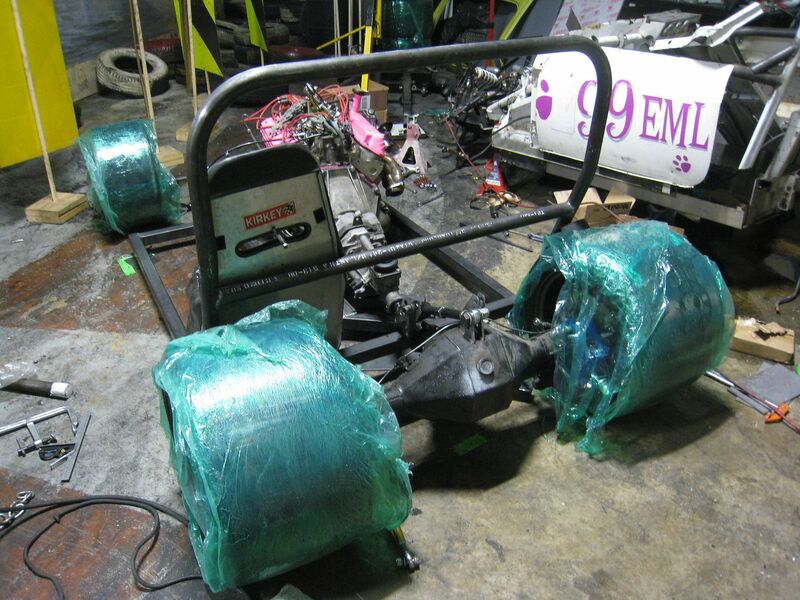 Most certainly, but It's offset by the extra weight over the back axle. 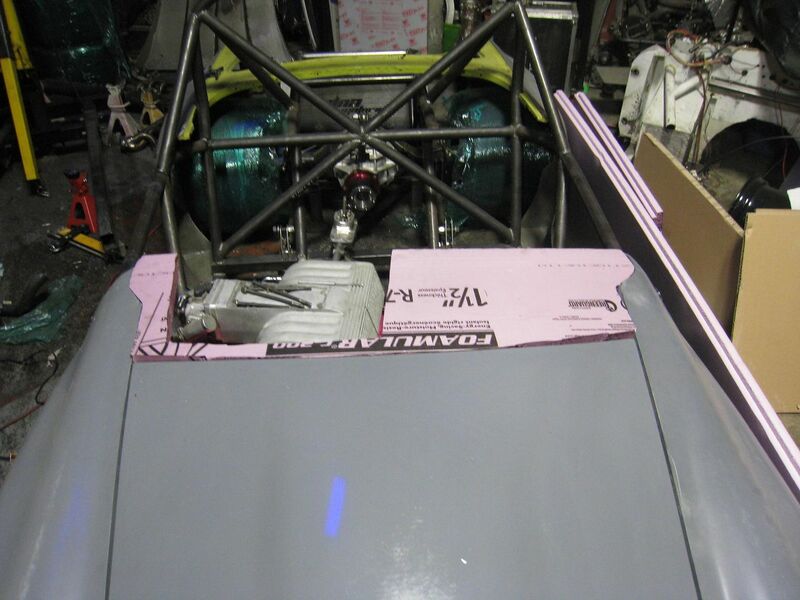 I plan to get air from the area below the rear deck lid (immediately behind driver) and vent it between bumper/valance and diffuser. 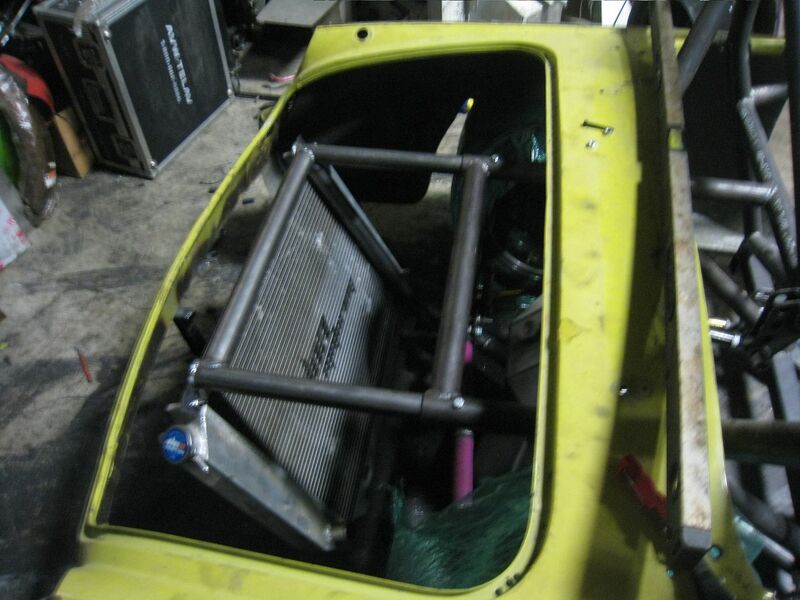 There is precedent for this, Del's EM Jeep has the rad mounted out back. I have begun construction of the cowl. 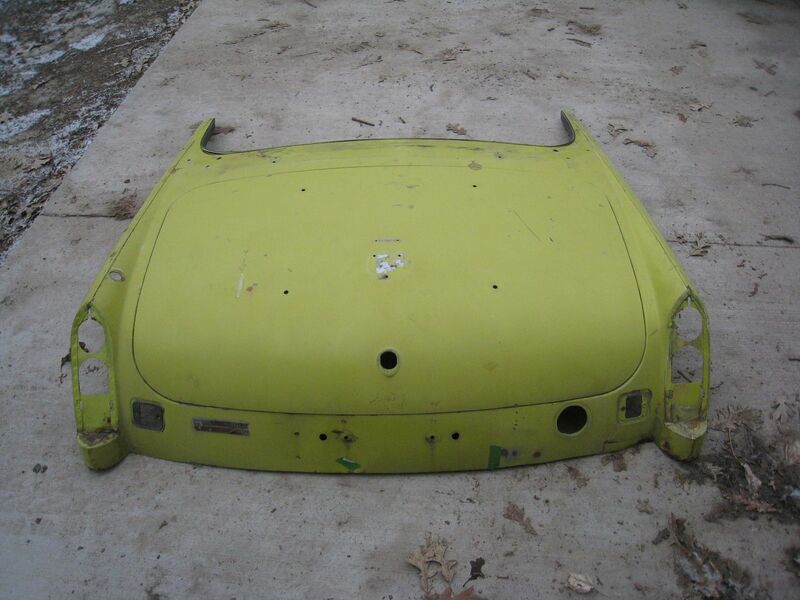 The original one is made of many bits of steel wrapped around each other and spot welded and I don't want the weight. 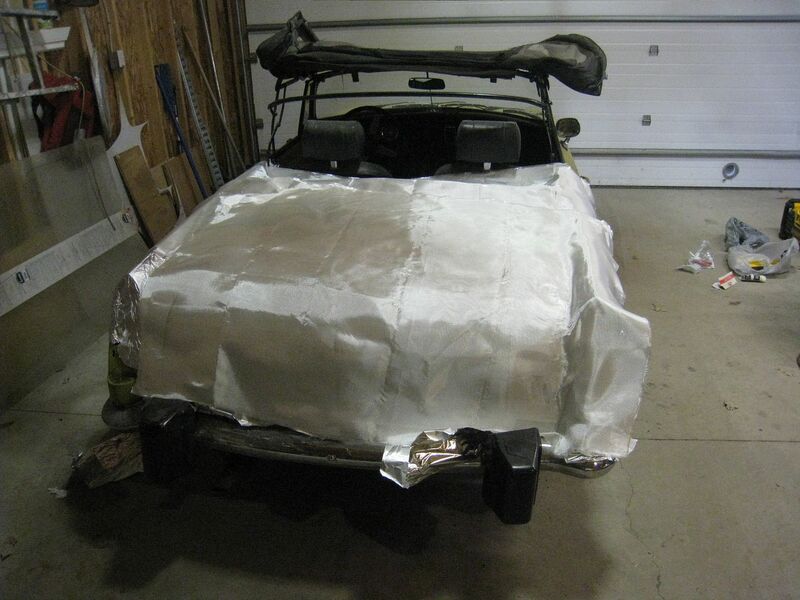 I am using polysterene foam, carved and shaved to the right shape then covered in fiberglass. 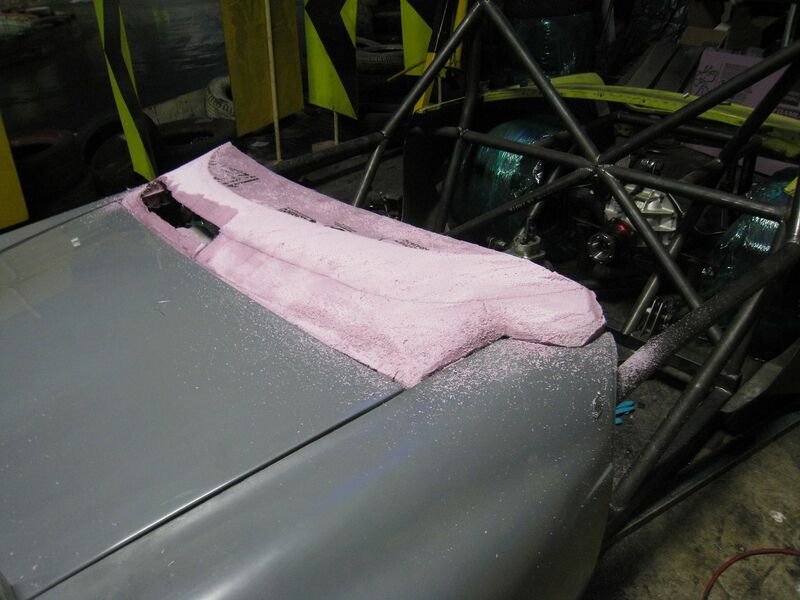 This is just the first layer of foam, another piece will go over top and shaped in a way to cover the engine. The doors will be formed in the same way. No idea why the pictures are rotated, they have been rotated several different ways in Photobucket and keep coming up looking like this. I stacked up some foam and am currently shaping it, the slot over the engine will be covered in the final version. Dave Whitworth suggested that camber adjustments would be difficult with my set up so I purchased these nifty collars from UB Machine. 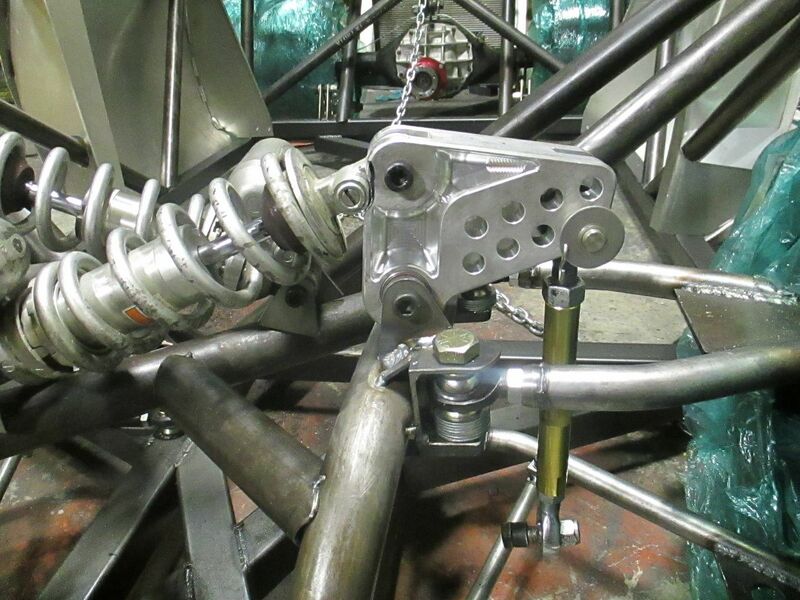 They go between rod end and lower control arm and have right hand thread on one side and left hand thread on the other. 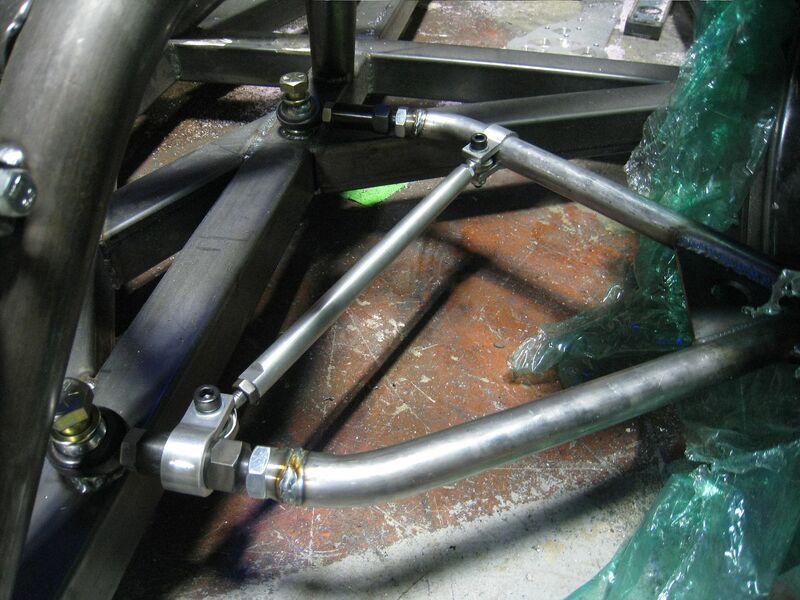 And Peter Raymond suggested that my lower control arms were compromised by the bends in the tubing so I had Steve at Veracity Machining make these aluminum clamps so I can put a brace in there that is adjustable. Work has not stopped on the car, just slowed to a crawl. This heat wave we have been having makes the workshop very hot and very humid so I haven't done a lot. 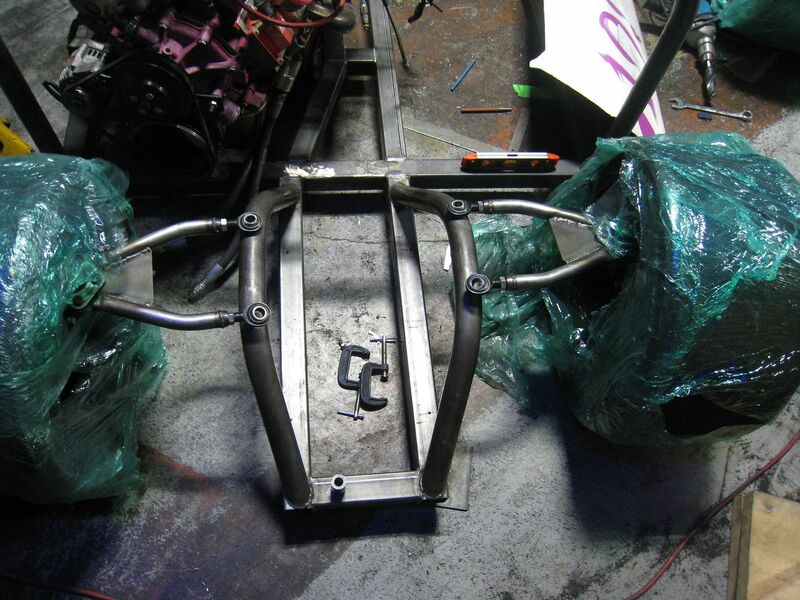 I did add some body braces to the back of the car, the first pic is a strut that goes down to the rear fender just behind the wheel, and the second pic is of the strong piece that holds most of the weight of the rear body panels. 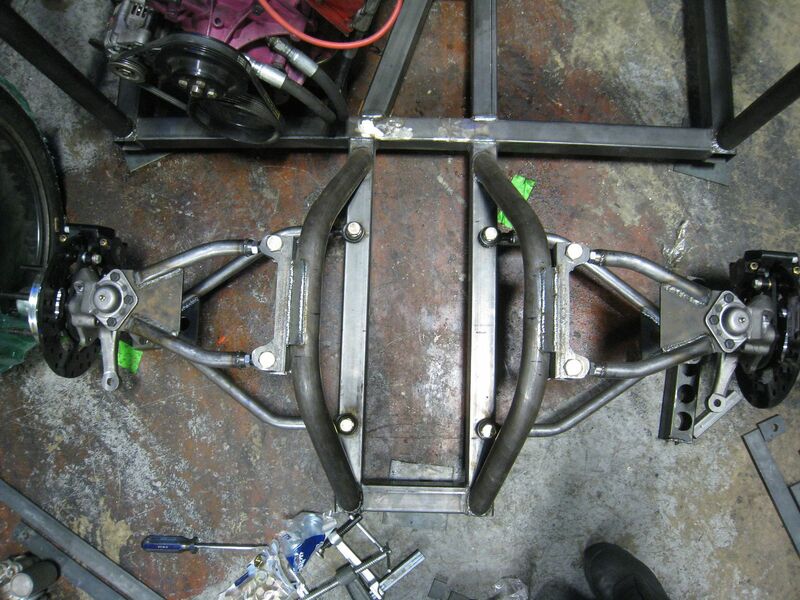 I also designed new rocker arms for the suspension and sent the diagrams off to a machine shop. 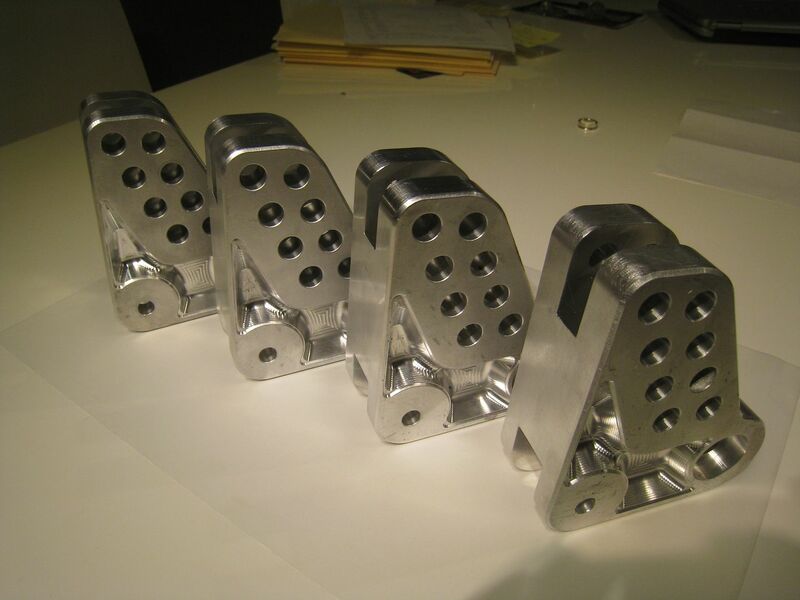 They will be made of one piece billet aluminum and should look trick. I have started construction of the doors. I only found one company that made fiberglass doors and they lost the molds in a recent move, so I am forced to make my own. I have a lot more work on this door before I start laying glass but you get the idea. I was pondering the door problem and thought maybe some thin gauge aluminum would work and be much less trouble than the glass. I tried it on the drivers side and after an hour of fettling, it looks like this, and once the graphics are on I think it will look great. 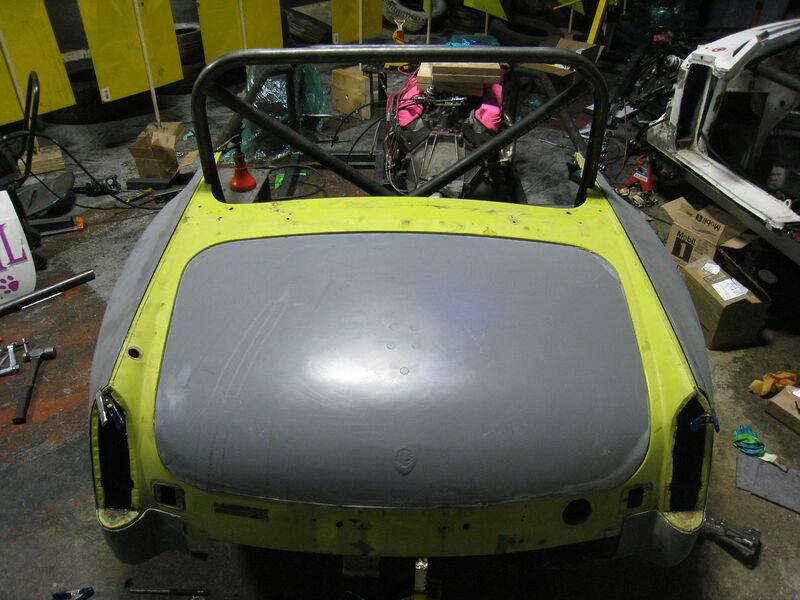 I want to be able to quickly remove the front and rear bodywork and that meant the doors could not be attached to the fenders, so I needed something to keep the doors in place and in shape. 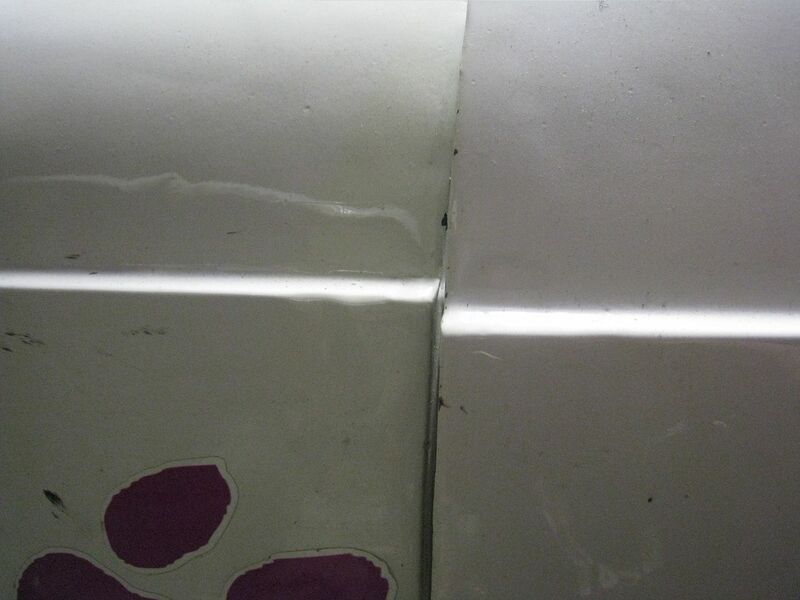 I made pieces for the passenger side door and after much fiddling, they seem to be working very well. 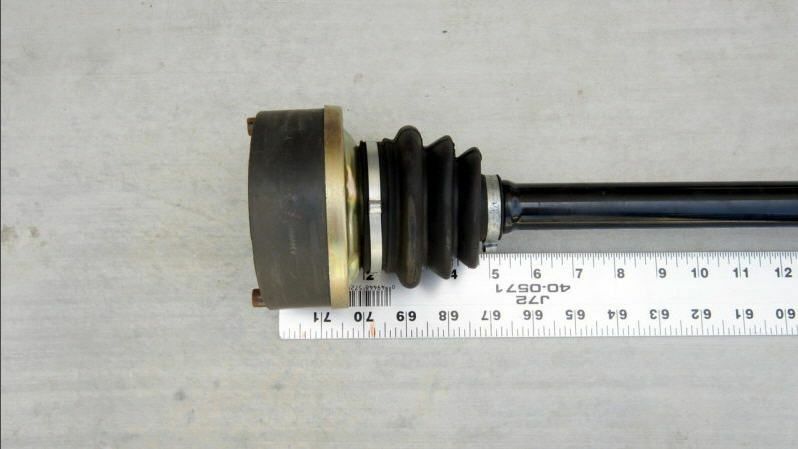 I have been unable to secure a driveshaft for the car so I need to either move engine forward (not practical), move the differential back (tires wouldn't line up with wheel openings), spend $5500 on a short transmission or get a shorter engine/trans combo. I have chosen to go with the last option so I have sold the 5.0 and will now have to explore different engine options. 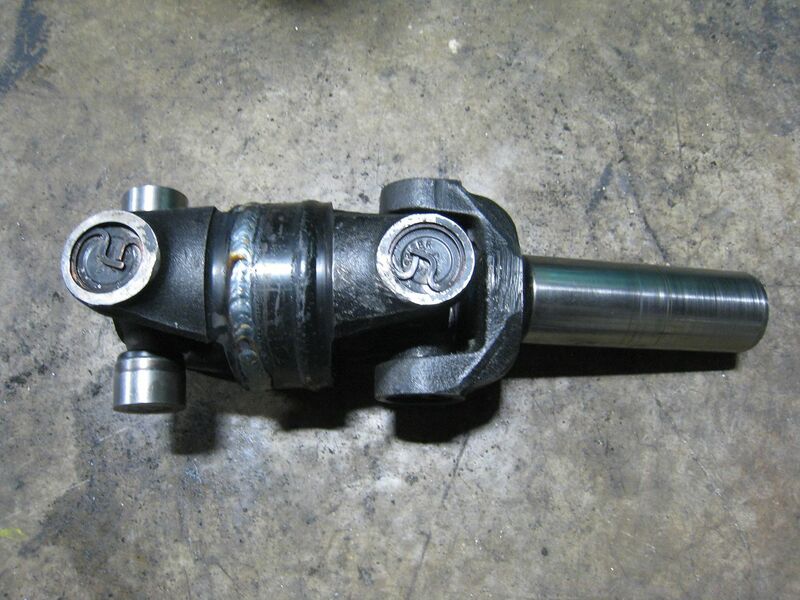 In other news, the machine shop sent me a message that my rocker arms will be done this week-yay!!! 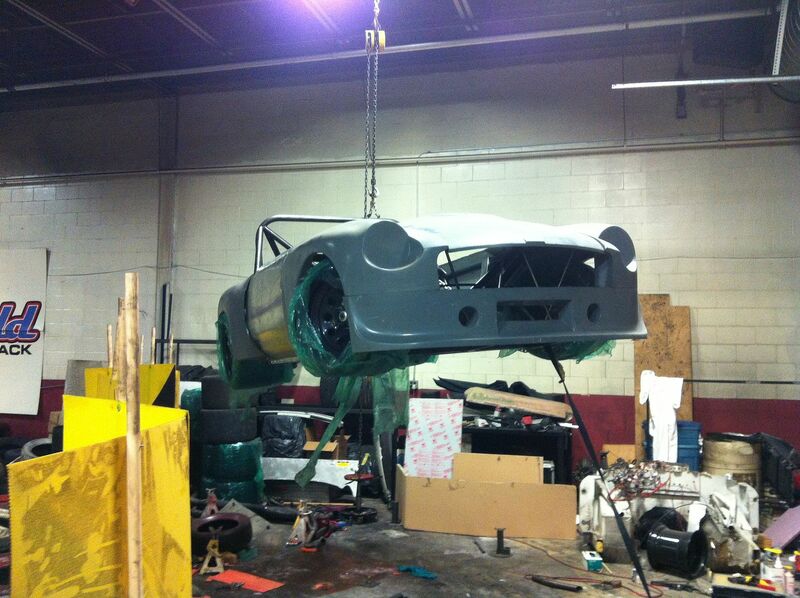 Here are some low res pictures of the car lifted in the air. Finally got the rocker arms, machined from one chunk of aluminum, pictures don't do justice. 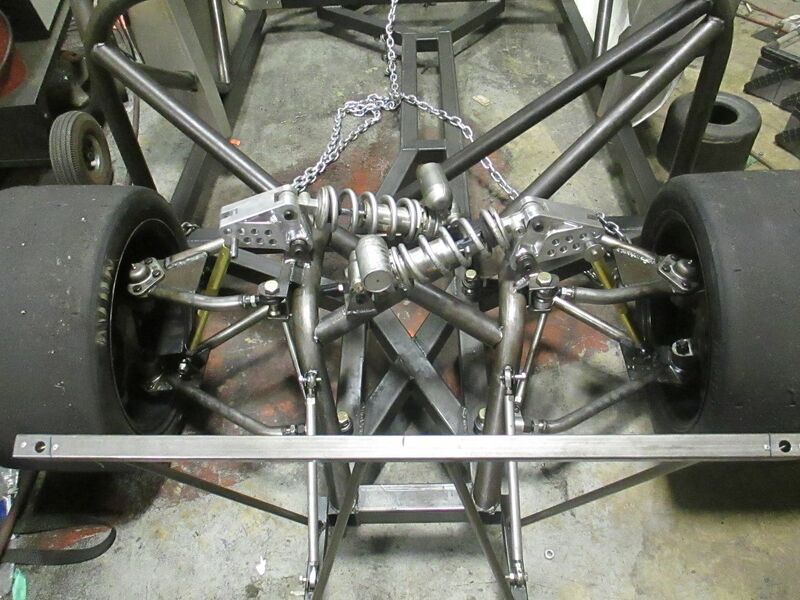 Ok, the front and rear suspension is welded in and for the first time, the car is fully suspended and I can bounce up and down on it. 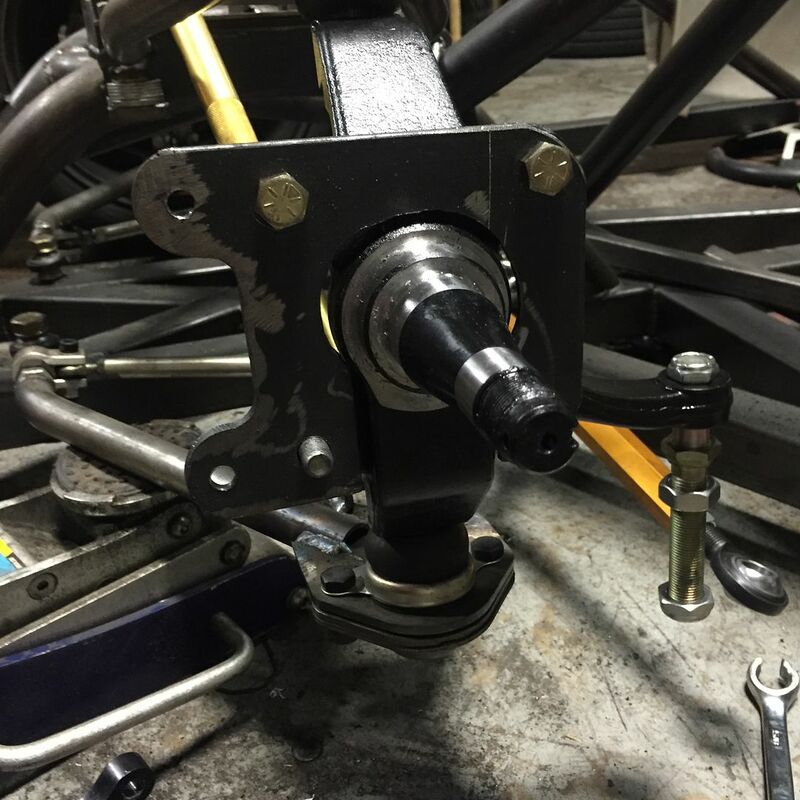 The rear pushrods are a little close to the tires when on the softest setting but I hope it won't be a problem. Well, the steering rack arrived today (that was quick) but they lied to me, it has just over 4" of stroke, not the 6" I was promised. 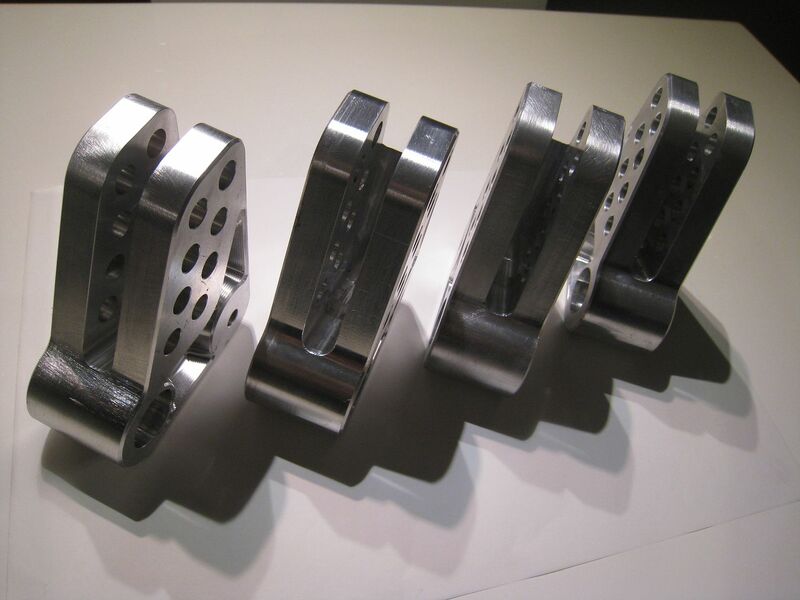 I know that I can shorten the steering arms on the spindle to correct this except the Mustang II spindles I am using are one piece cast pieces. 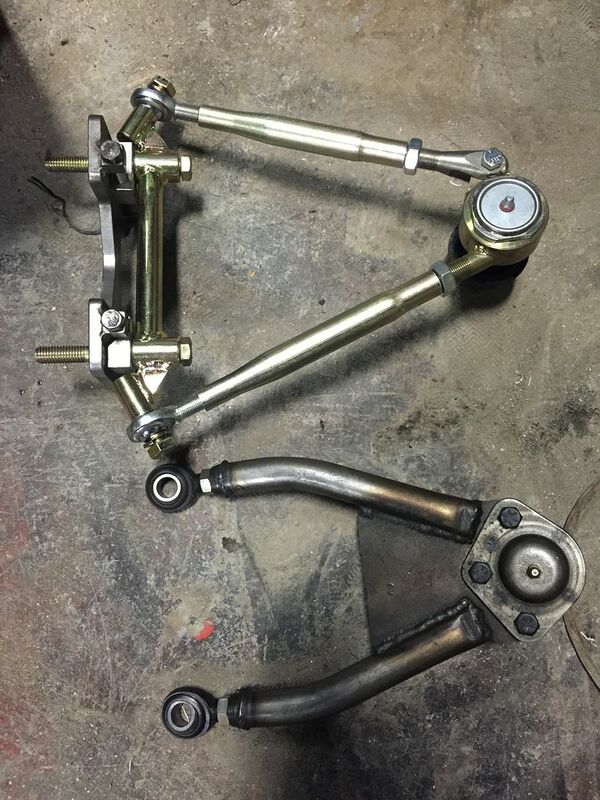 Wilwood makes these spindles with removable arms but that's $360 I didn't plan on spending. 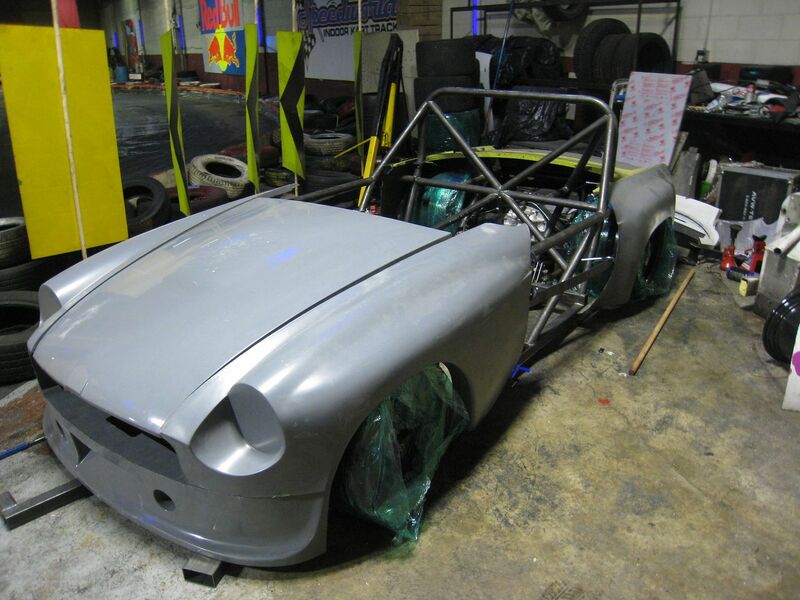 I'll bolt it all together and see what my turning circle actually is. 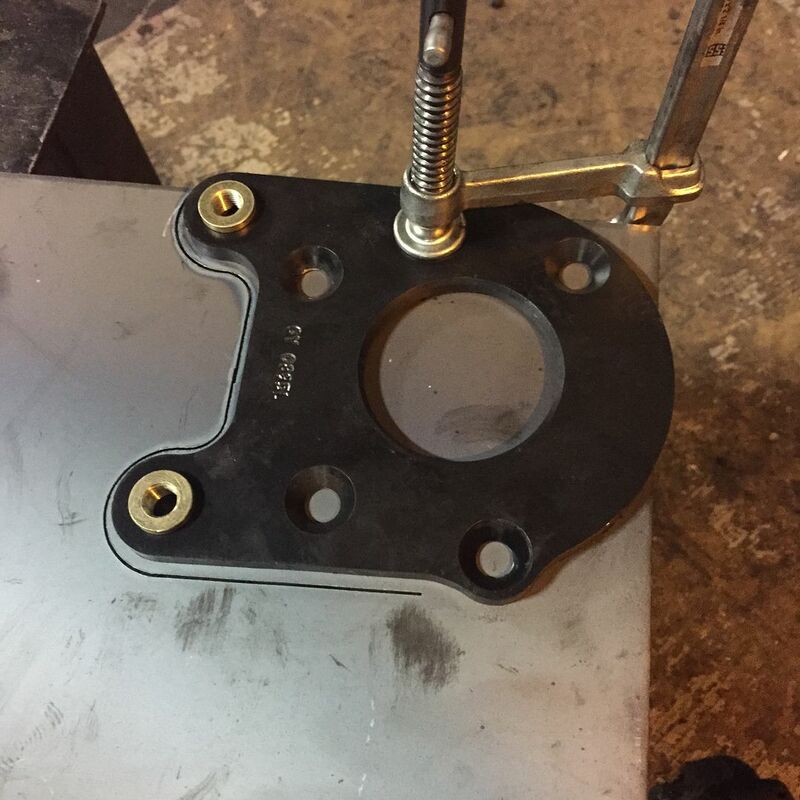 I made a paper template for the steering rack mount today and sent it off to the laser cutter. 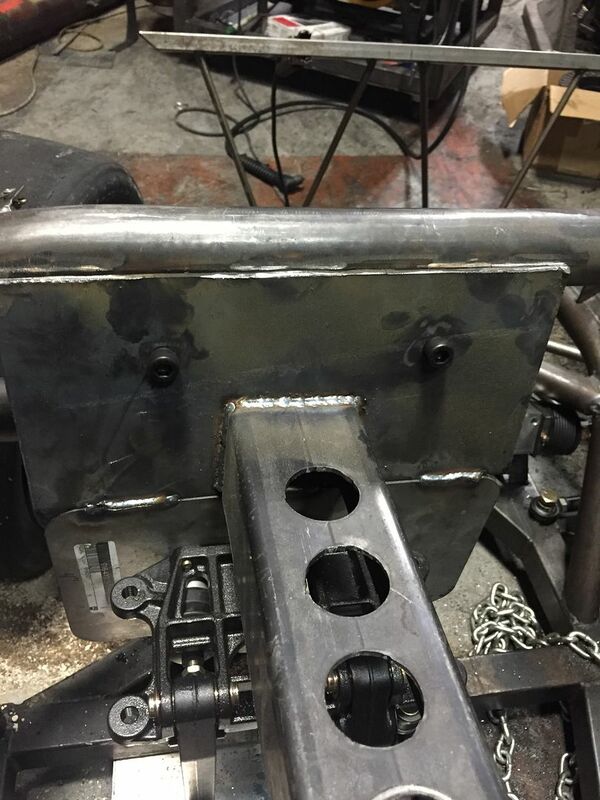 The holes are slotted so I can move it up or down to get zero bumpsteer. 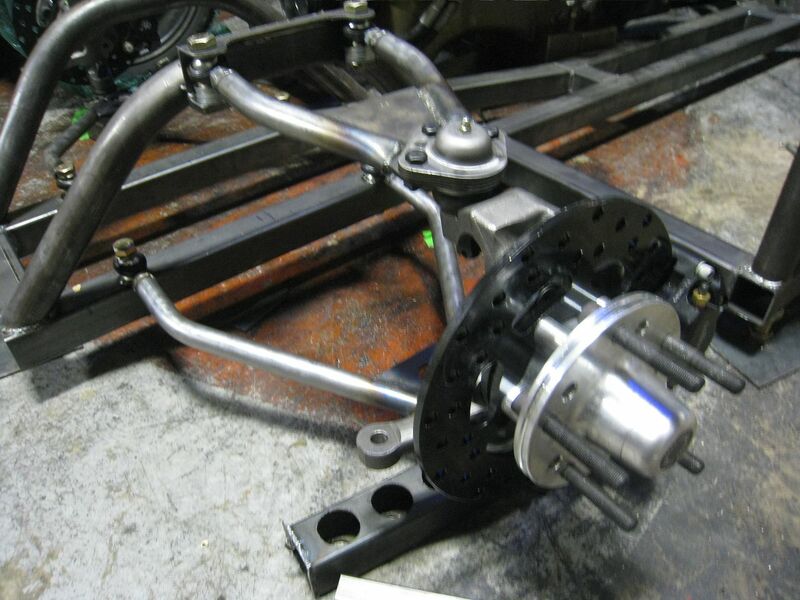 In order to have removable steering arms that could also be shortened in case I need a tighter turning circle, I purchased a set of Wilwood Pro Spindles. 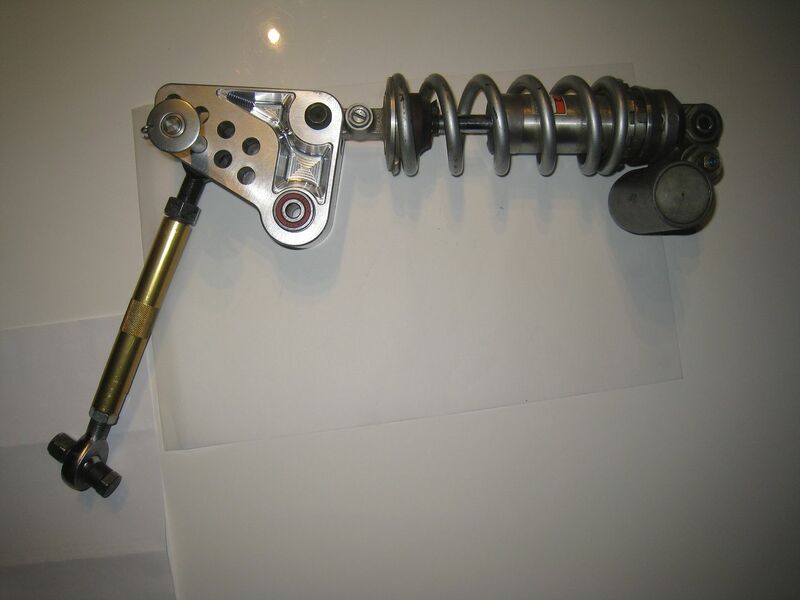 They can be front or rear steer and have bolt-on steering arms, perfect, I thought. 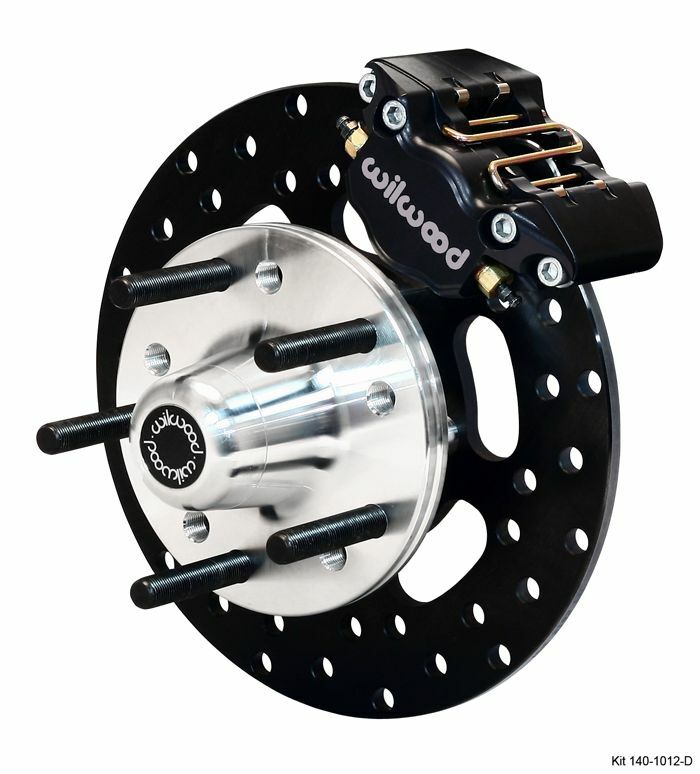 They arrived today and I was pretty excited until I discovered that the Wilwood brake kit I purchased would not bolt onto the new Wilwood spindles! 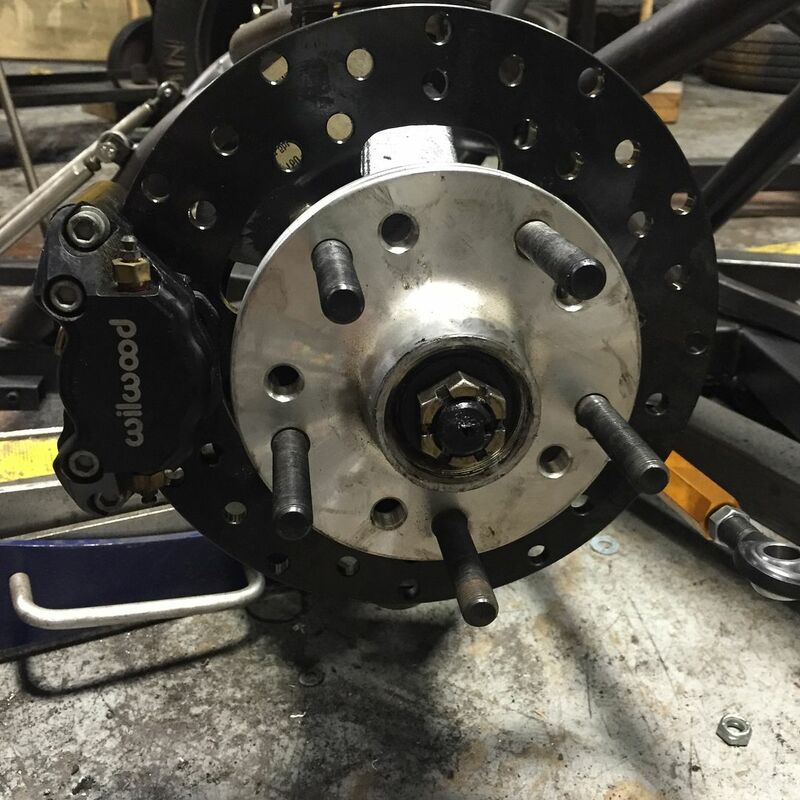 To be clear, I have a complete Wilwood brake kit for a Mustang II that bolted right up to the aftermarket drop spindles I was using, but they will not bolt onto the Wilwood drop spindles. I called their tech line and they don't make a bracket that will get the two items to play nicely with each other. 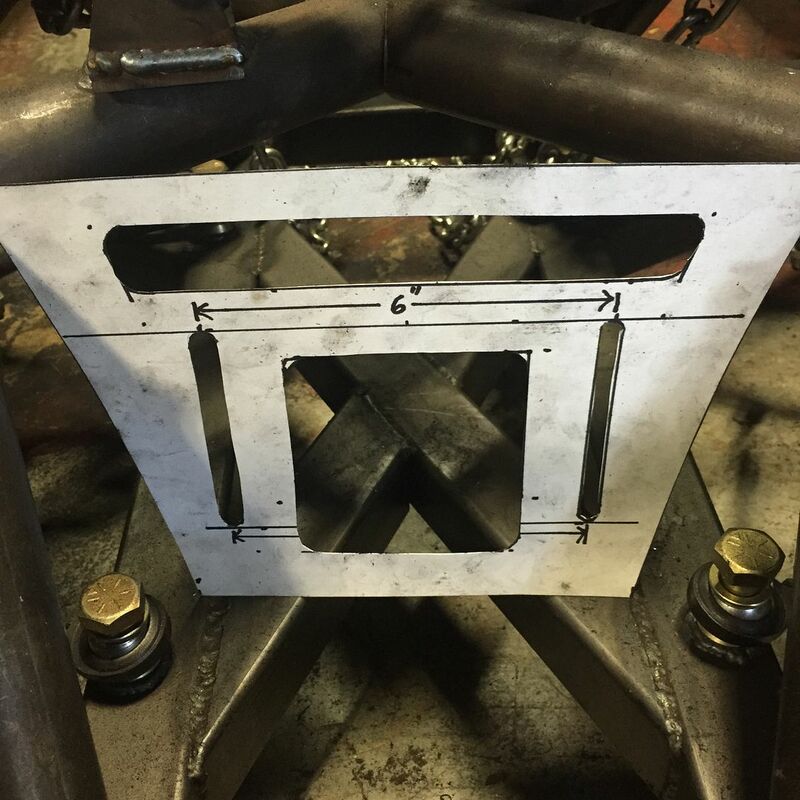 I used the old bracket as a template and plasma cut a new one. A lot of trimming, drilling and grinding later, I had something that works. 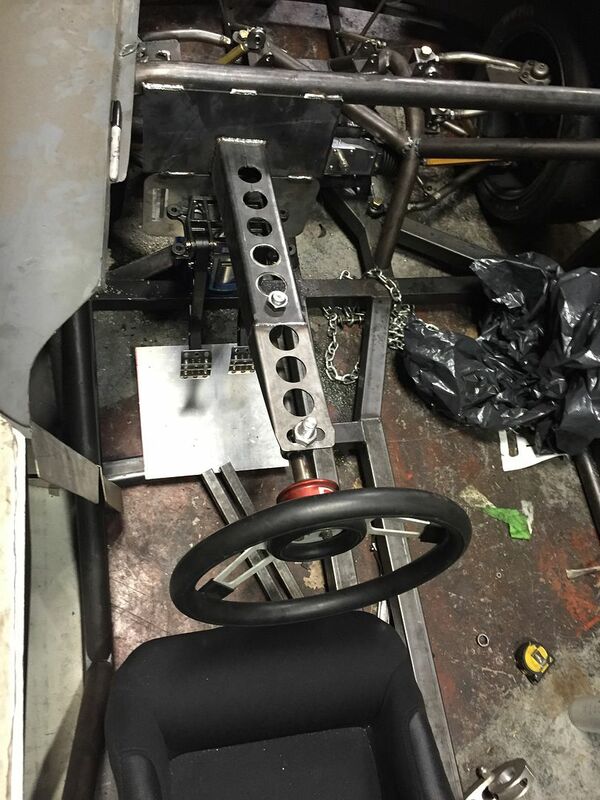 Once I bolted the rack to the bracket and hooked up the steering arms, i had steering. 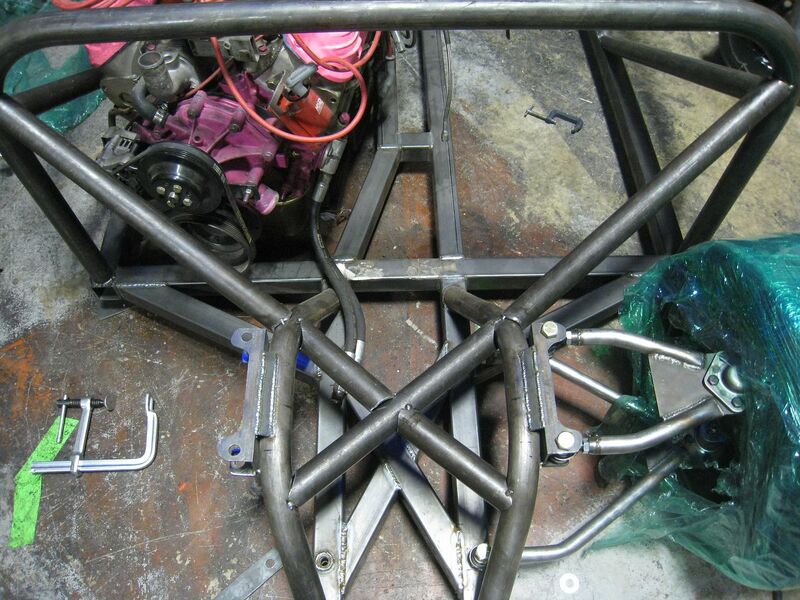 The height of the rack and the height of the rod ends are all adjustable so I should be able to be bump steer free. 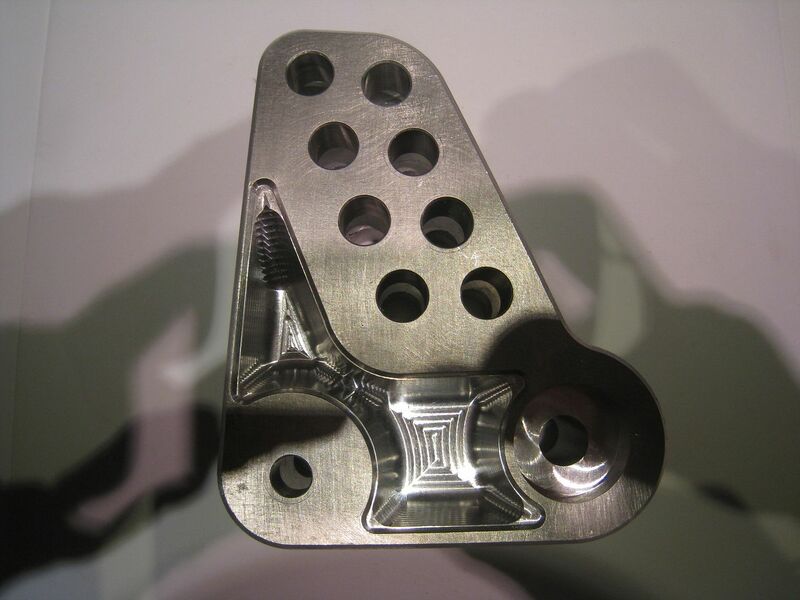 I assembled the pedals around the mounting plate then clamped the whole thing to some scrap pieces to get the position perfect. 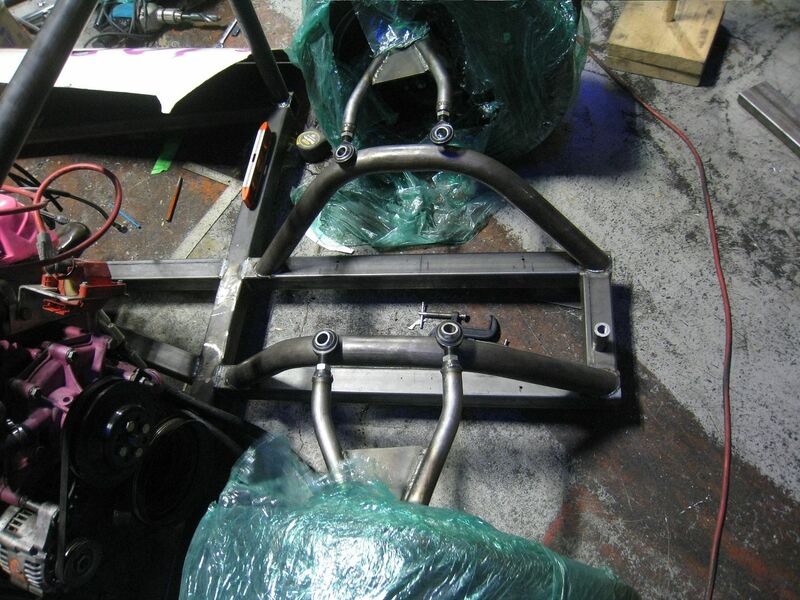 I cut down some square tube to make this super long steering column support. It doesn't weight very much, doesn't get in the way of anything and is stiff so I'm happy with it. 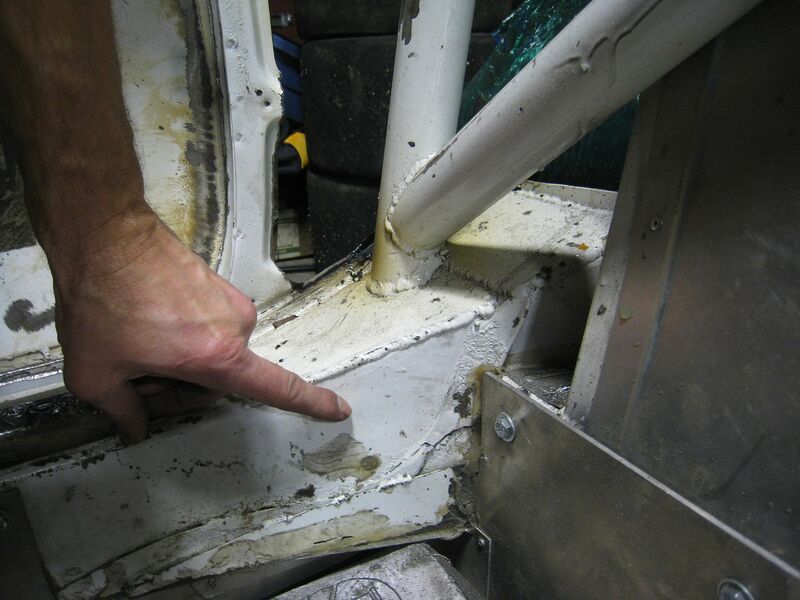 It also has 2 inches of adjustment just by moving the Heim joints that hold the column up or down. 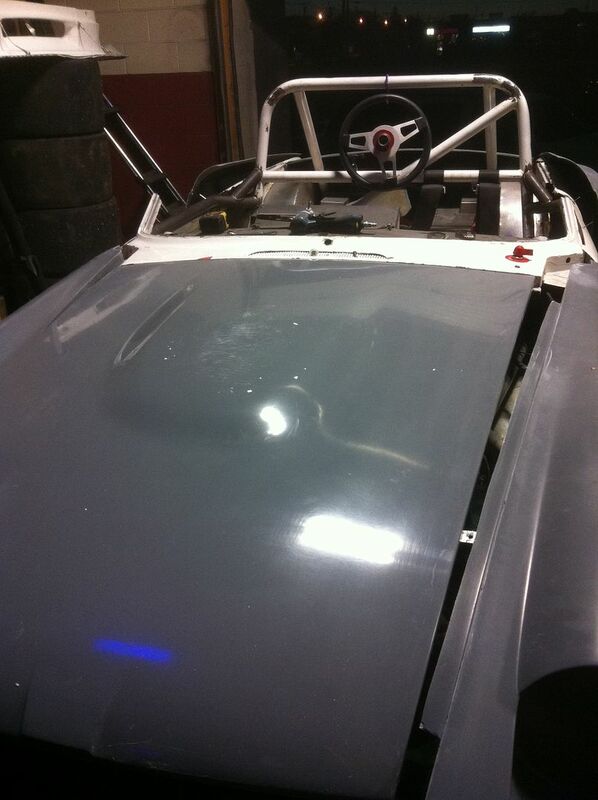 I also started making a cowl out of aluminum sheet that goes between the hood (bonnet) and the steering wheel. It's not quite right visually, I need to add a shortened windscreen or little humps plus it needs a place for the digital dash I will be installing. The problem with a windscreen is that I sit very low in the car and the hood is very long, so anything above the level of the hood gets in the way of seeing cones. 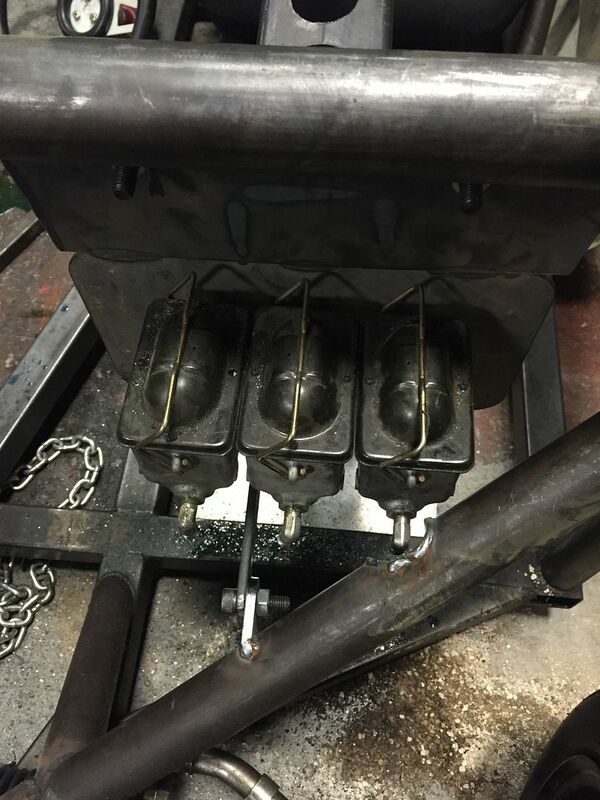 I realized that access to the master cylinders would be greatly enhanced by going from a weld-on mount to a bolt-on, so I switched if over today. I wanted the cowl area to look better and while poking around looking for something to use as a template to cut a curve into it, I found the original cowl. After cutting off all the excess metal, it doesn't weigh much more than the aluminum one and looks a lot better. Here are some pics during the trial fitting and before all the trimming, it looks even better now. I started to put the rear diff in today. As you can see, it's shifted quite a bit over to the passenger side. 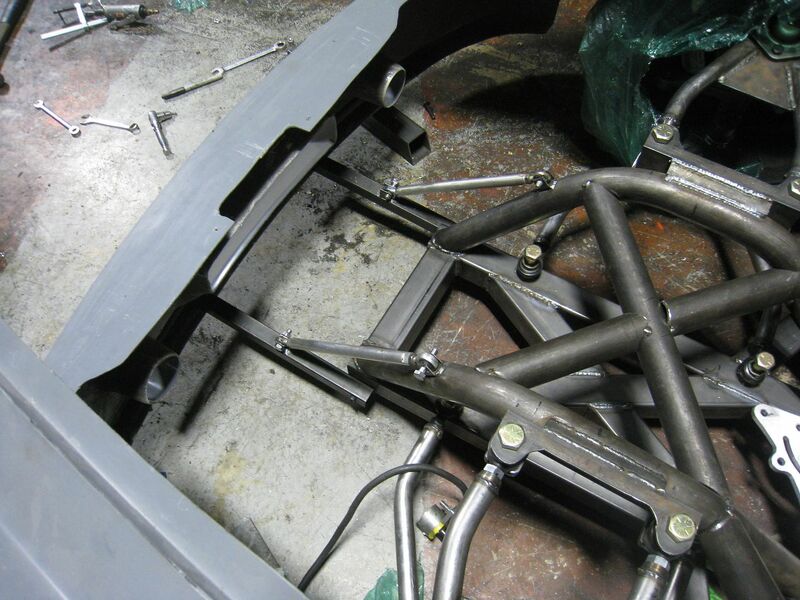 I have to get it situated perfectly then weld on the necessary brackets for the control arms and panhard. $hit got real today. 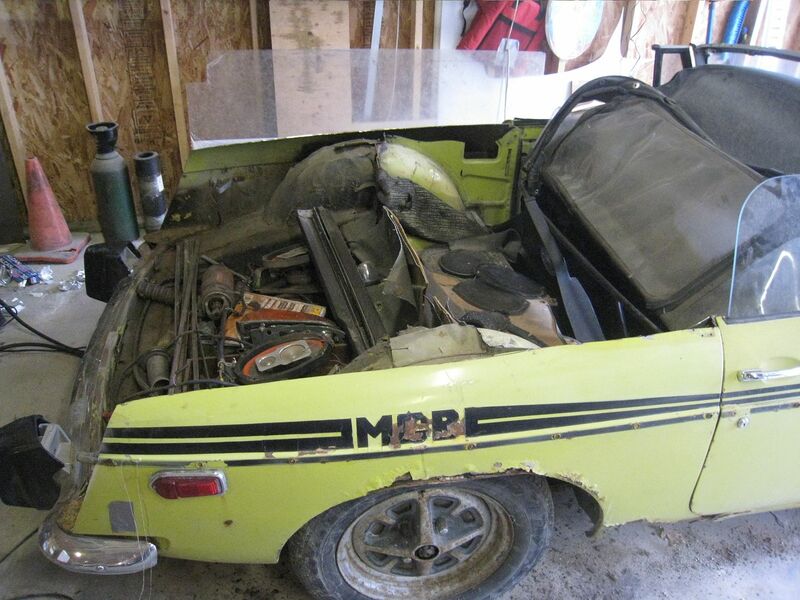 I went to the salvage auction and bought a whole car just to get my hands on it's engine. 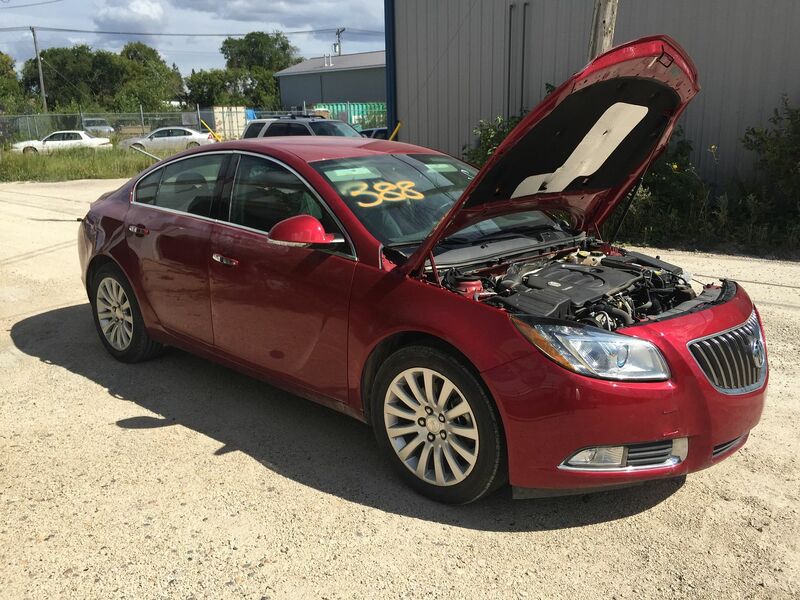 It's a 2013 Buick Regal Turbo with the 2.0 turbocharged LHU Ecotec engine. 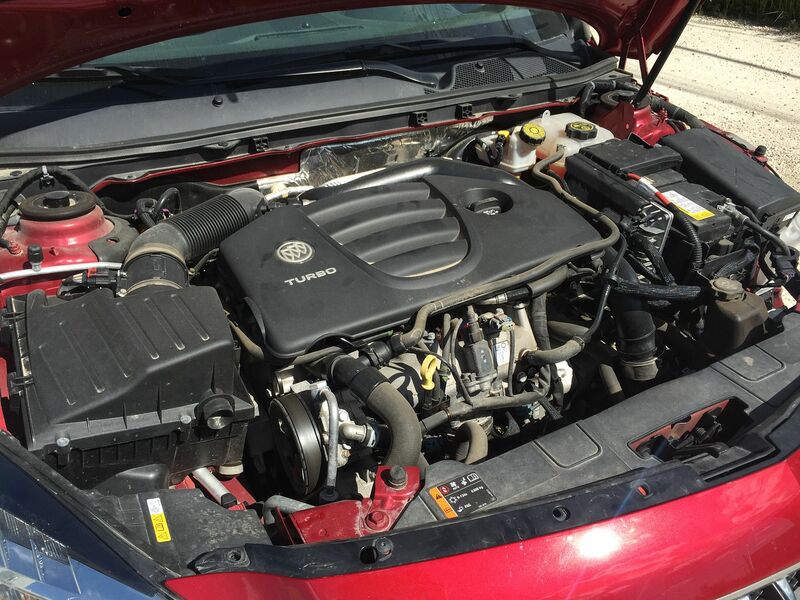 The car has only 18,000 km (12,000 miles) and runs awesome. 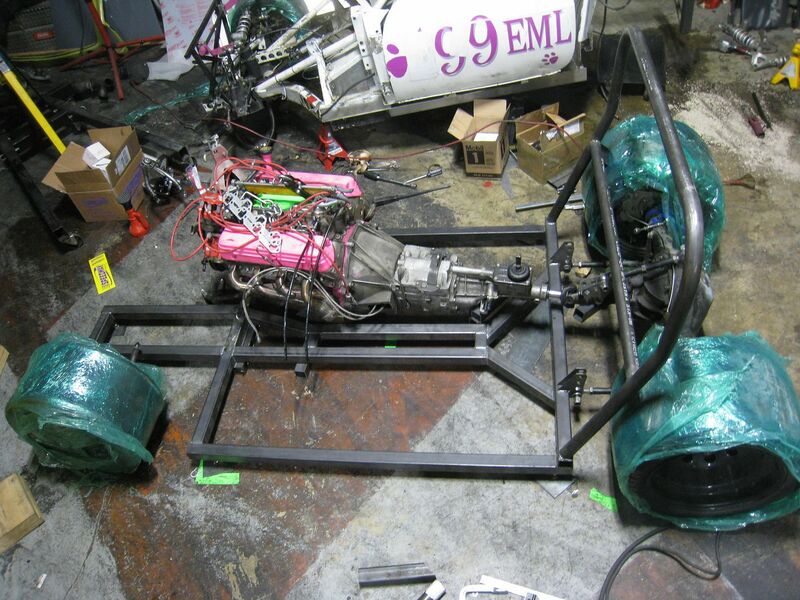 This engine is all aluminum and E85 compatible. 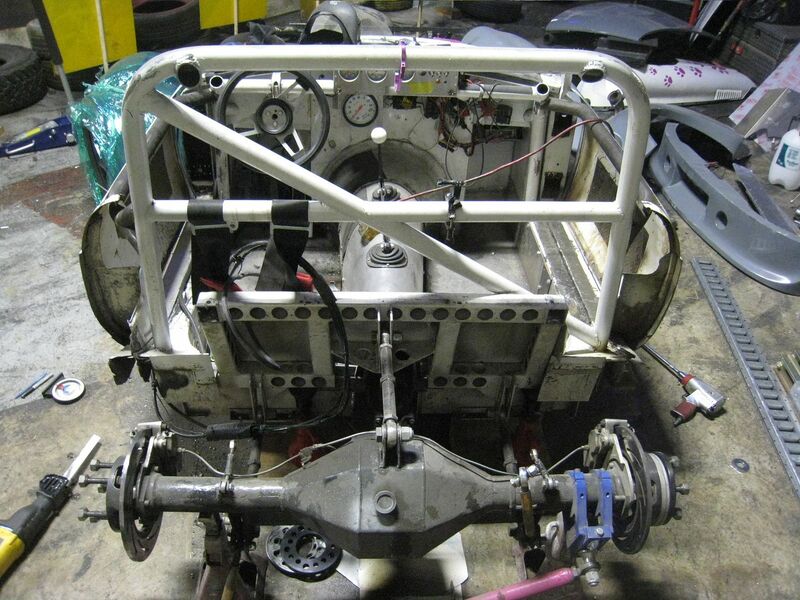 The engine will easily get 400 hp and it fits in a 2' cube. Edited 69 time(s). Last edit at 08/27/2015 04:52PM by loosecannon.